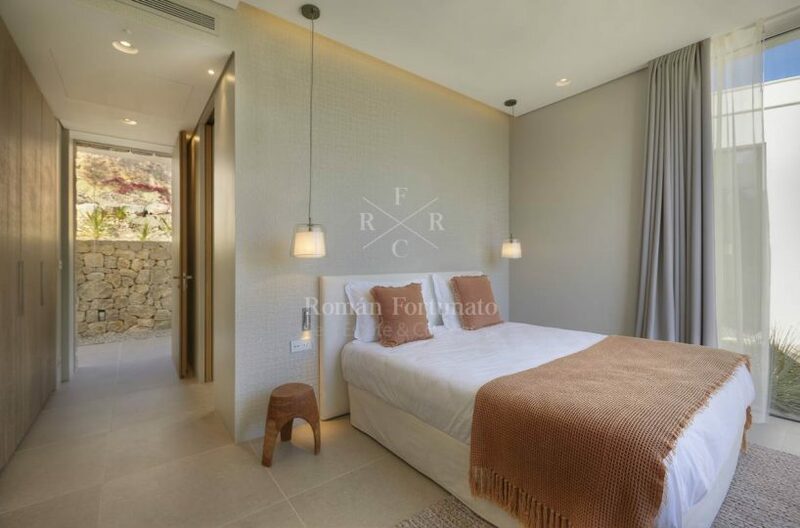 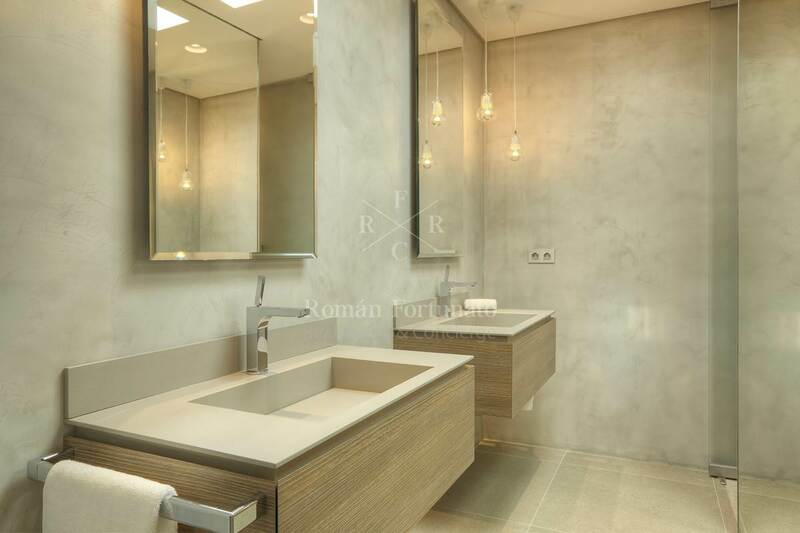 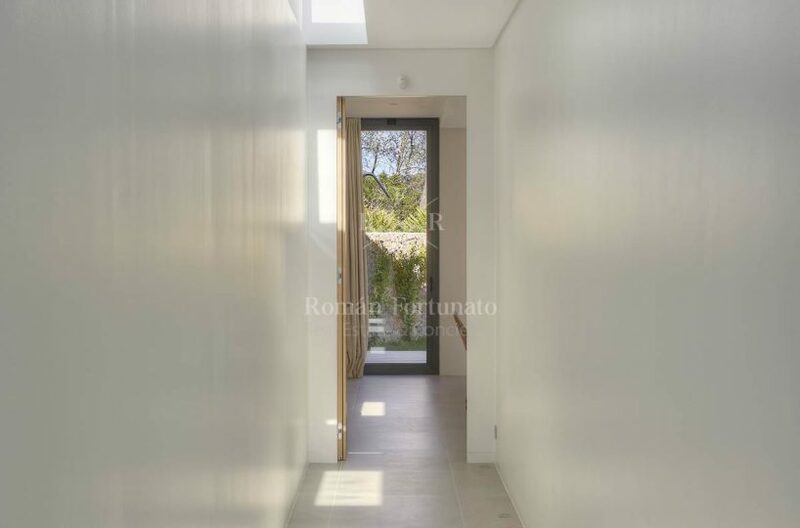 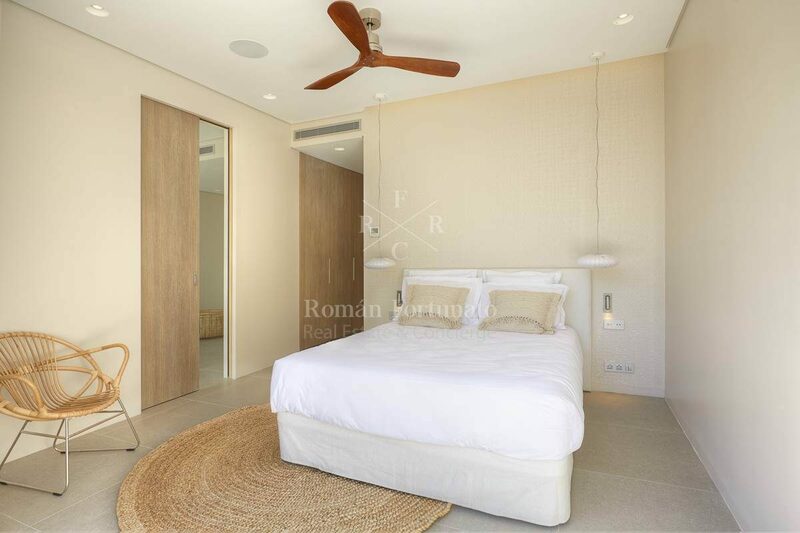 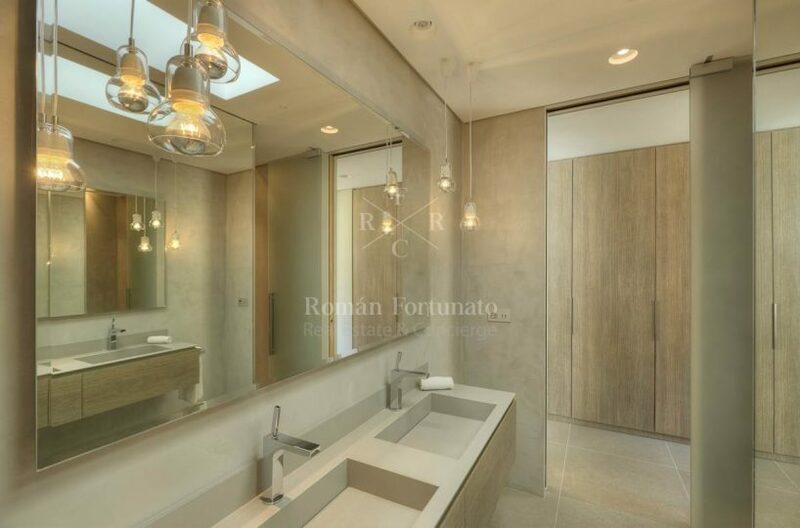 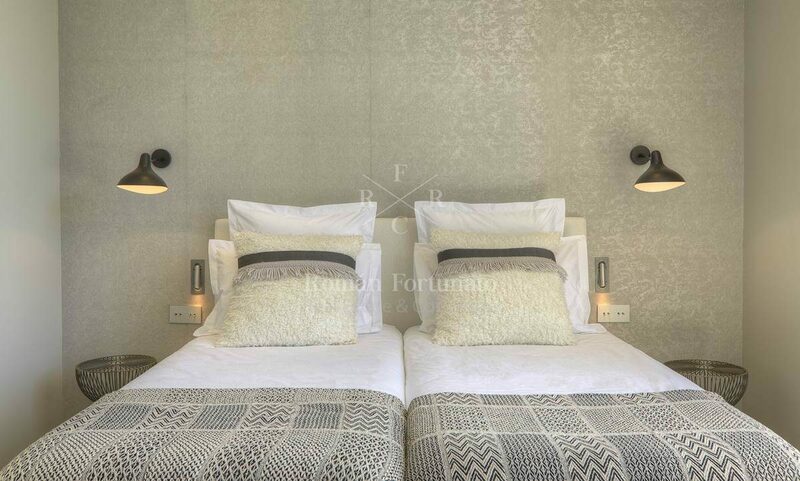 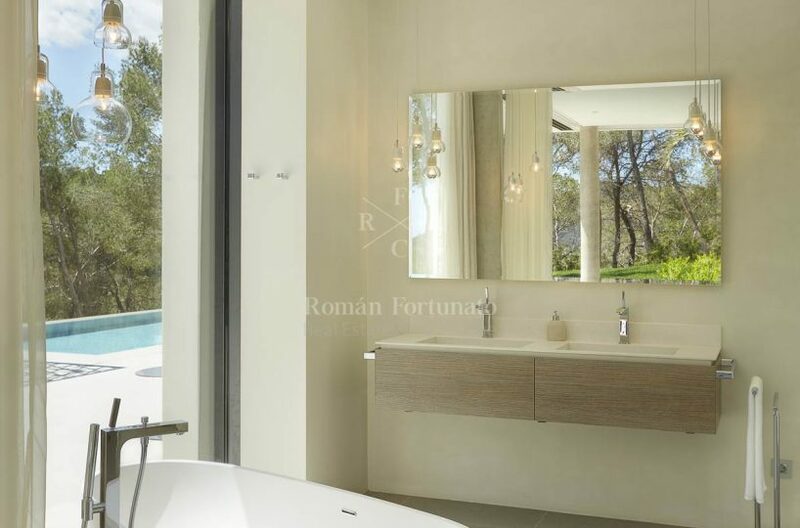 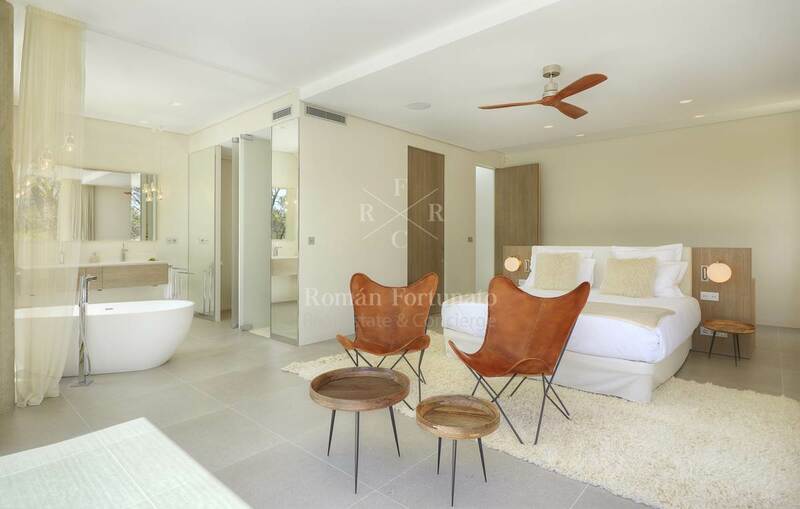 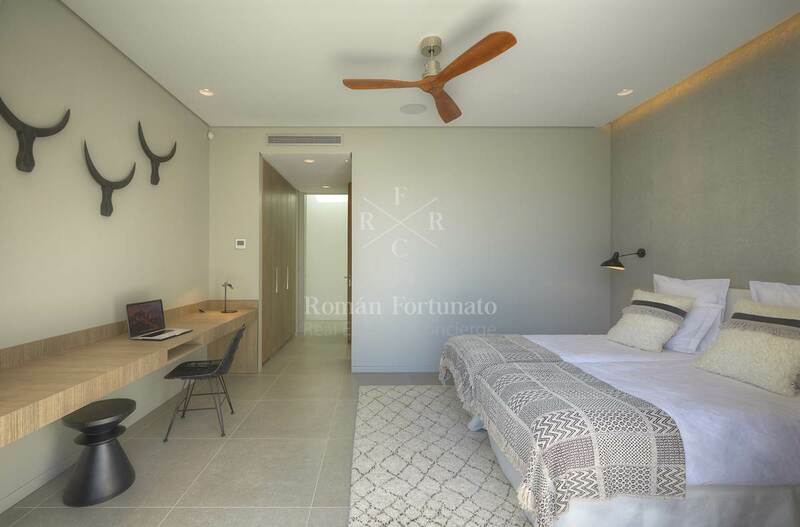 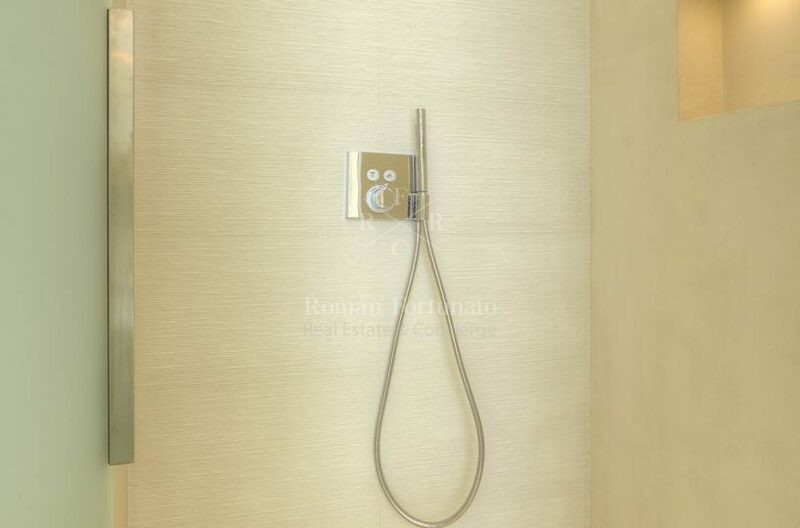 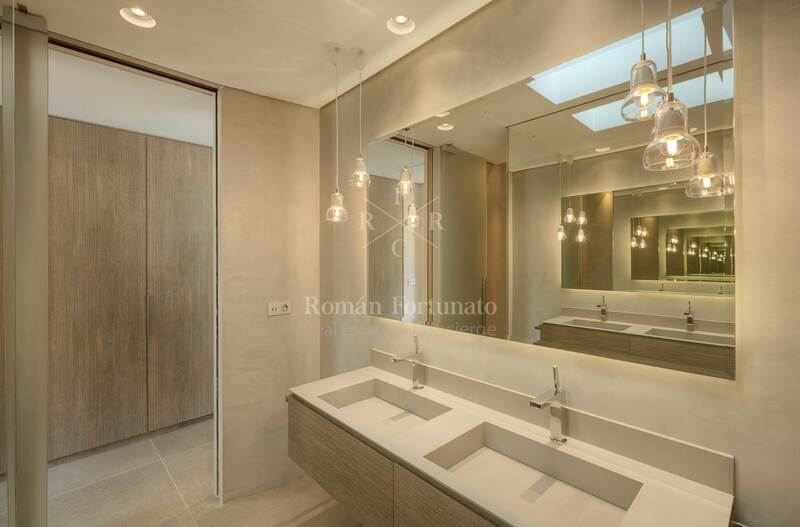 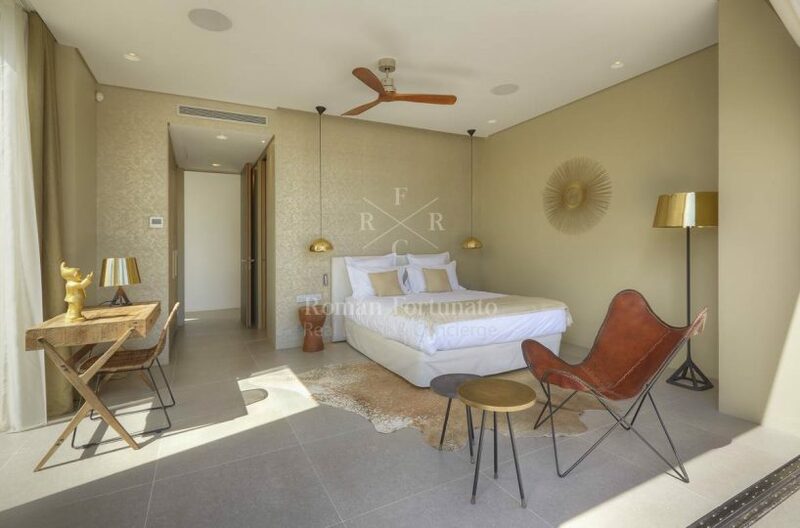 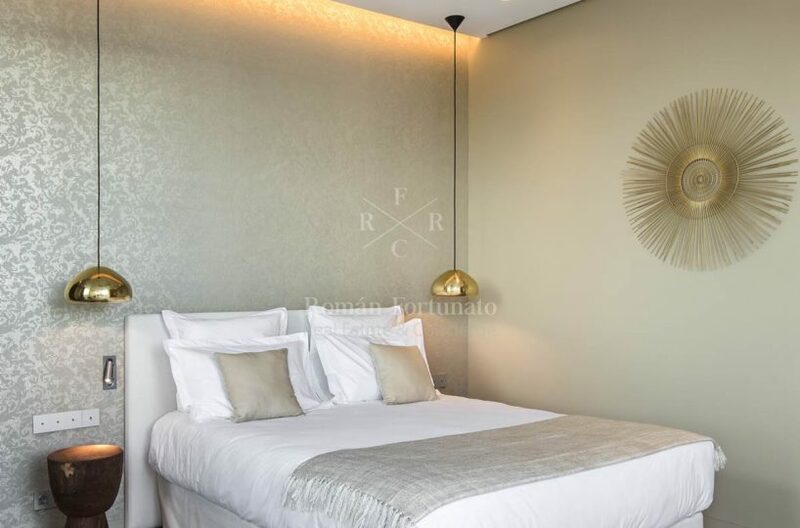 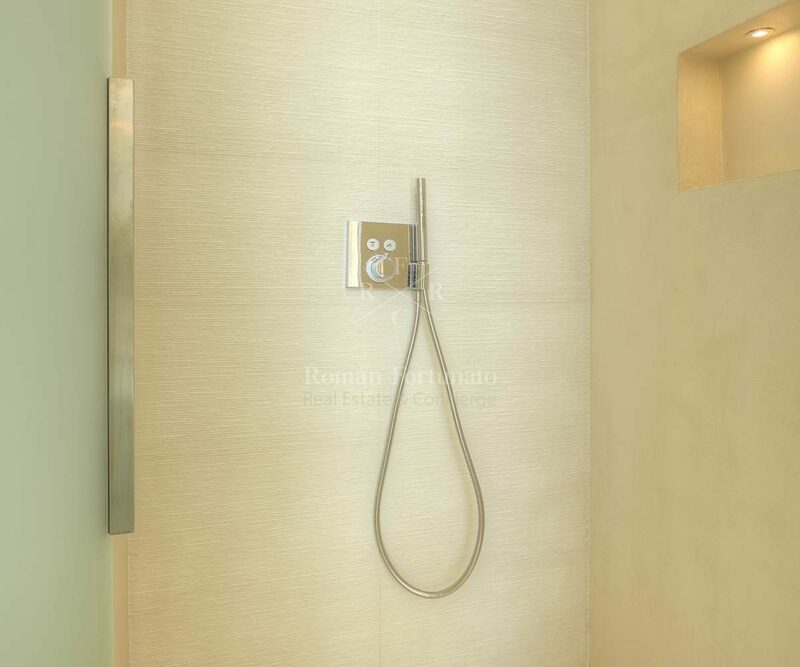 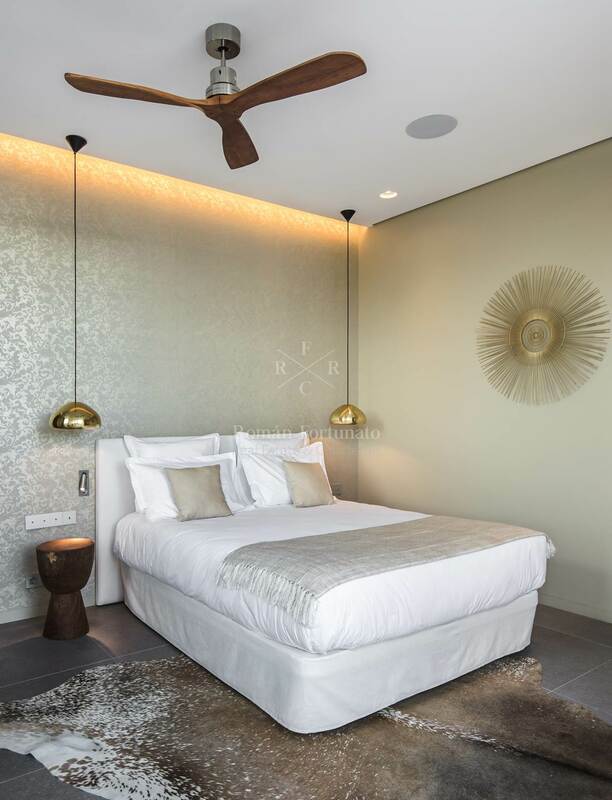 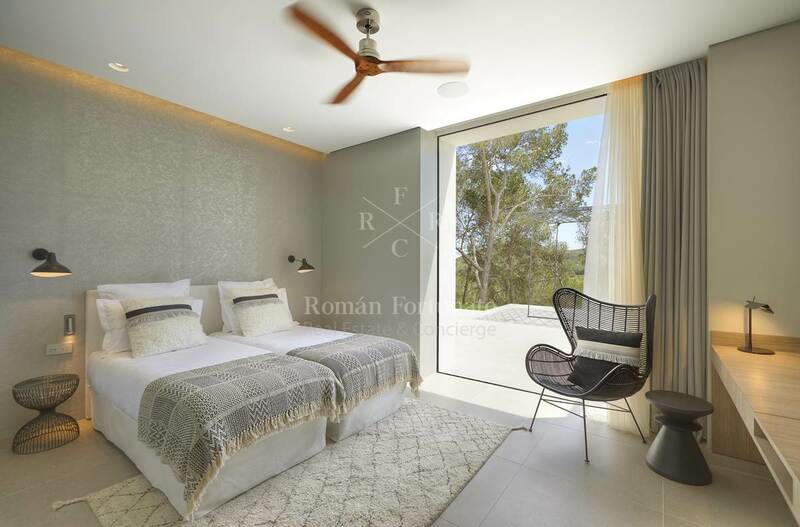 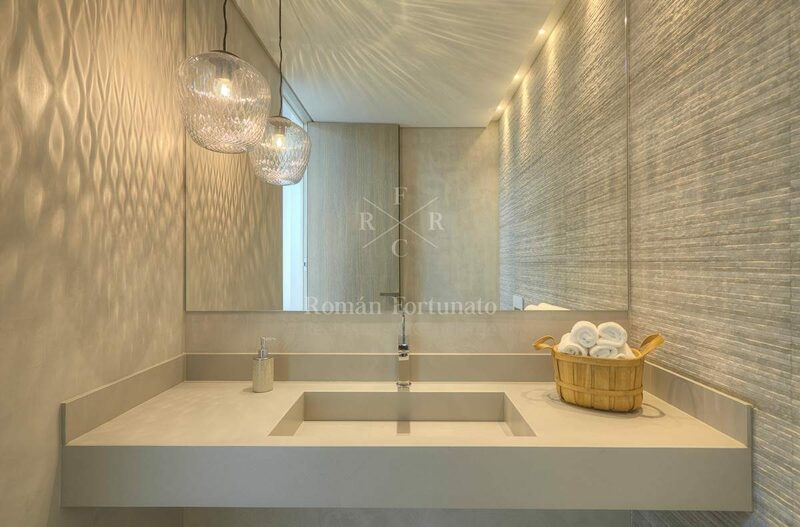 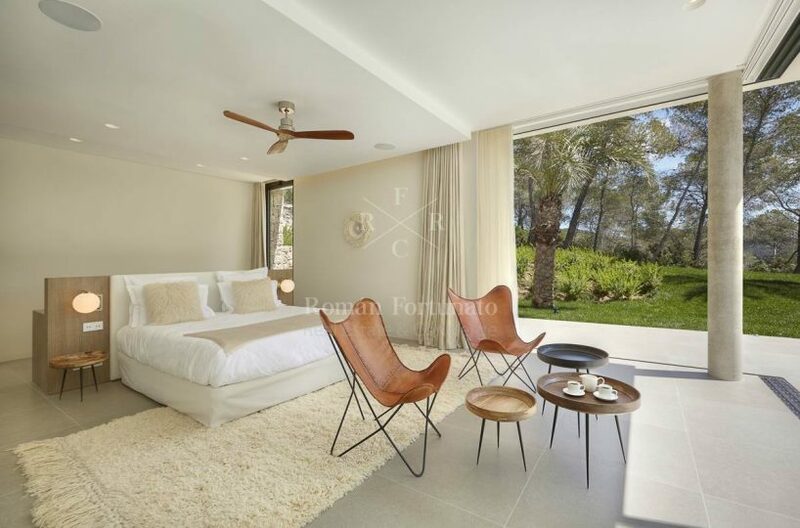 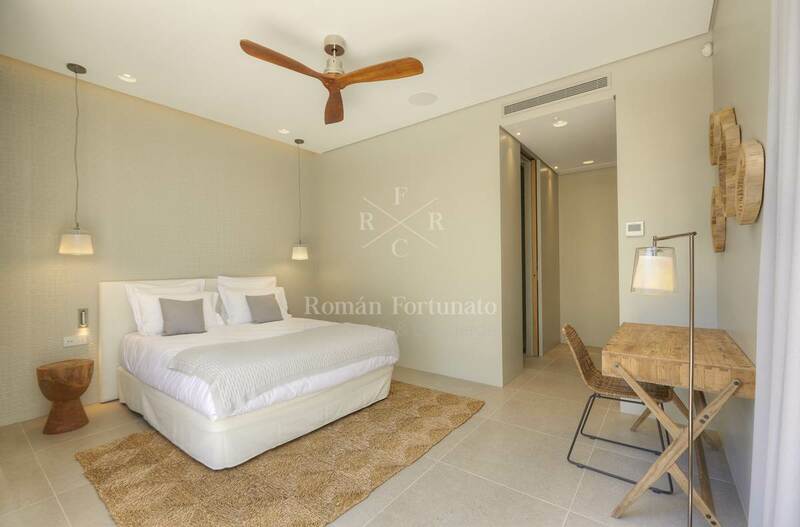 Every bedroom has been spaciously designed with warm lighting fixtures, detailed woodwork wardrobes, desks, cabinets in the bathrooms, top of the line integrated music system and acces to the gardens and pool área. 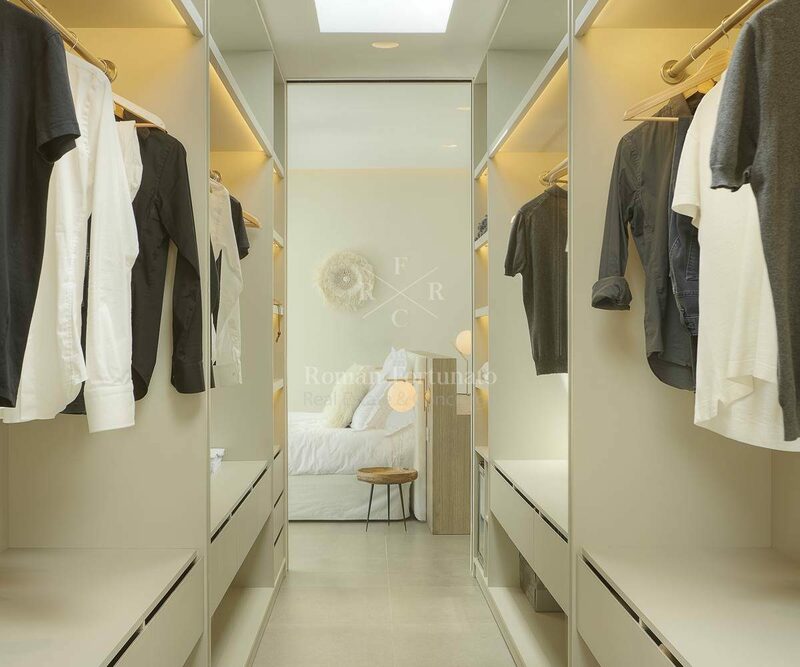 Master Suite 1: 55m2 king size bed, large dressing room, office with desk with make-up área and drawers, safe fridge hospitality tray, Nesspresso coffee machine and a kettle, integrated Sonos system throughout the room, shower and outdoor shower free standing bath tub,doublé sink with drawers, hairdryer, cosmetic products, toilet and separate bidet, Access to the terrace with distant views of the sea golf course and landscape. 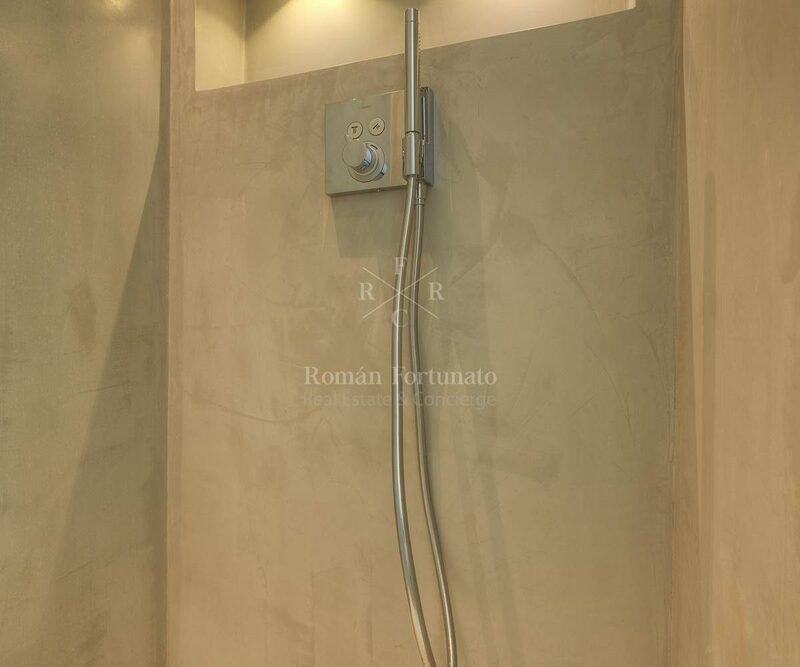 Suite 2: 30 m2. 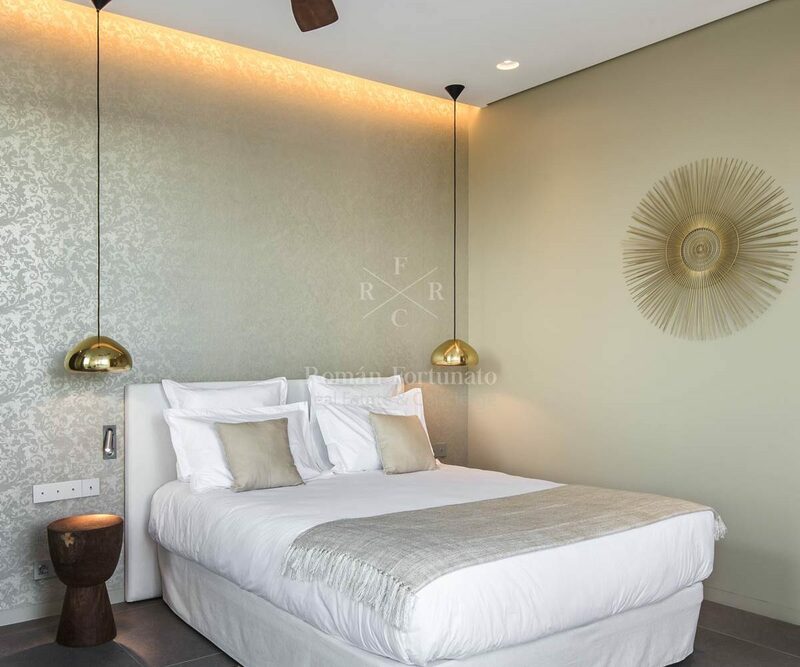 King size bed (can be separate into 2 single beds= office with make-up área, in boult dressing, safe, fridge hospitality tray, Nesspresso coffee machine and a kettle, integrated Sonos system throughout the room, shower, separate toilet, doublé sink with drawers, hairdryer, cosmetic products and acces to the outdoor terrace with ample lounge área (chairs and sunbeds) and views of the surrounding landscape and golf course. Suite 3: 30m2. 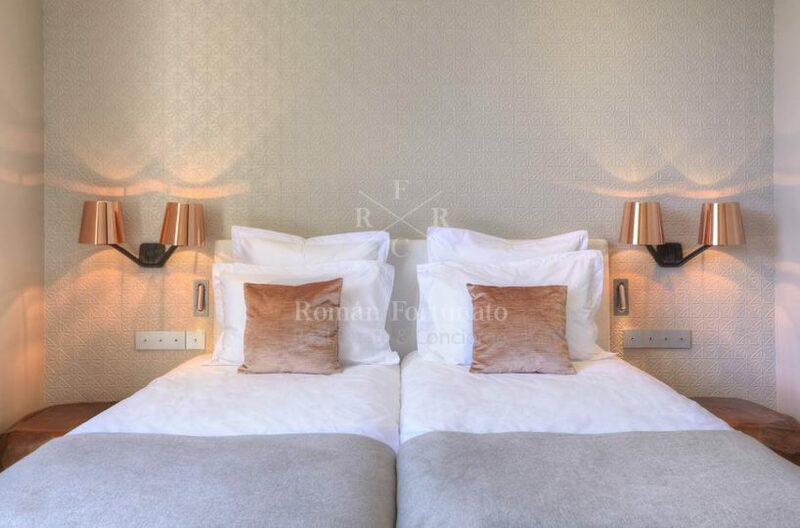 King size bed (can be separate into 2 single beds= office with make-up área, in boult dressing, safe, fridge hospitality tray, Nesspresso coffee machine and a kettle, integrated Sonos system throughout the room, shower, separate toilet, doublé sink with drawers, hairdryer, cosmetic products and acces to the outdoor terrace with ample lounge área (chairs and sunbeds) and views of the surrounding landscape and golf course. 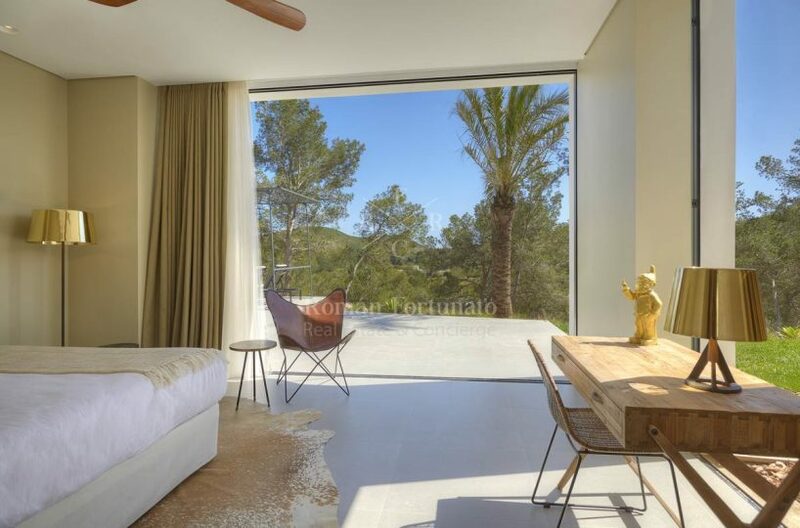 Suite 4: 32m2 queen size bed, office with make-up área, in-built dressing, safe fridge hospitality tray , Nesspresso coffee machine and a kettle, integrated Sonos system throughout the room, shower, separate toilet, doublé sink with drawers, hairdryer, cosmetic products and acces to the outdoor terrace with ample lounge área (chairs and sunbeds) and views of the surrounding landscape and golf course. 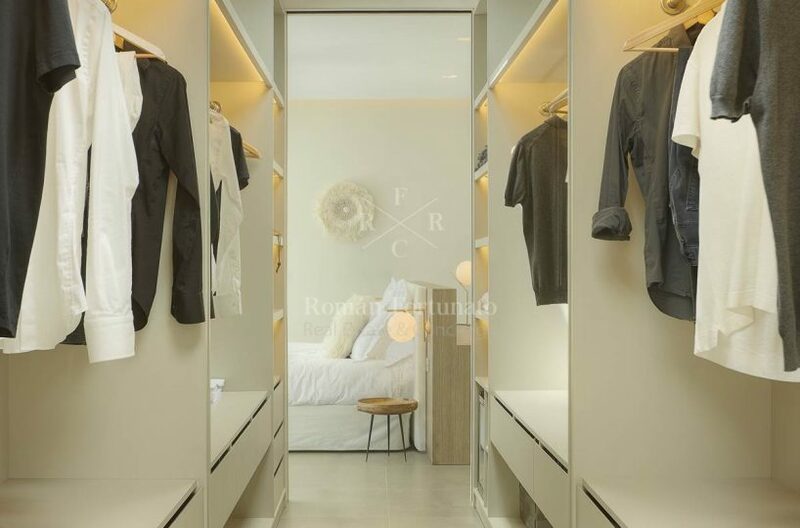 Suite 5: 30m2 queen size bed, office with make-up área, in-built dressing, safe fridge hospitality tray , Nesspresso coffee machine and a kettle, integrated Sonos system throughout the room, shower, separate toilet, doublé sink with drawers, hairdryer, cosmetic products and acces to the outdoor terrace with ample lounge área (chairs and sunbeds) and views of the surrounding landscape and golf course. 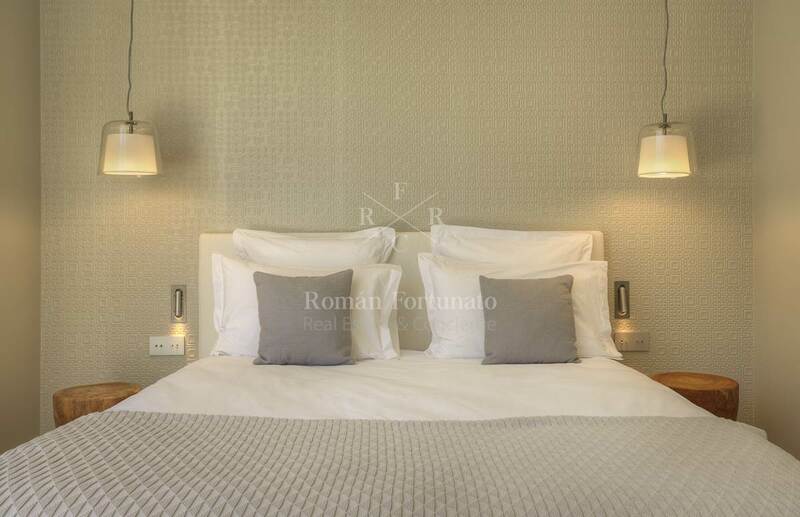 28m2 Queen size bed, = office with make-up área, in boult dressing, safe, fridge hospitality tray, Nesspresso coffee machine and a kettle, integrated Sonos system throughout the room, shower, separate toilet, doublé sink with drawers, hairdryer, cosmetic products and acces to the outdoor terrace with ample lounge área ( chairs and sunbeds) and views of the surrounding landscape and golf course. 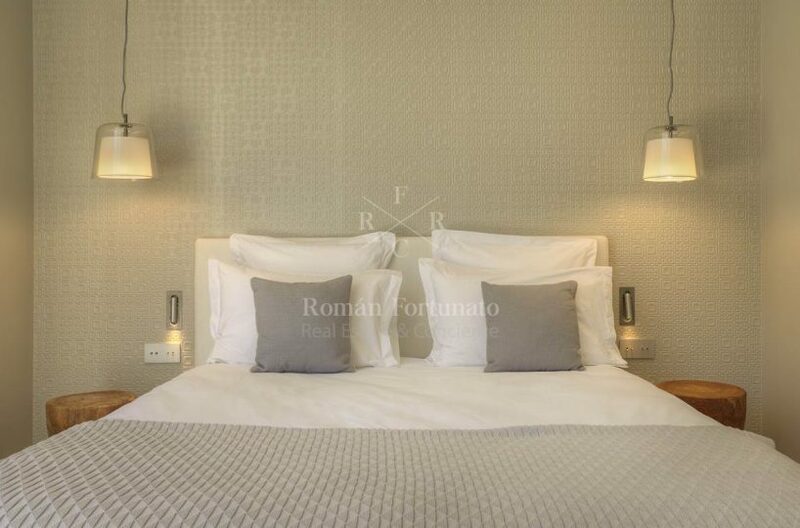 43m2m 30m2 queen size bed, office with make-up área, in-built dressing, safe fridge hospitality tray , Nesspresso coffee machine and a kettle, integrated Sonos system throughout the room, shower, separate toilet, doublé sink with drawers, hairdryer, cosmetic products and acces to the outdoor terrace with ample lounge área ( chairs and sunbeds) and views of the surrounding landscape and golf course. 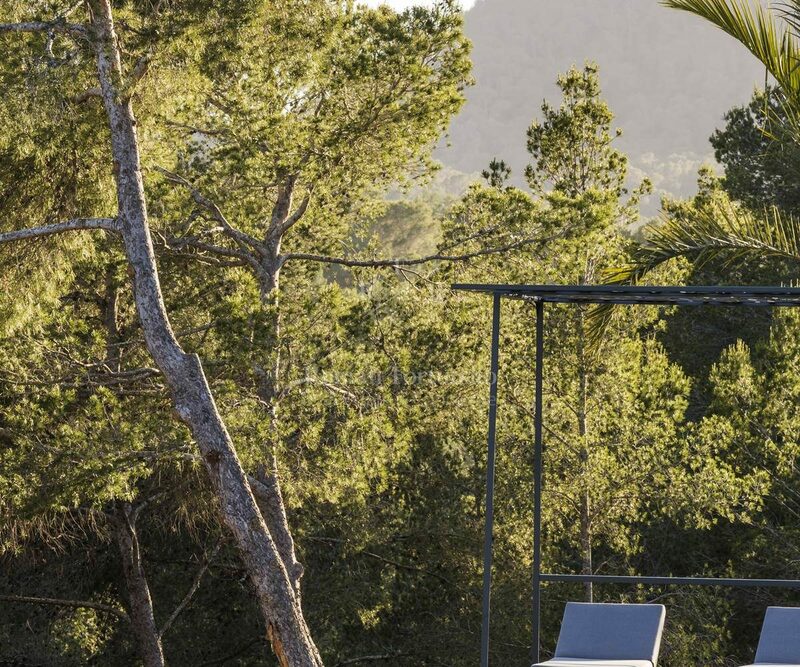 Each bedroom living room and outdoor áreas have Access to the integrated Sonos system, where one can Access theur own playlists using the wifi network. 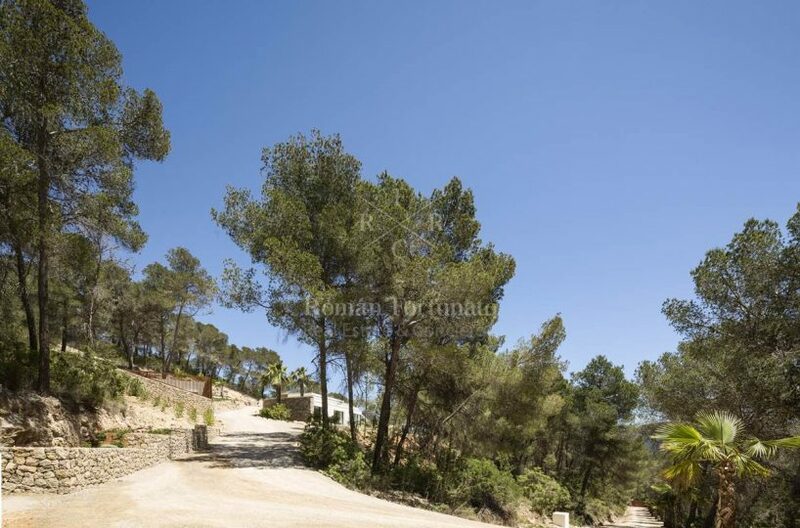 The property can comfortably accommodate 6-8 cars in front of the house with space for an extra 15 on the grounds. 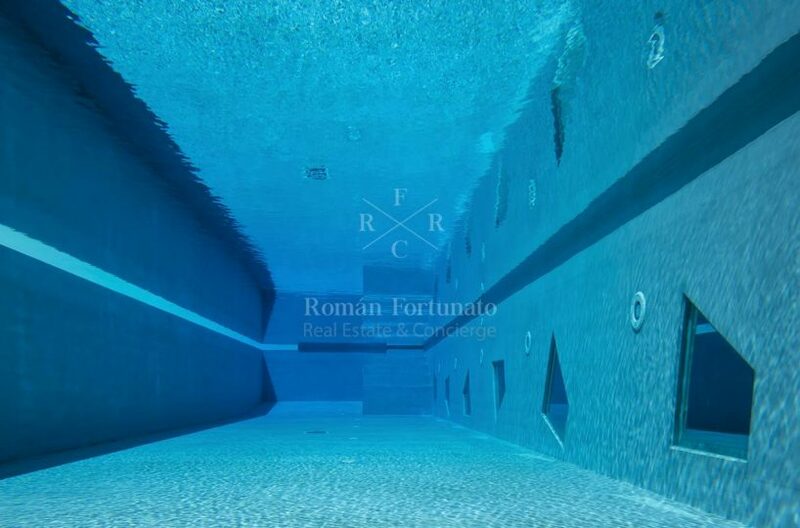 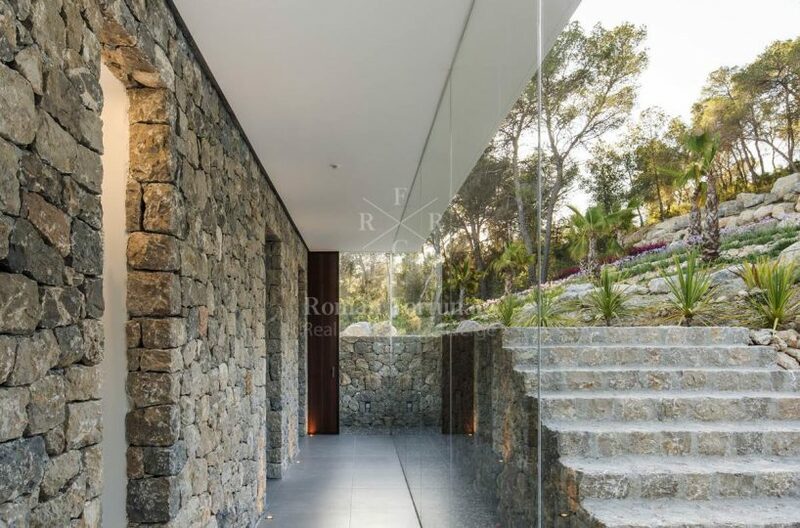 Most importantly THE ROCK STAR is secure and benefits from having no immeditate neighbours overlooking the property. All rooms are connected to the alarm syste,. 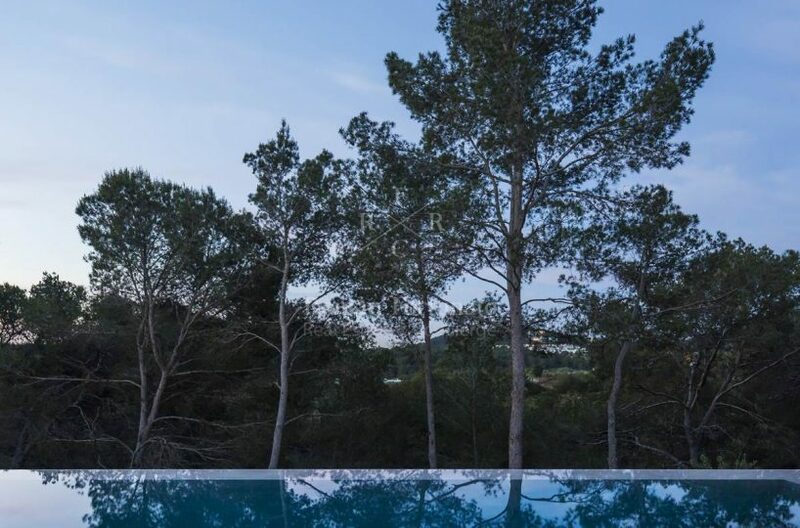 Tjere are 6 outdoors cameras protecting the property, all of which are connected to the WIFI system and can be monitored by any Smart-phone. 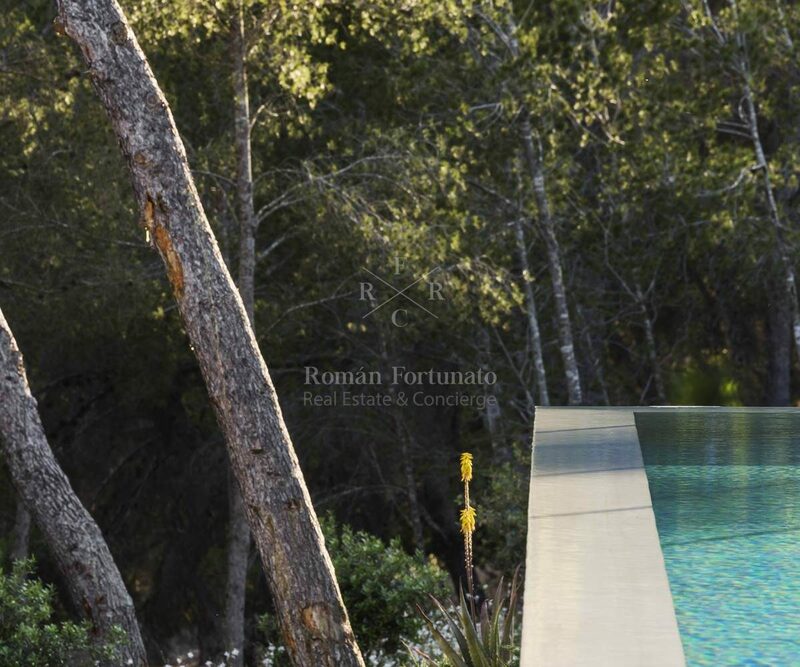 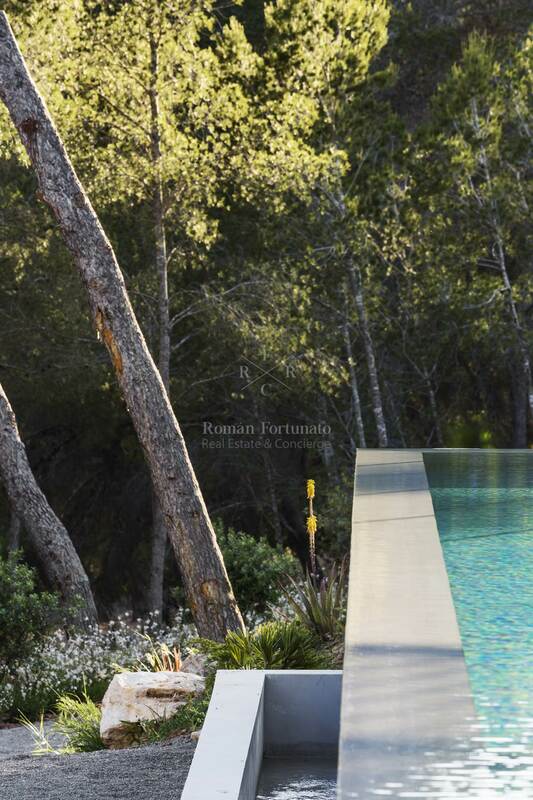 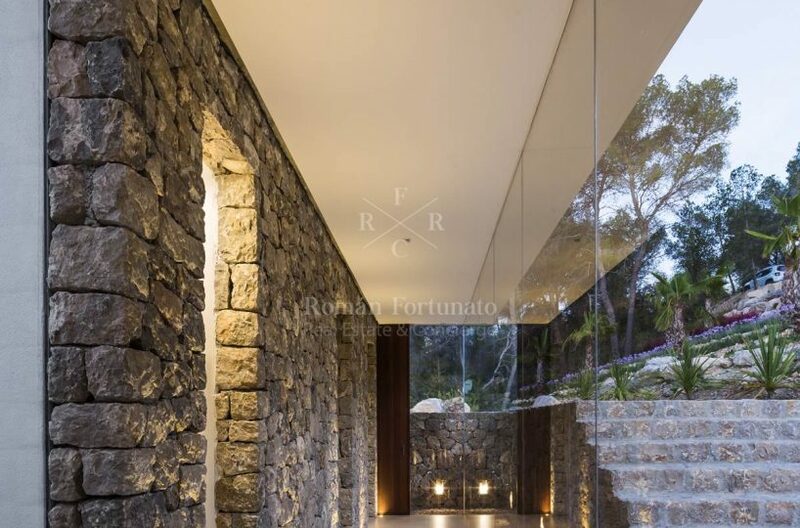 Villa Rock Star is a luxury villa exclusively designed in 2017 bu a renowned parisinian Architect. 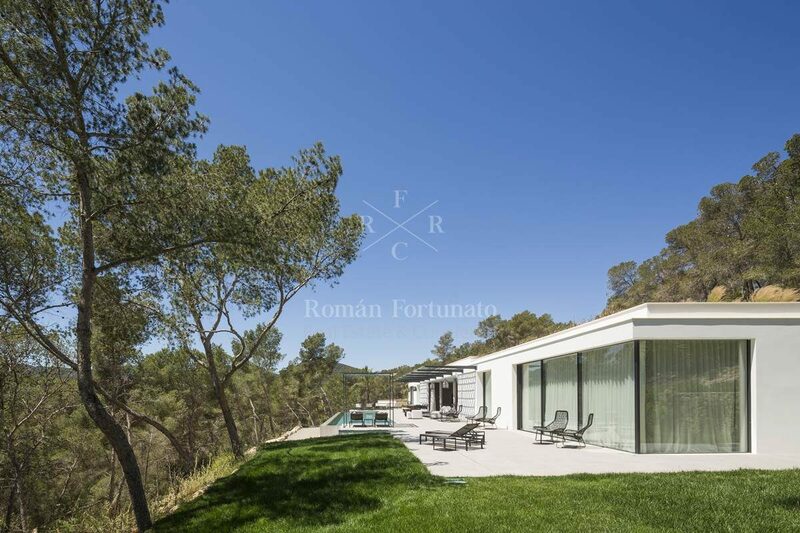 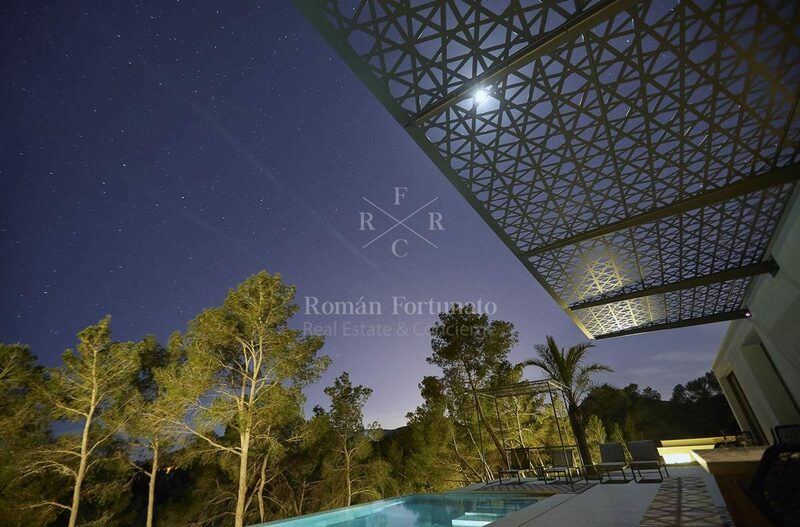 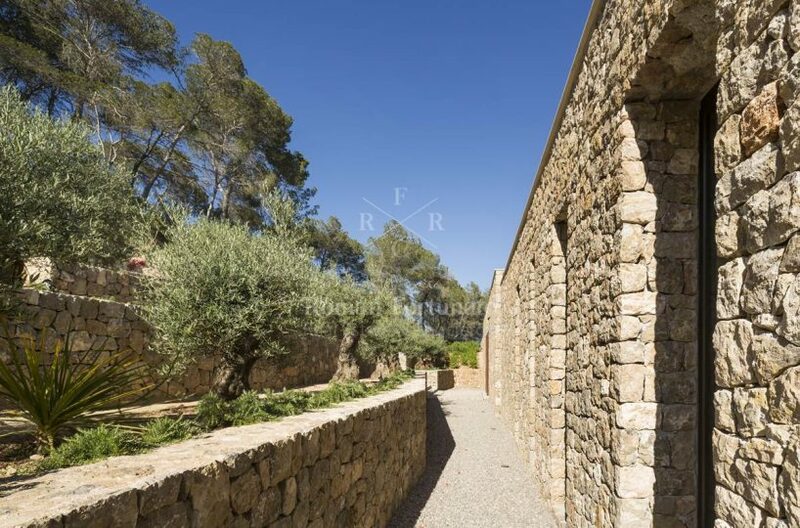 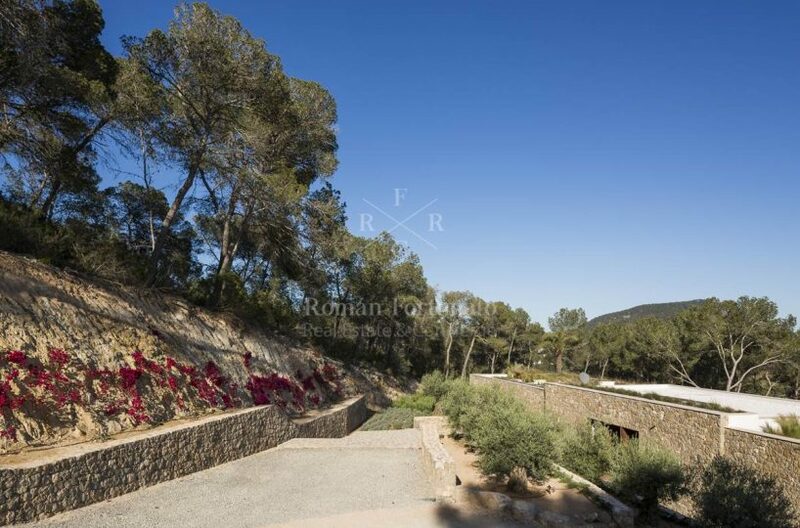 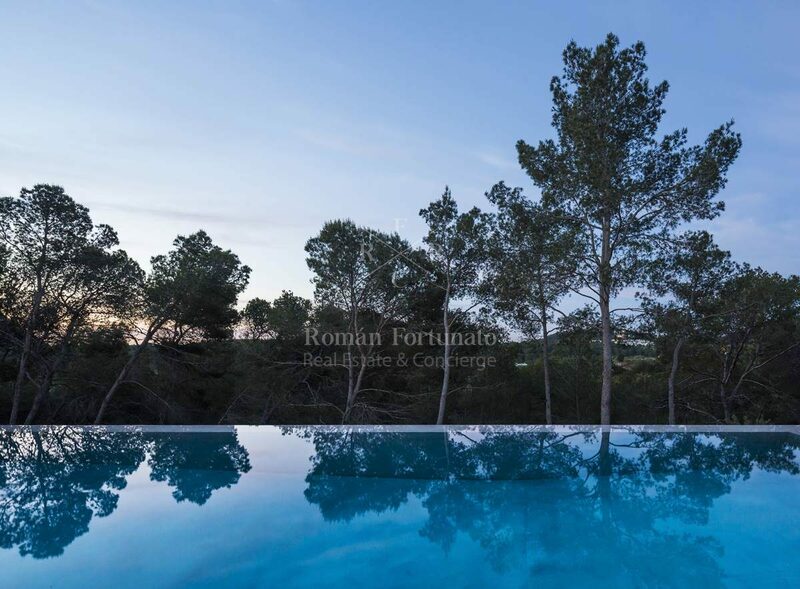 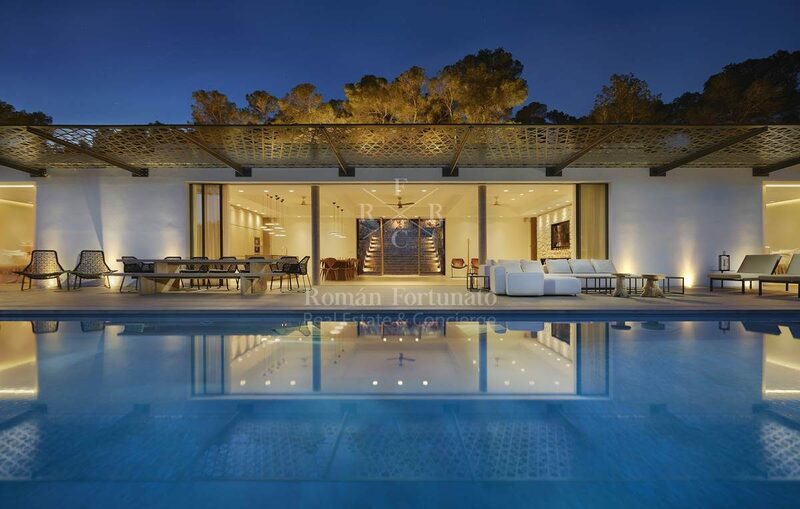 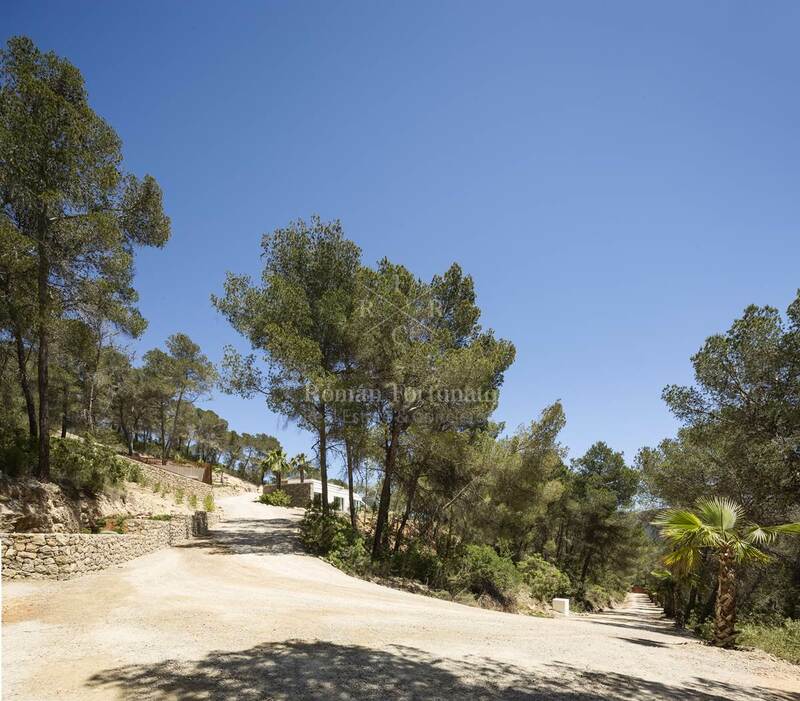 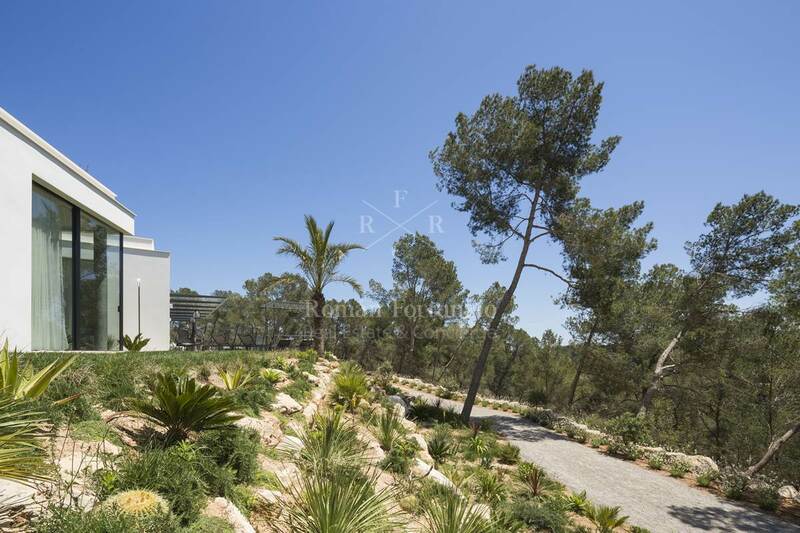 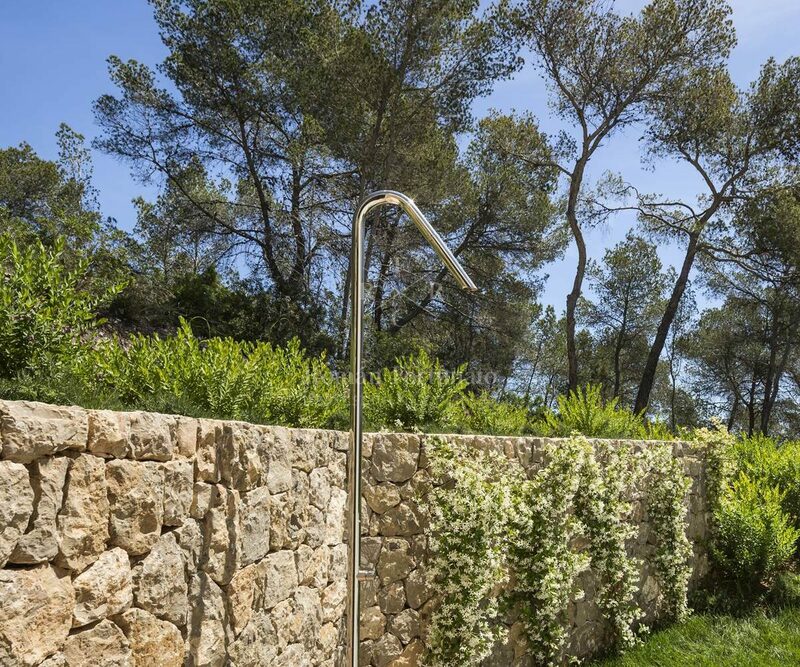 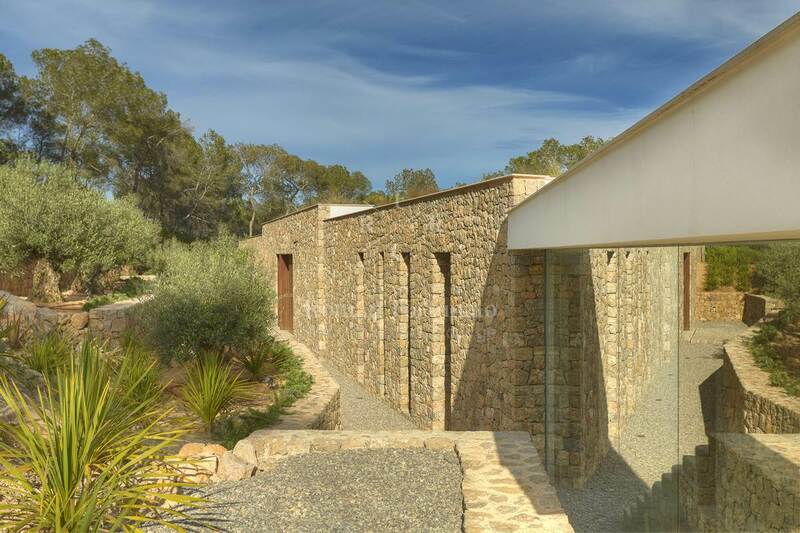 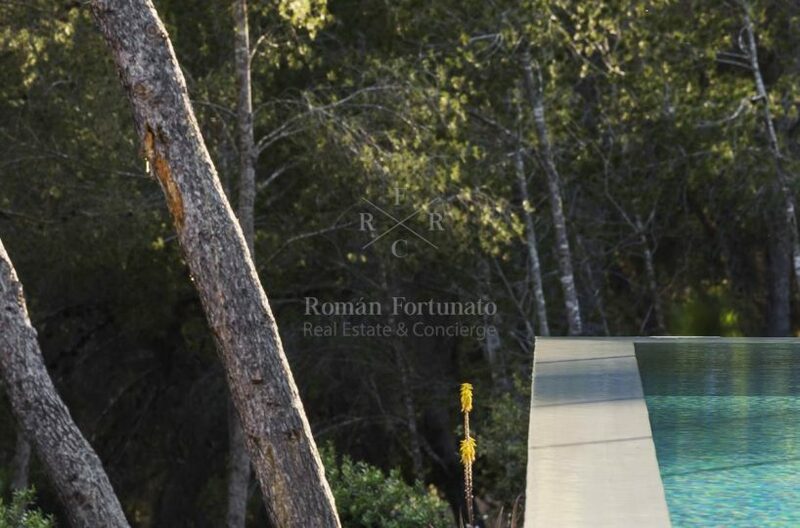 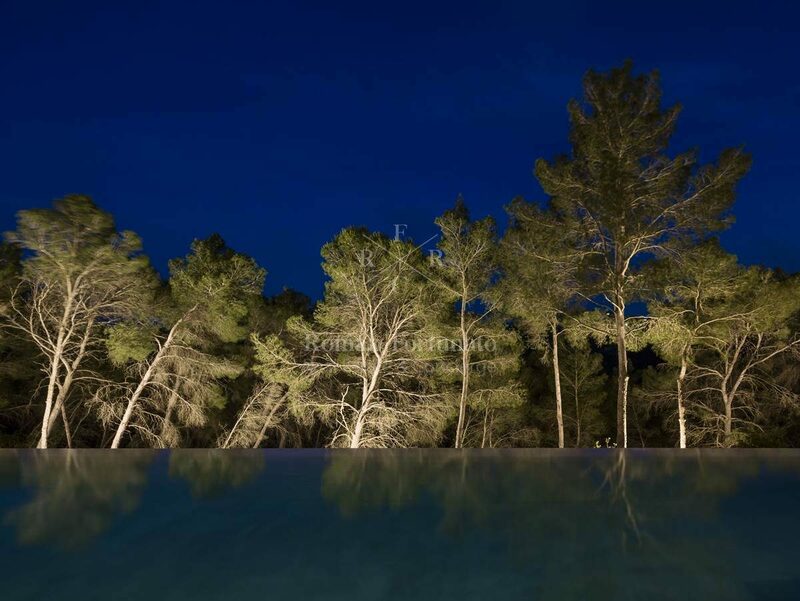 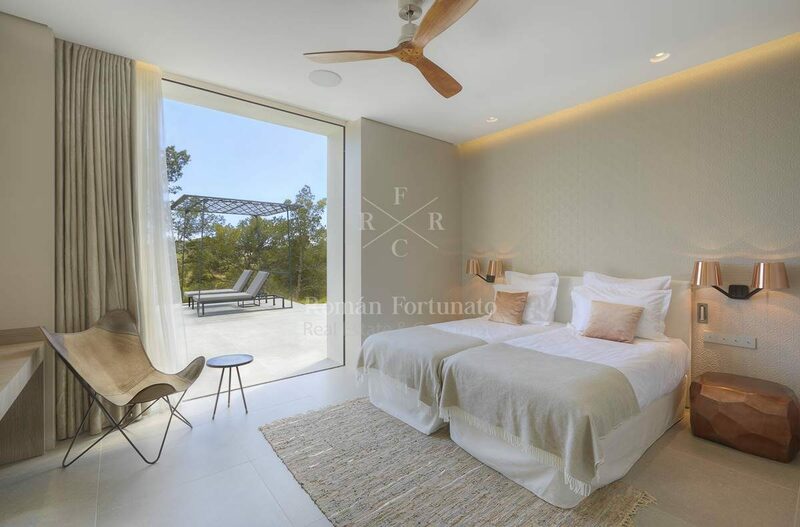 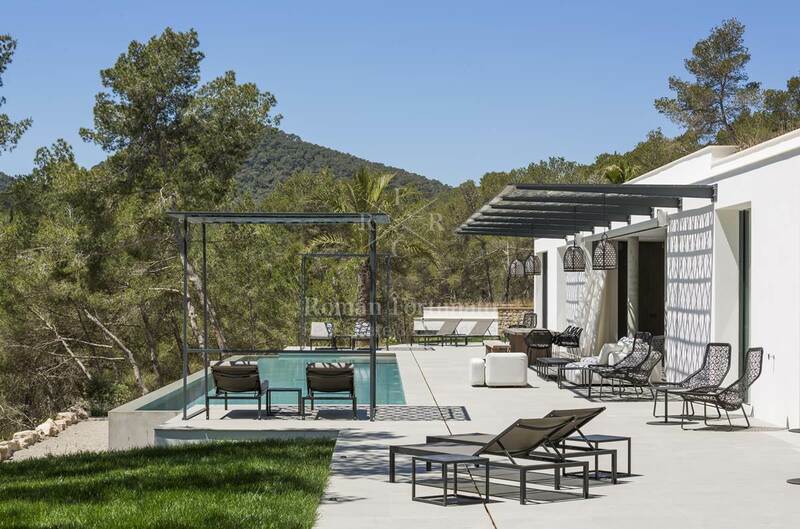 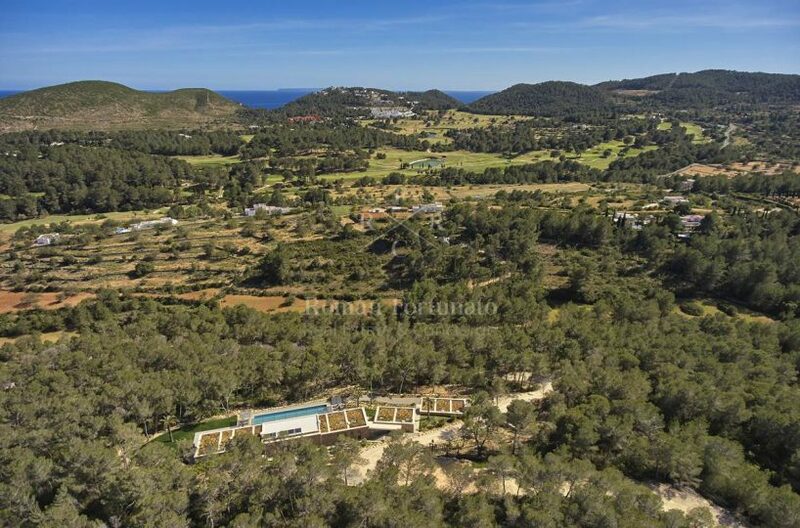 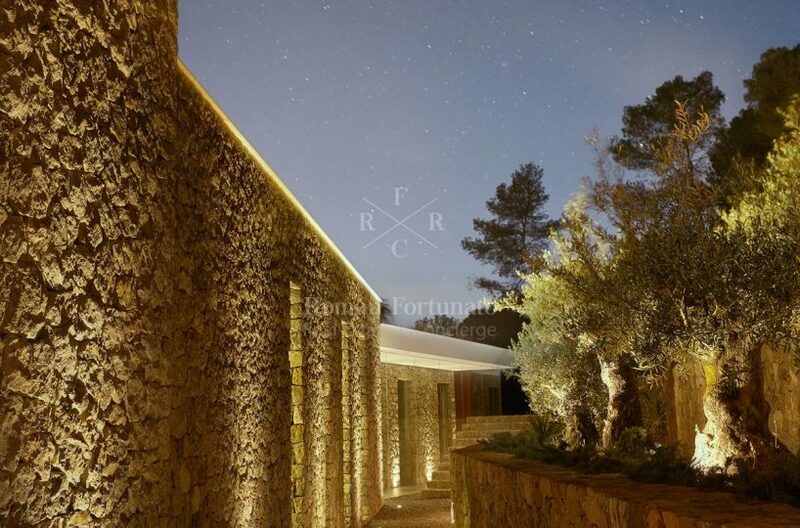 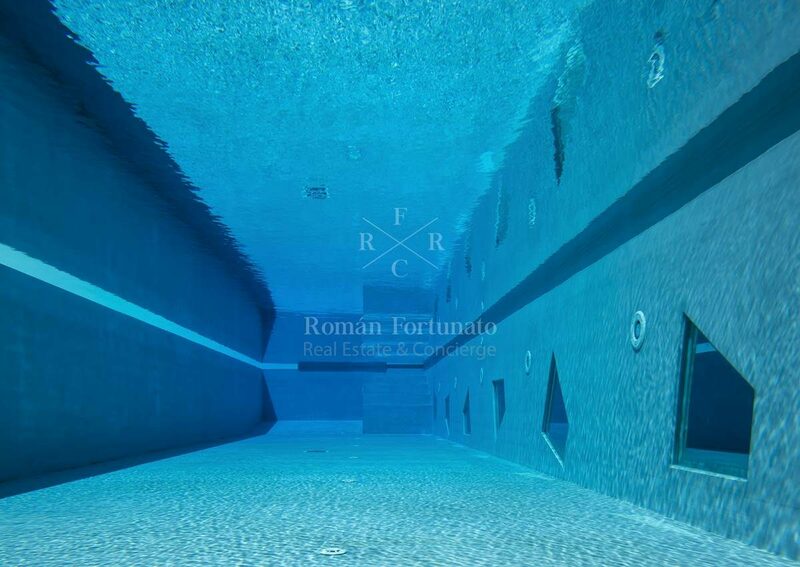 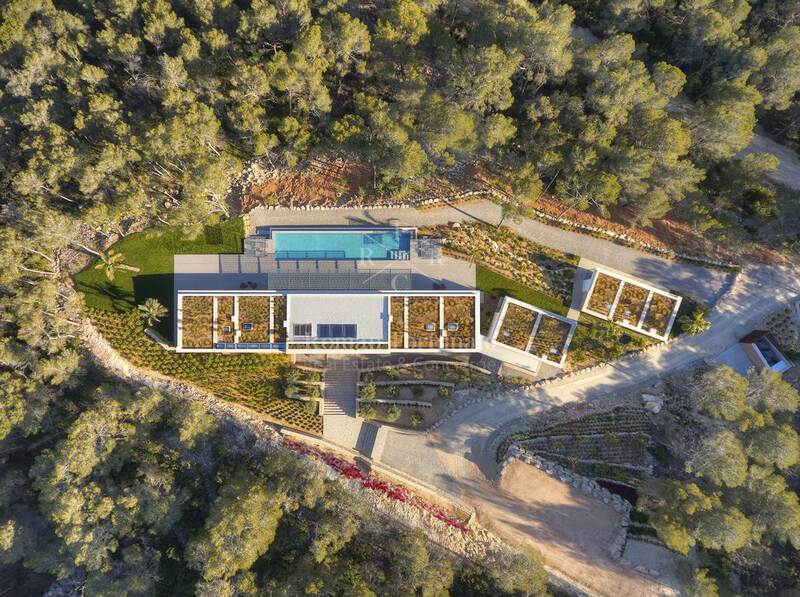 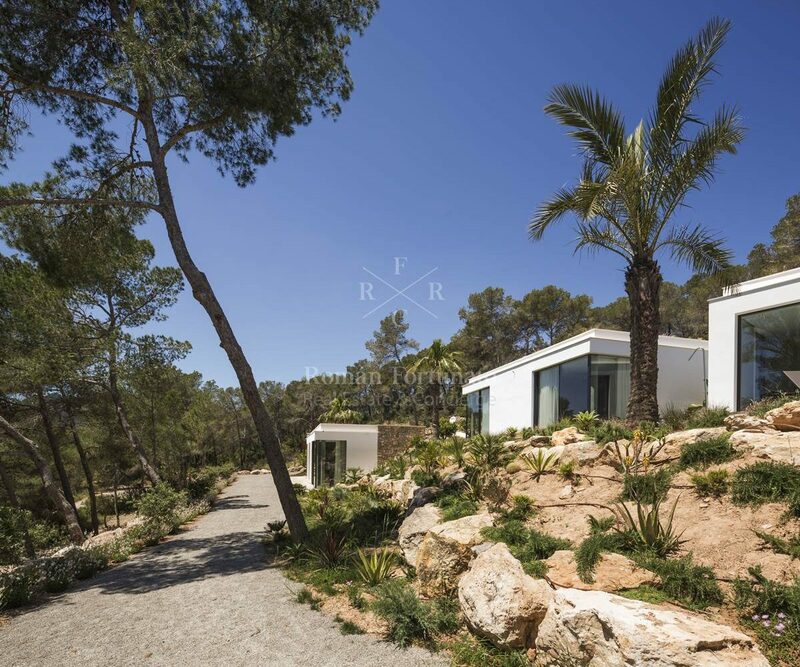 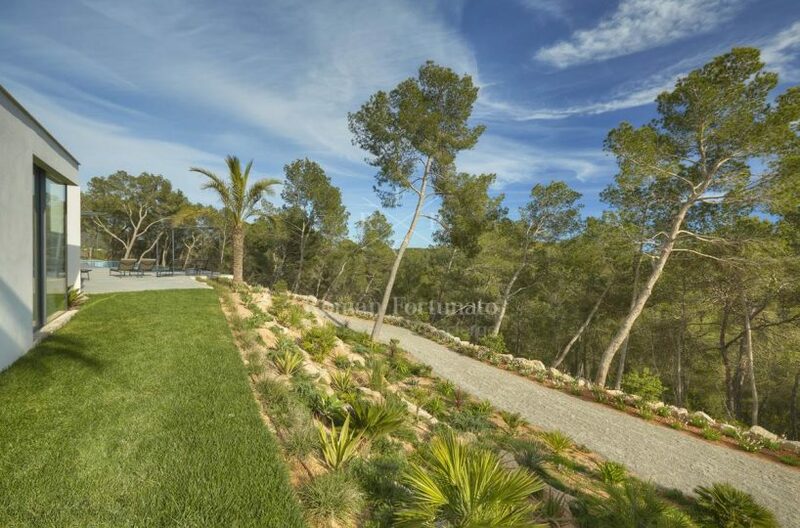 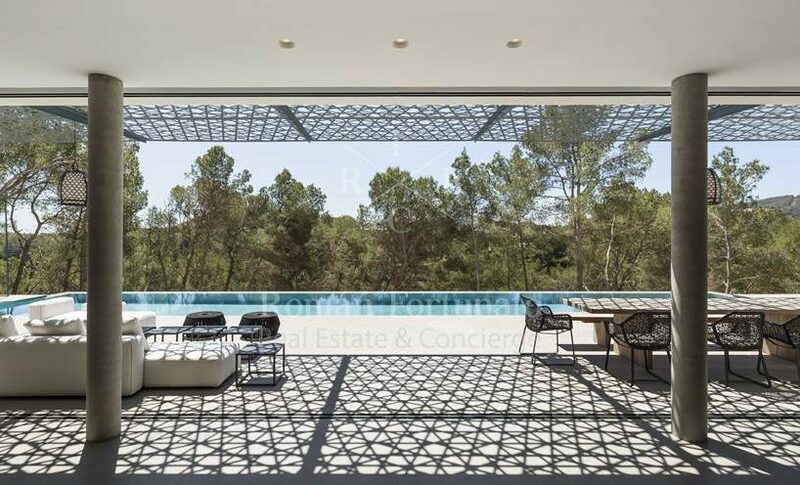 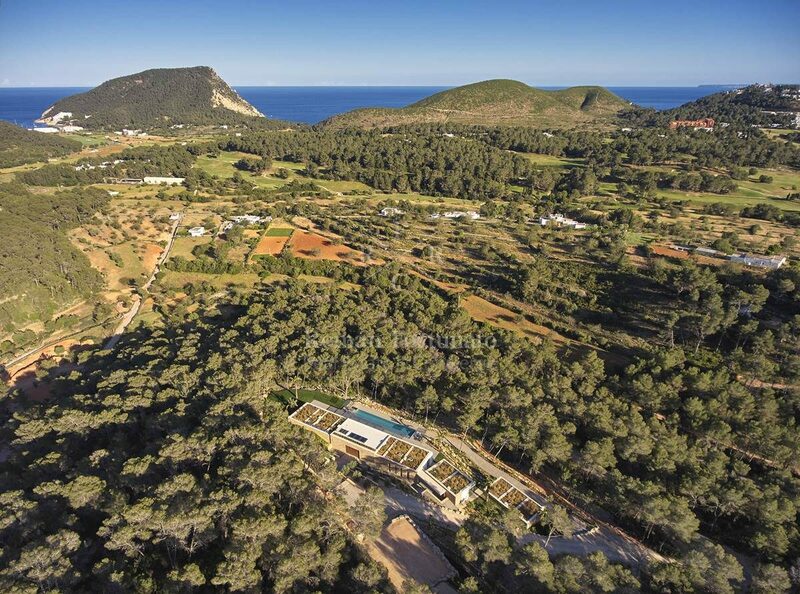 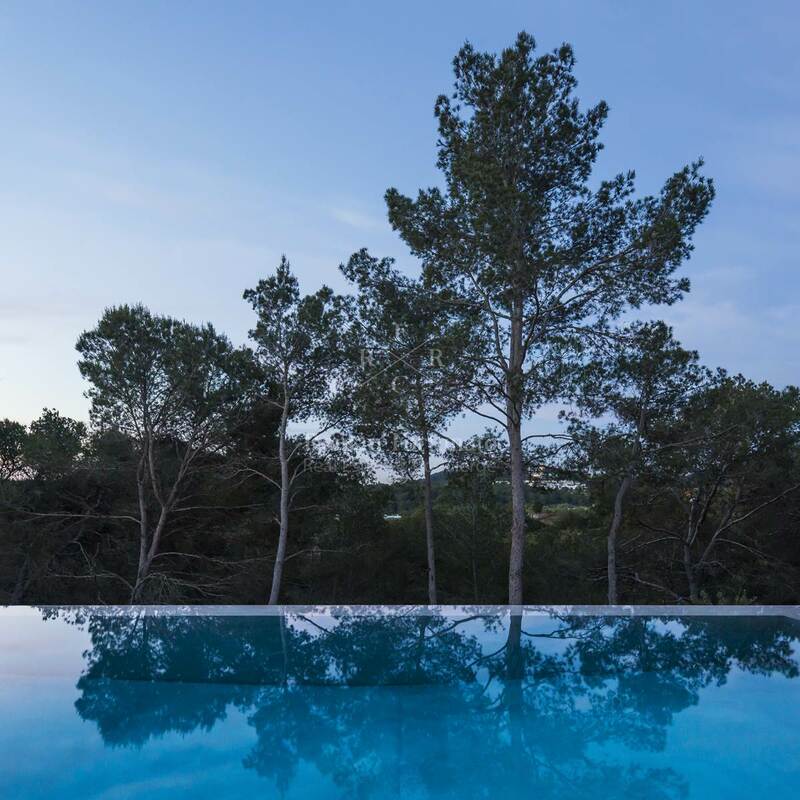 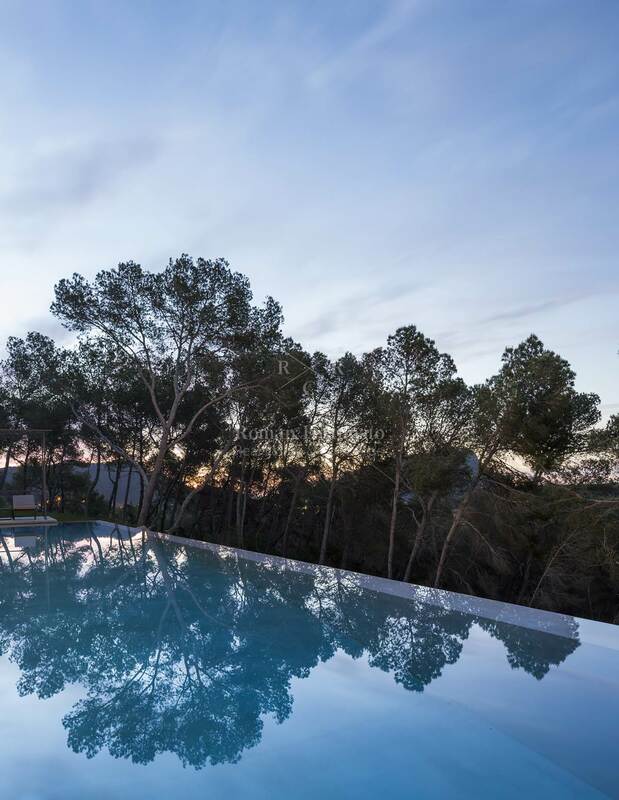 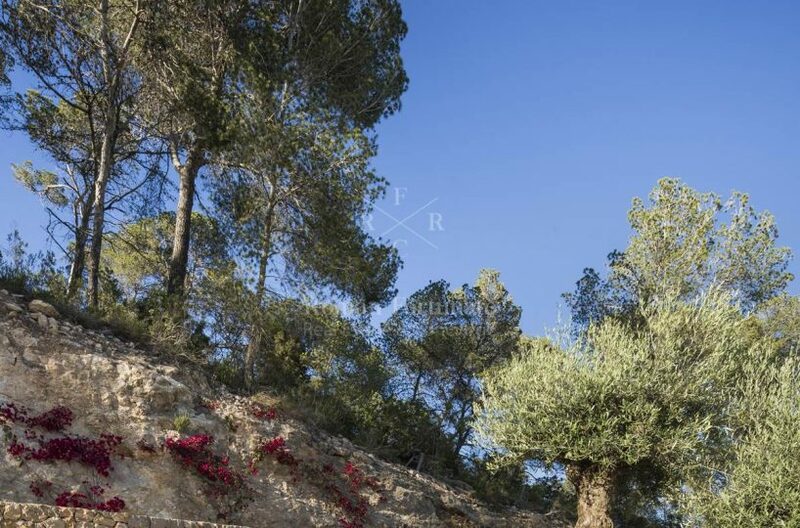 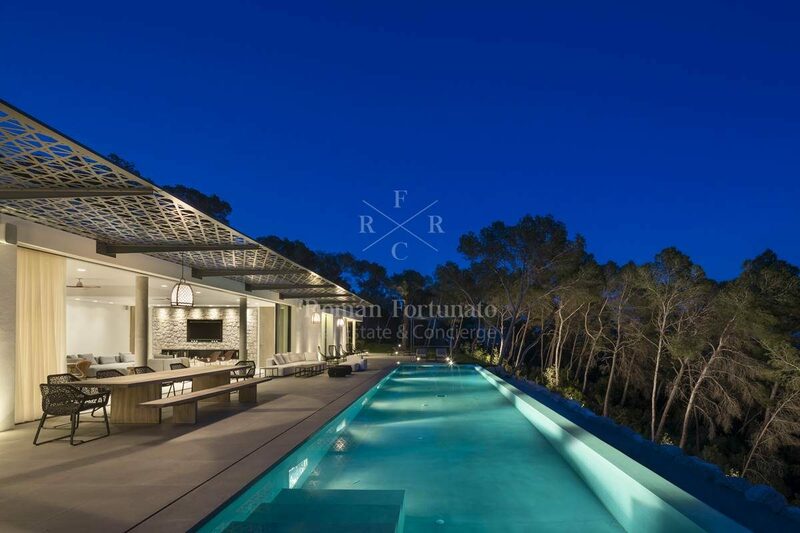 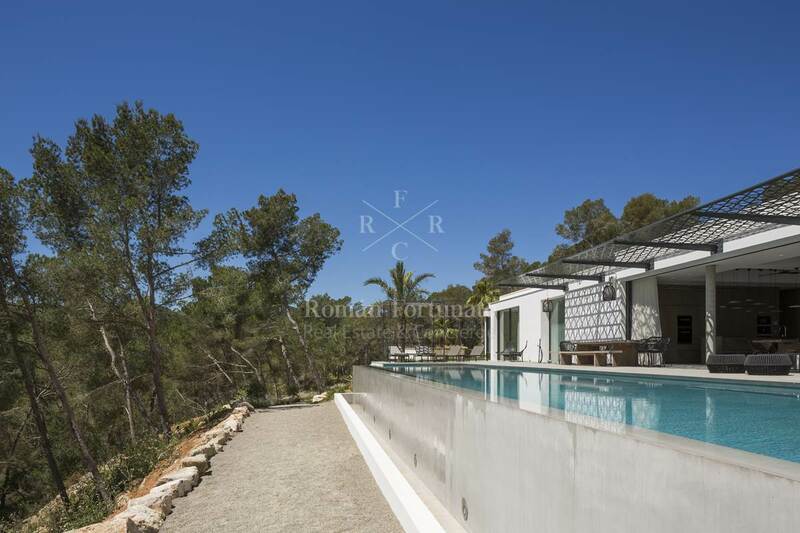 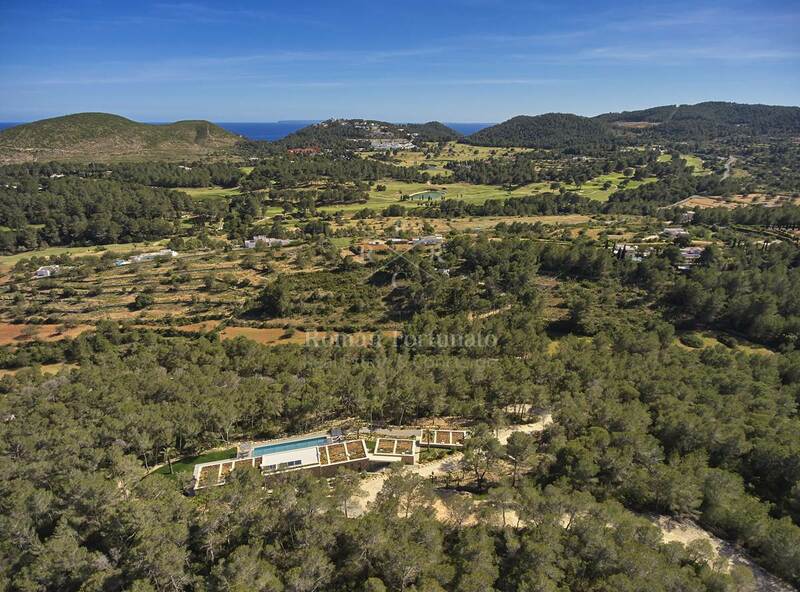 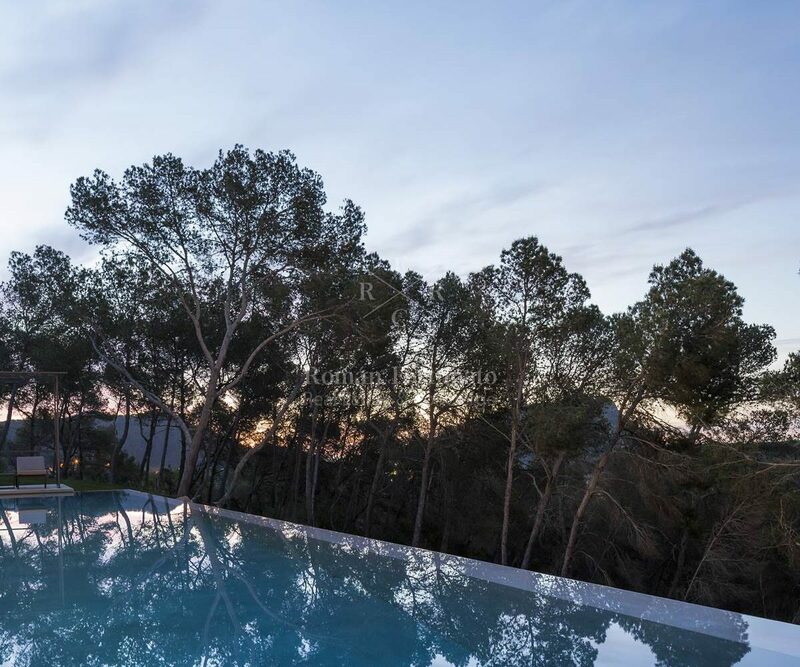 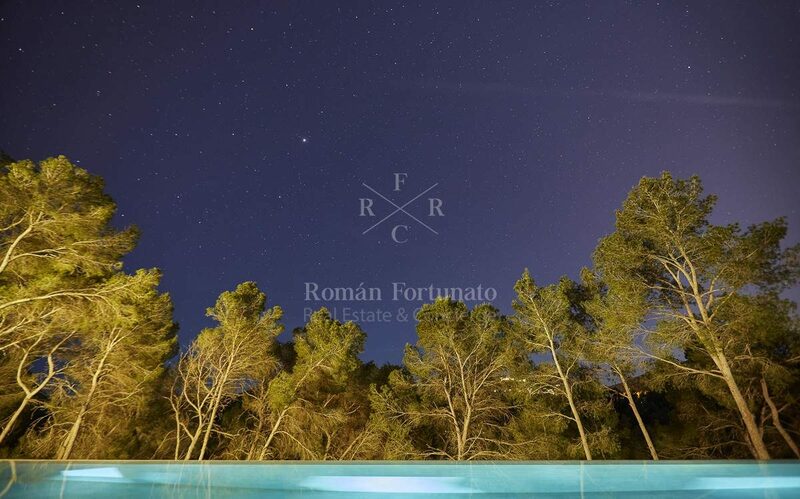 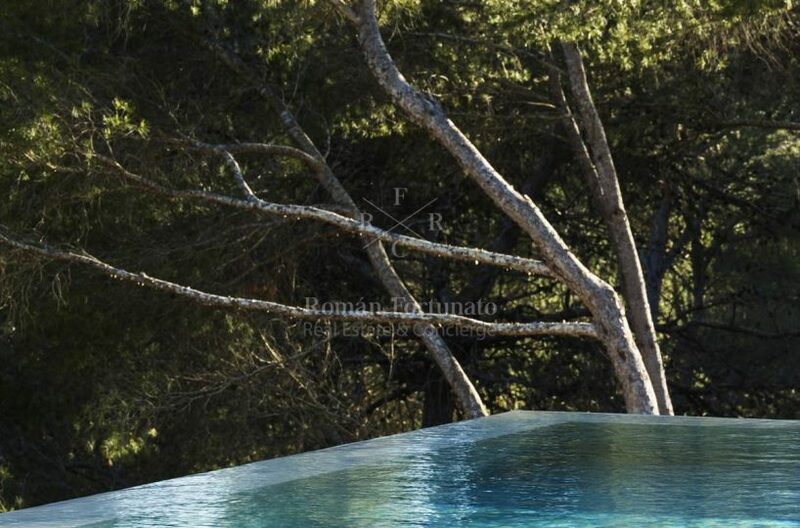 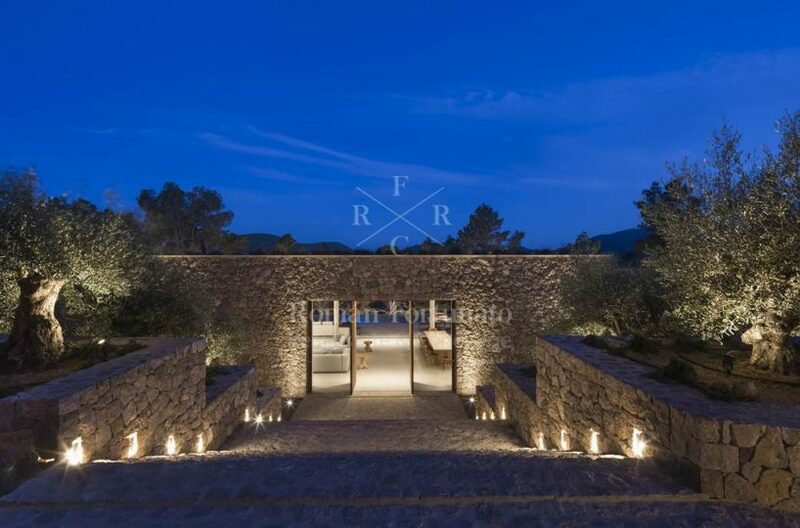 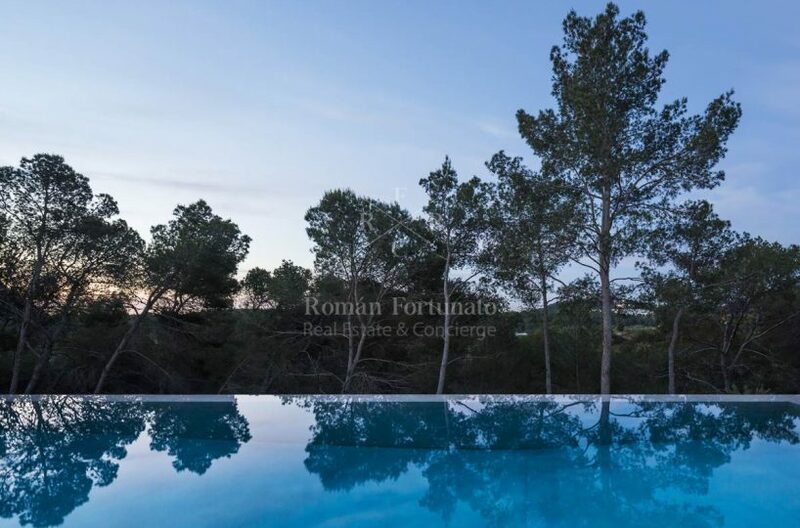 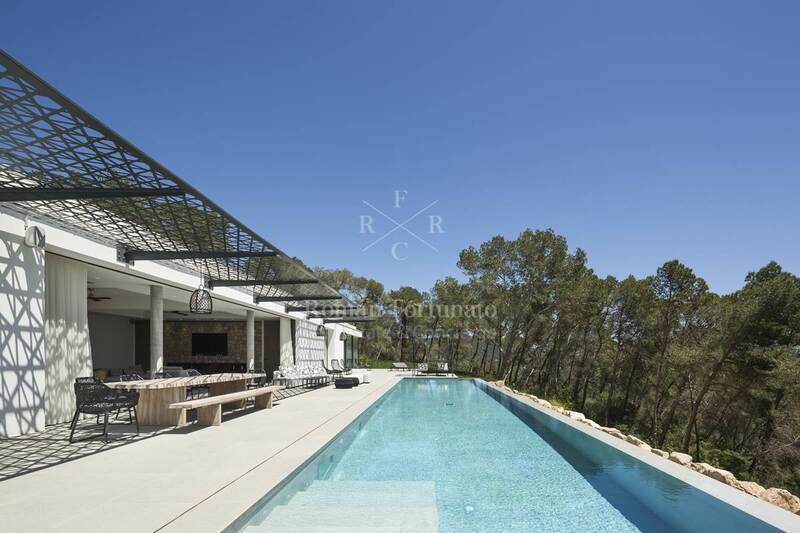 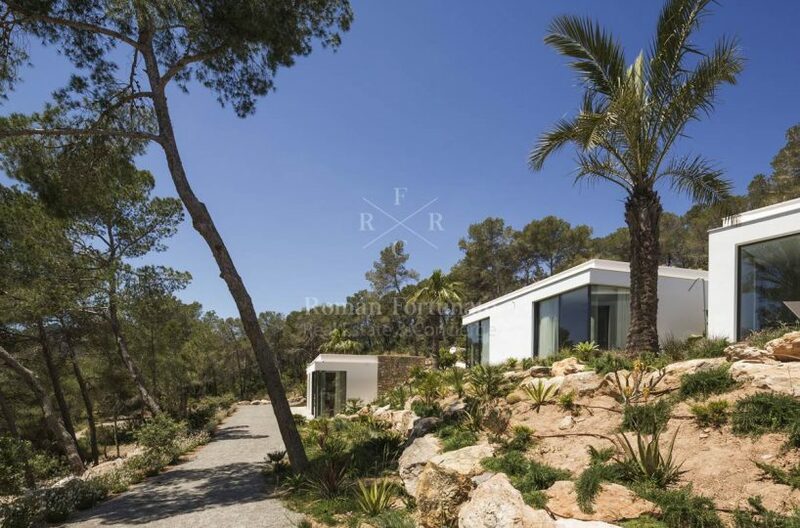 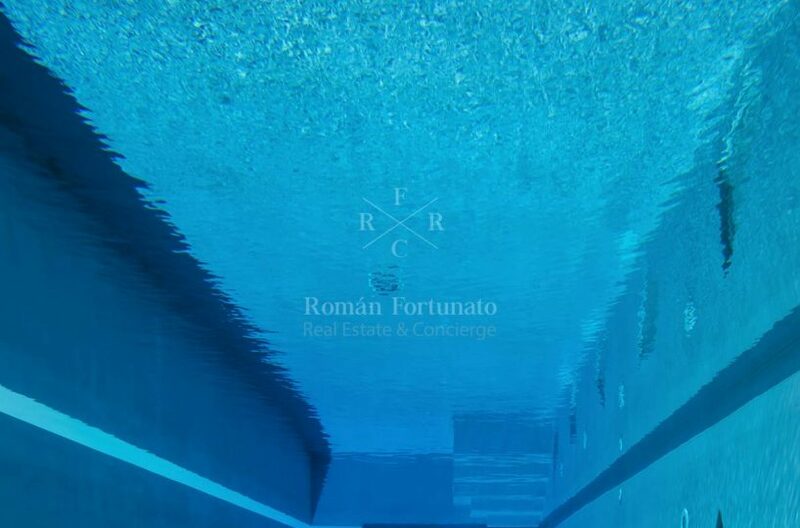 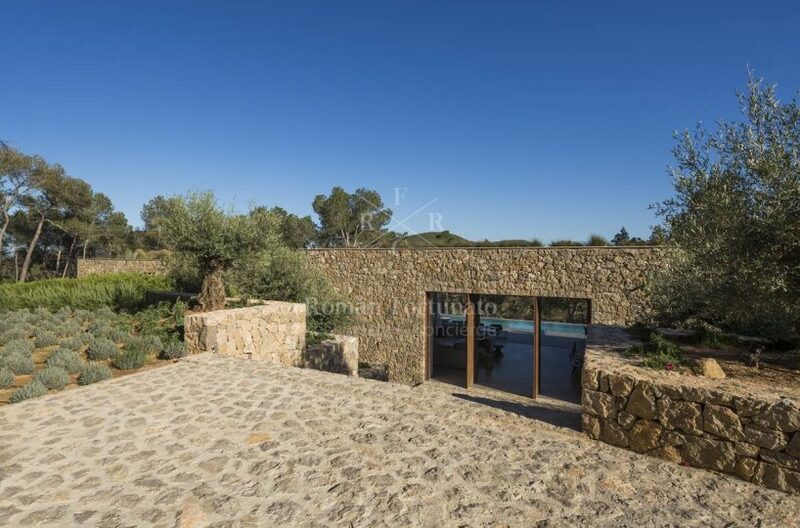 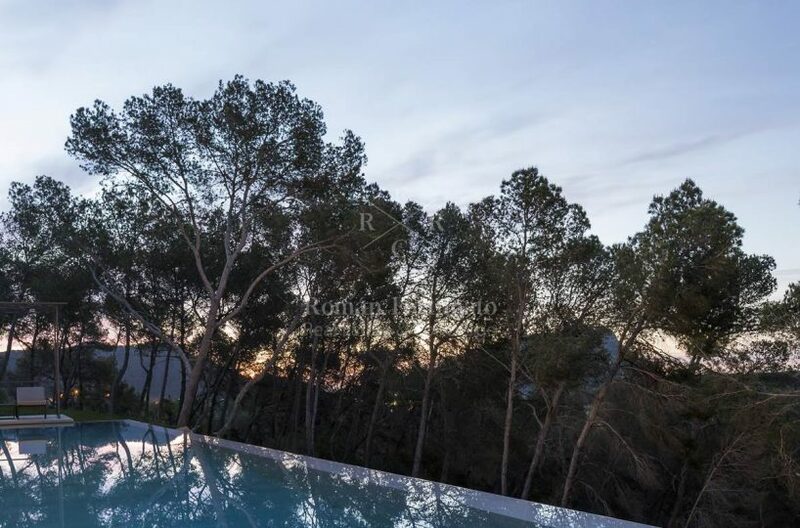 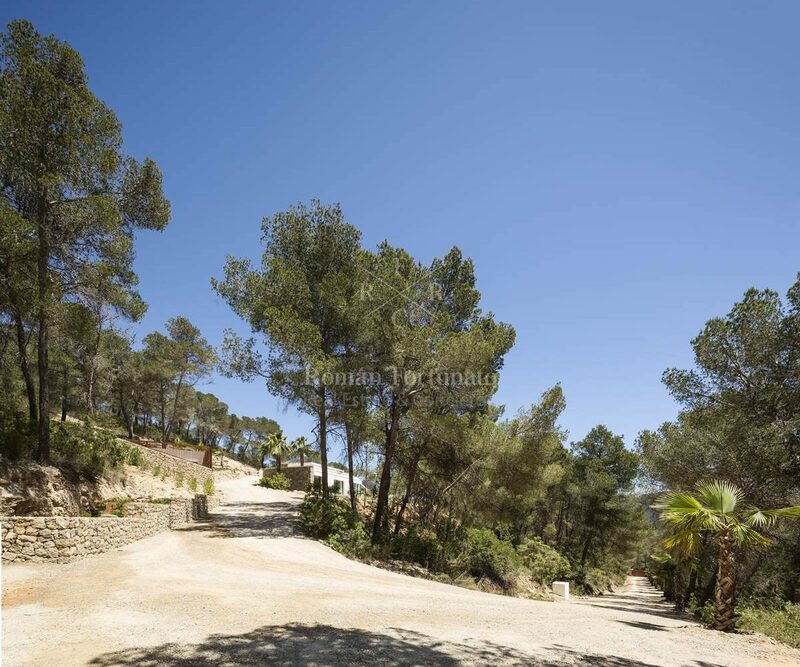 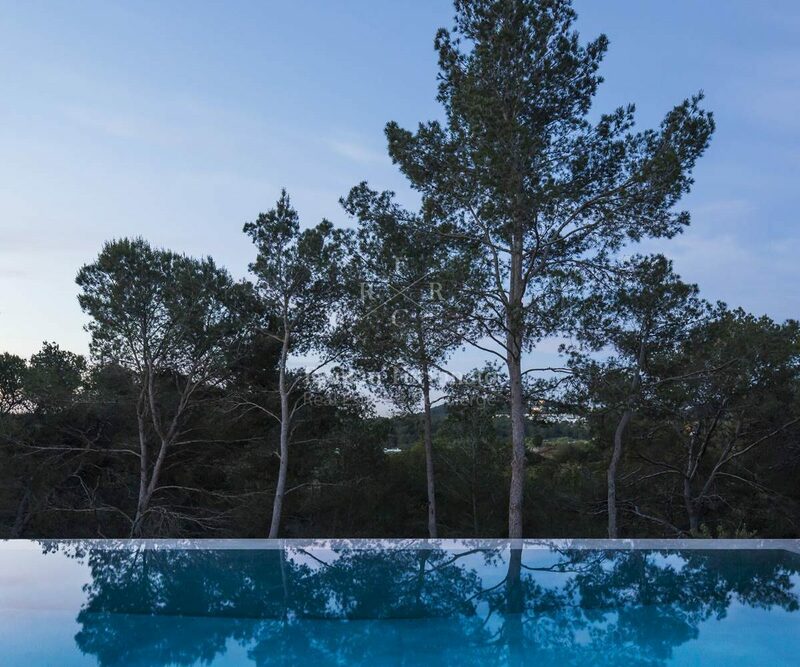 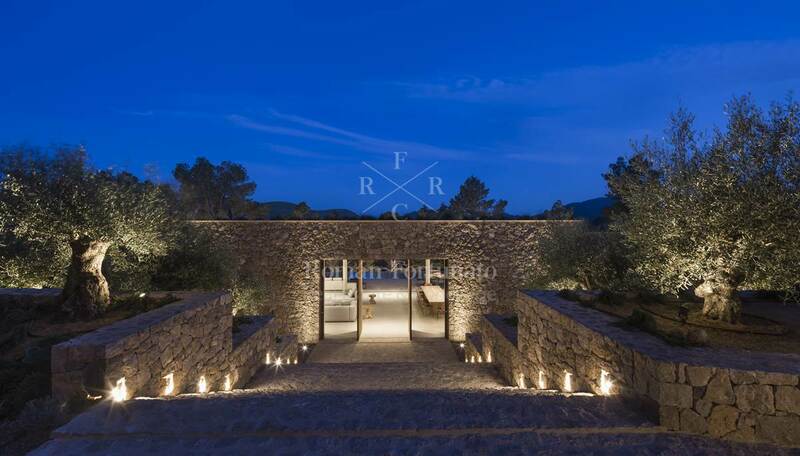 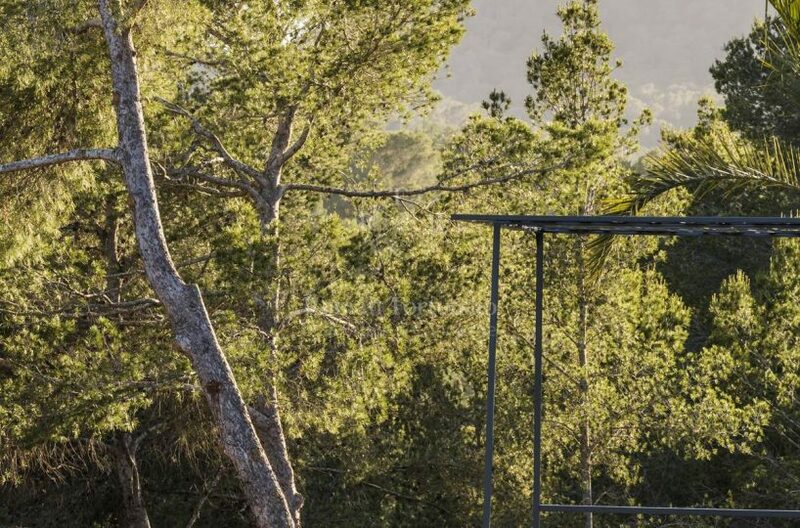 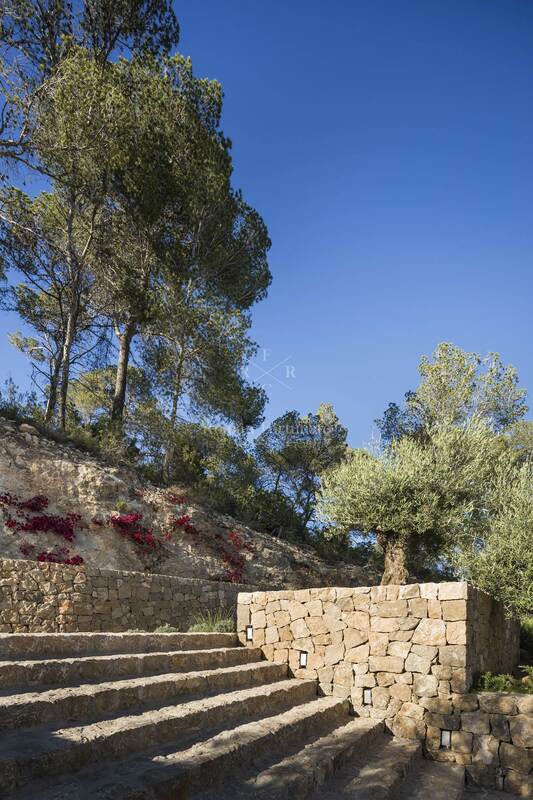 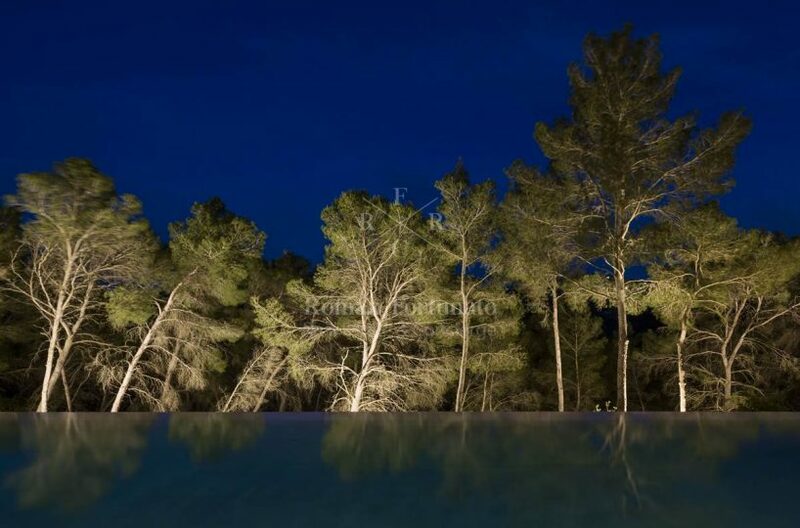 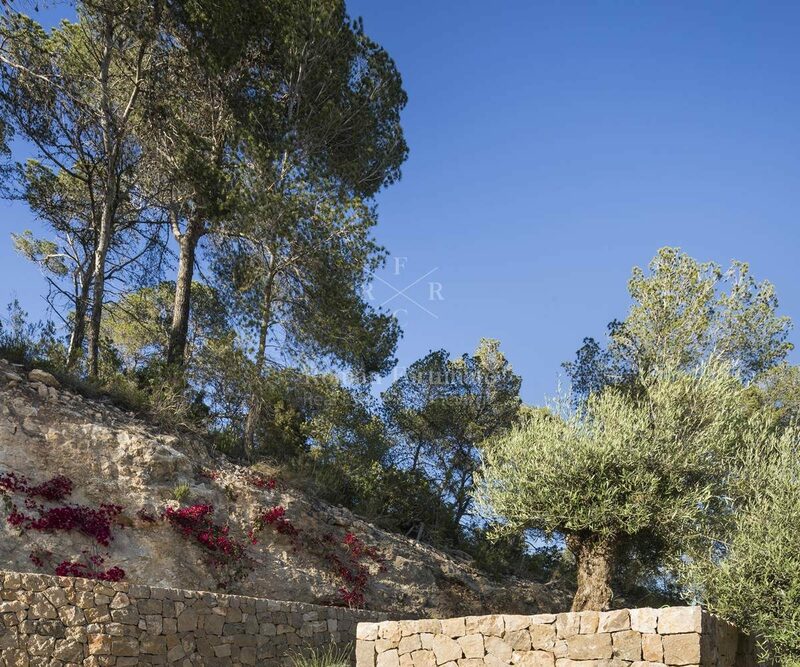 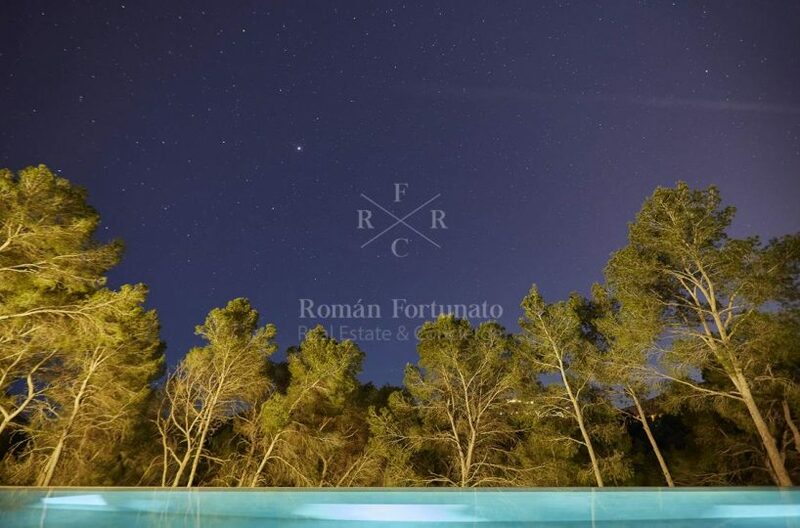 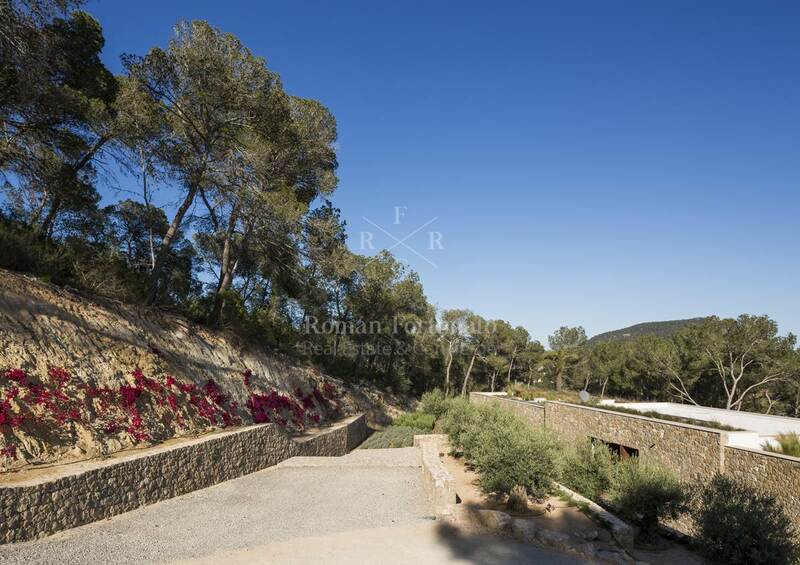 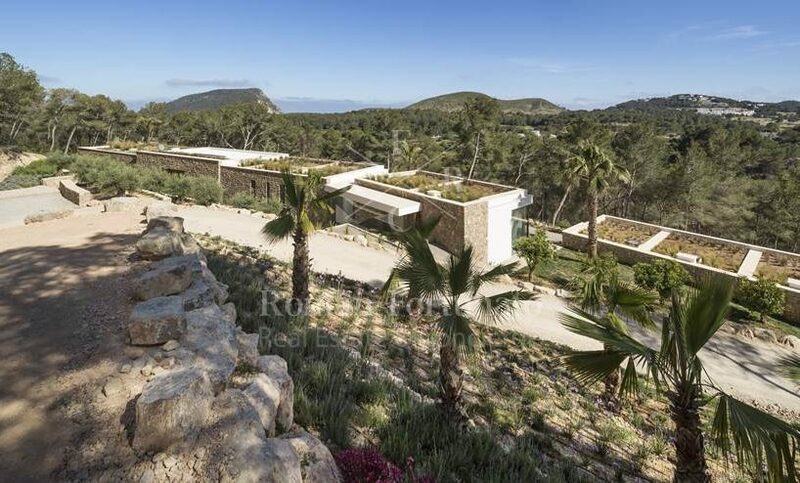 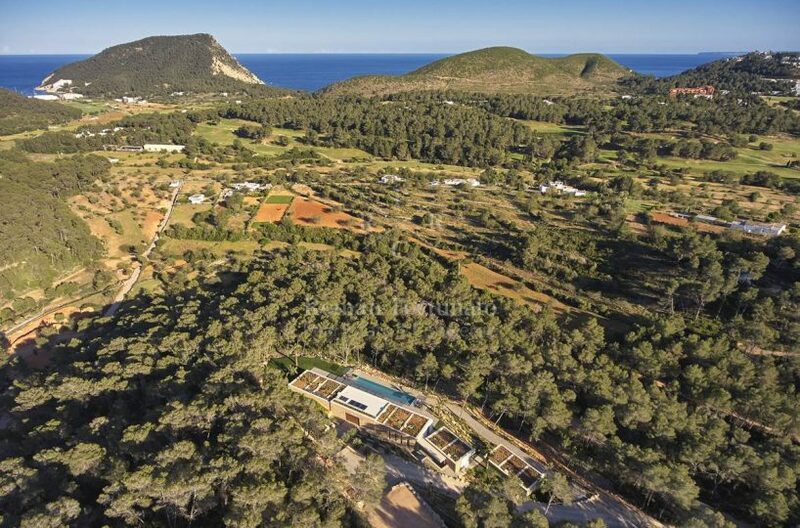 The property is located in the South East corner of the island, neighborig Roca Llisam ine of Ibiza´s South East corner of the islandm neighboring Roca Llisa, ine of Ibiza´s sought after urbanizations. 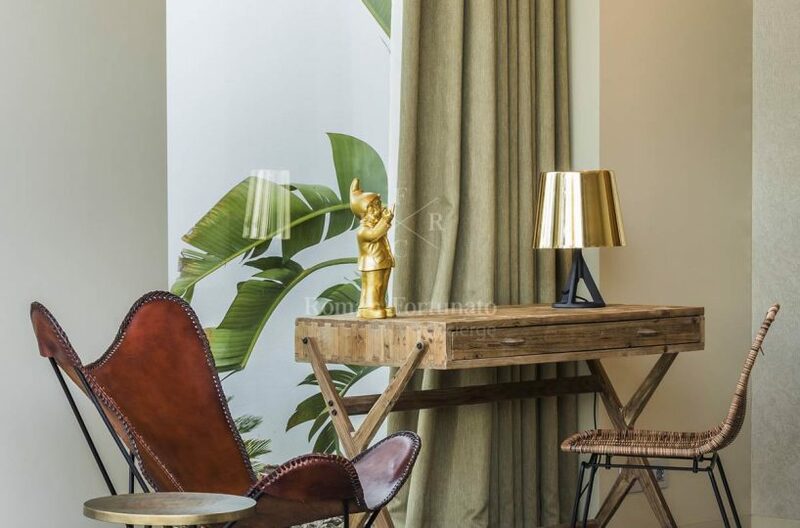 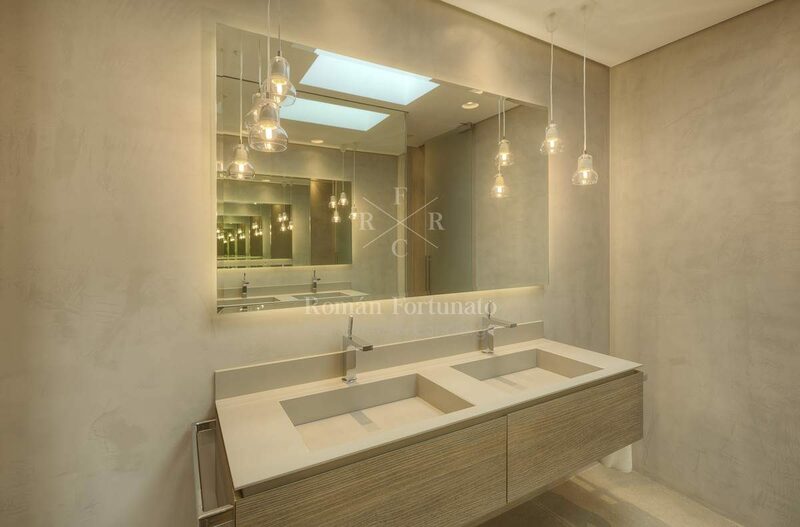 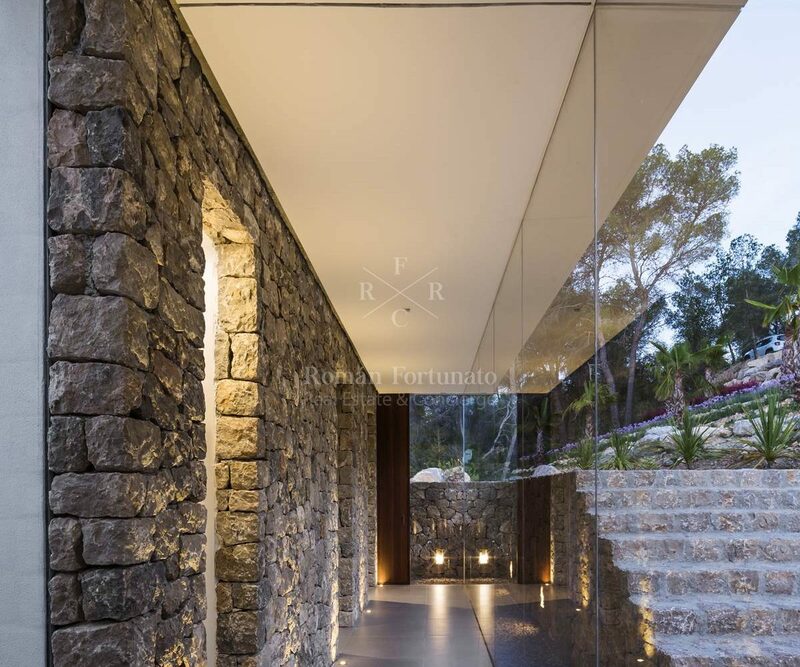 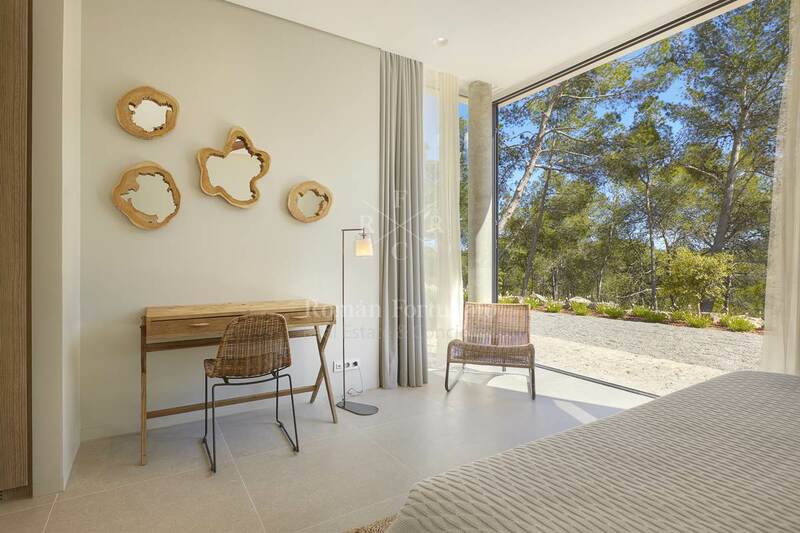 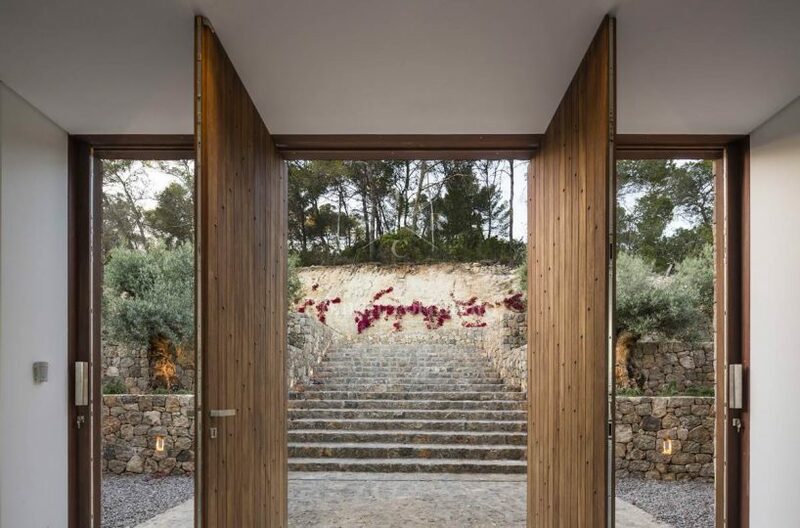 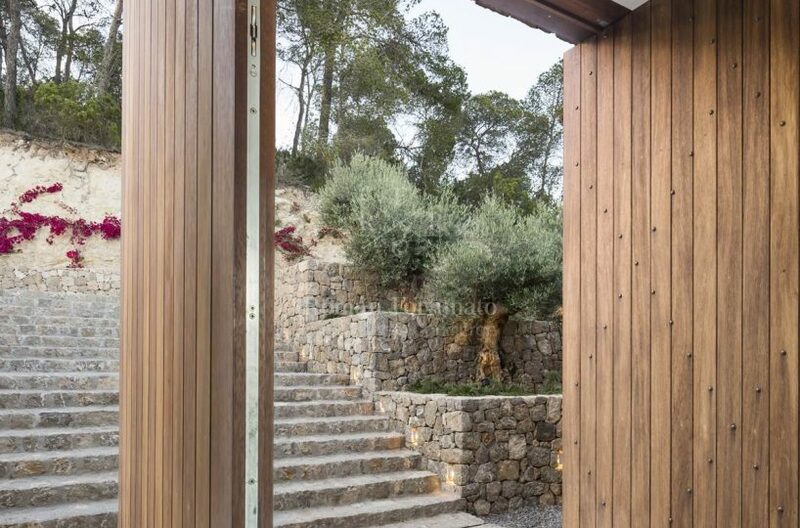 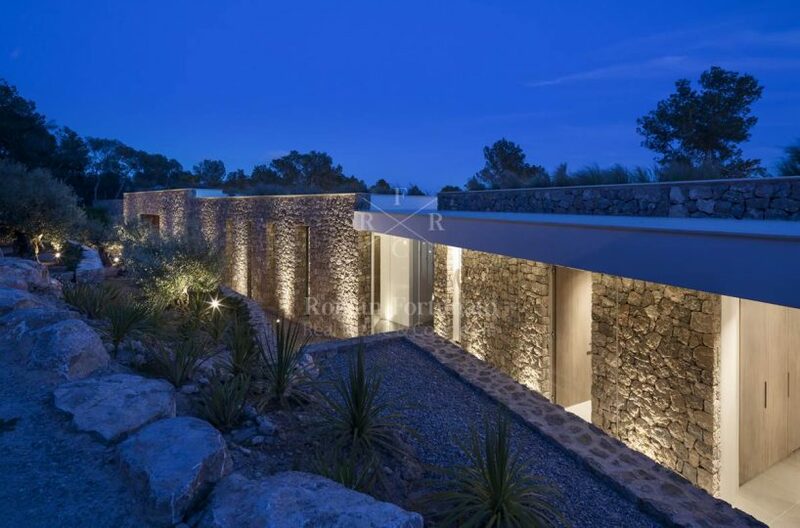 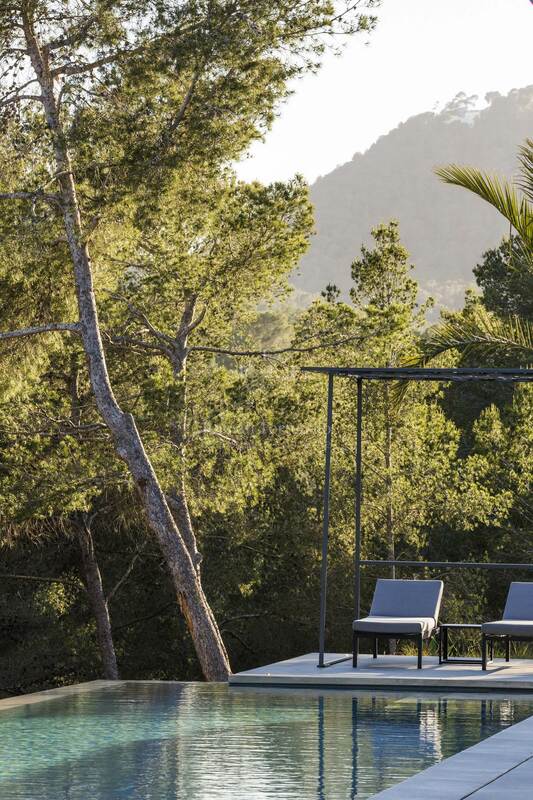 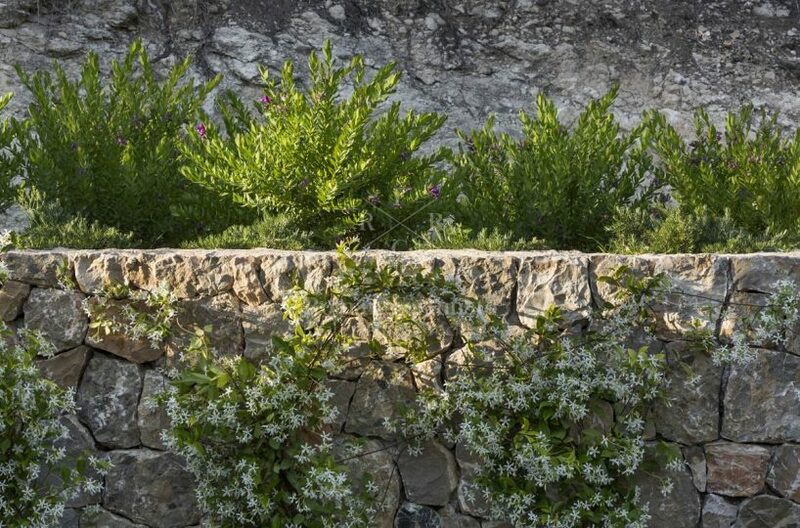 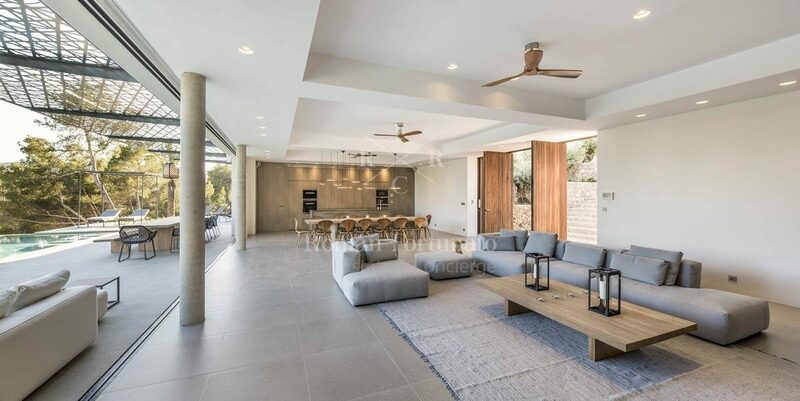 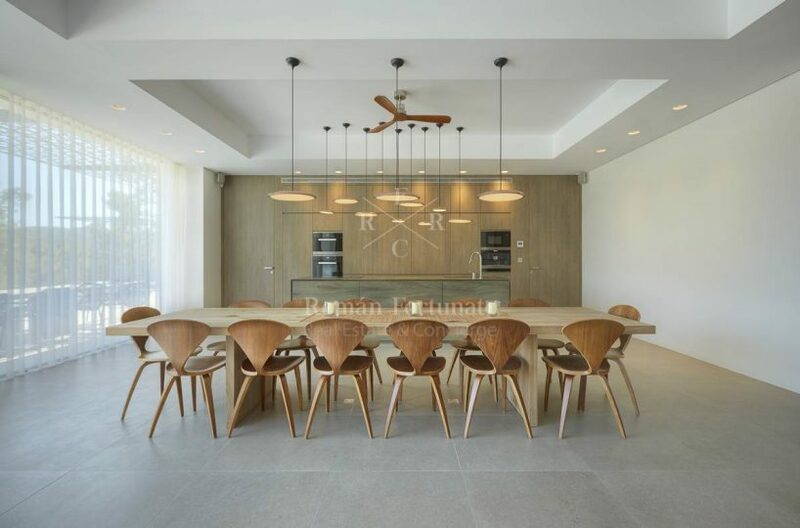 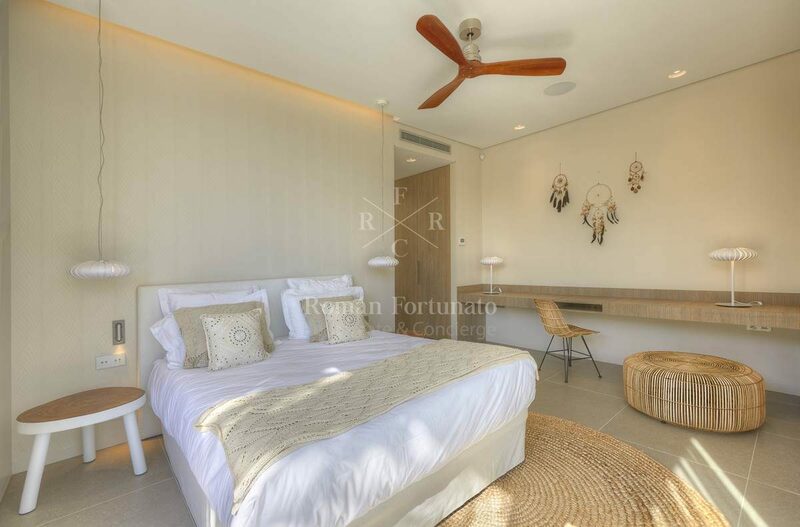 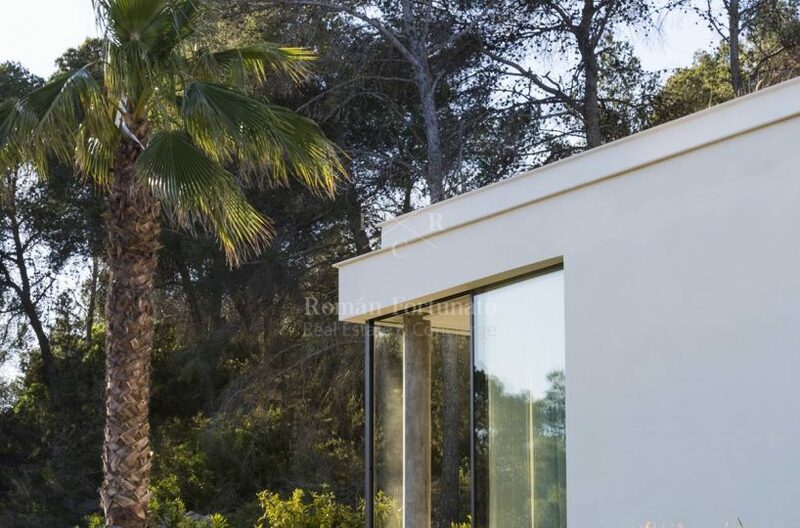 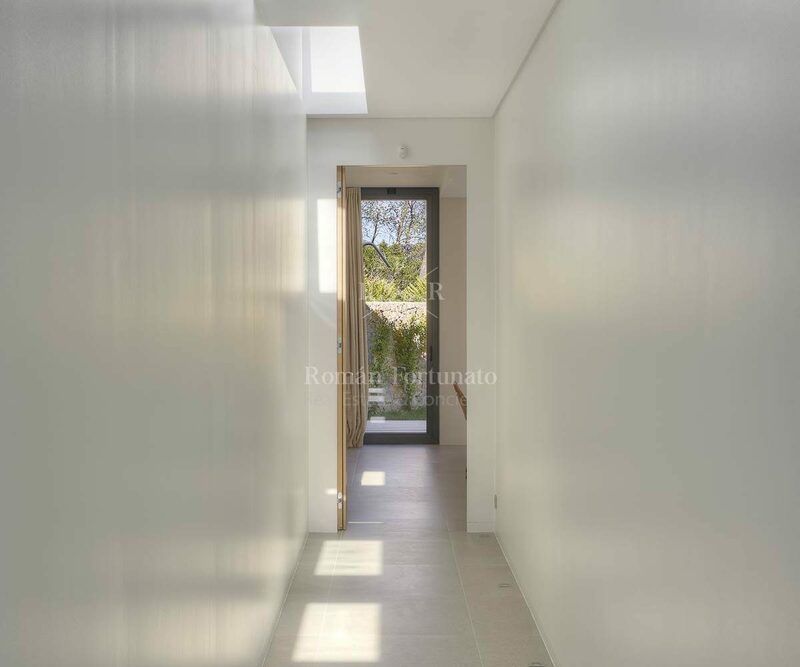 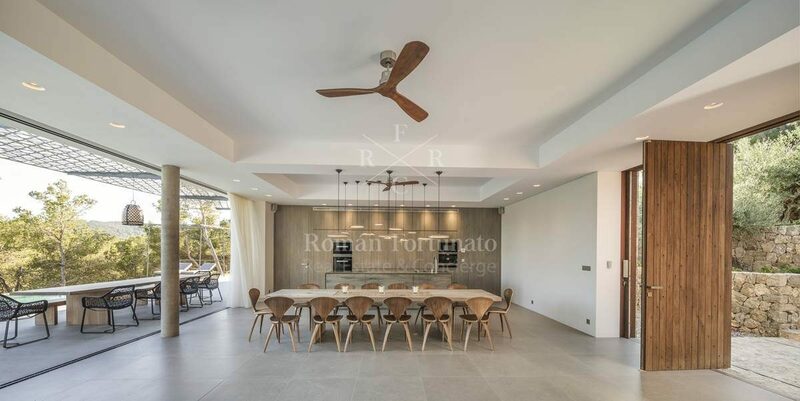 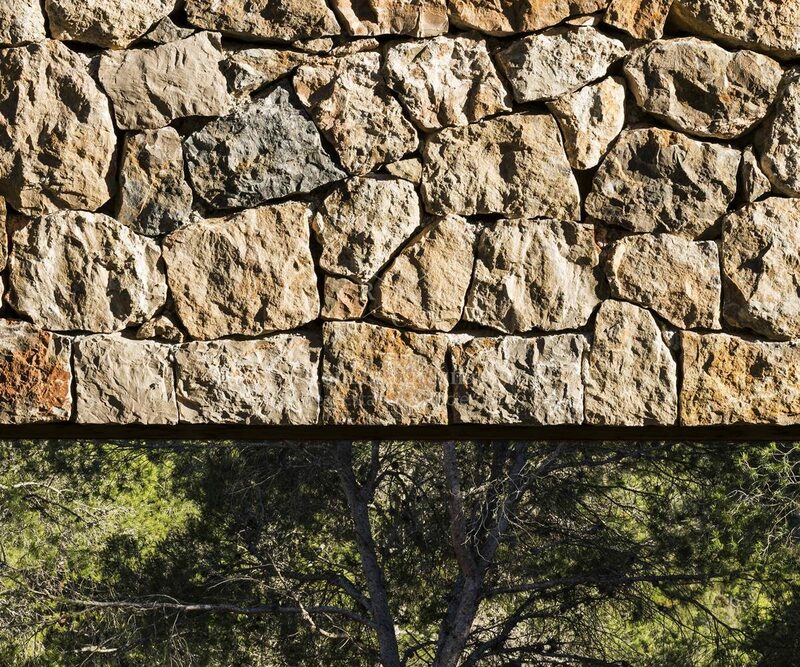 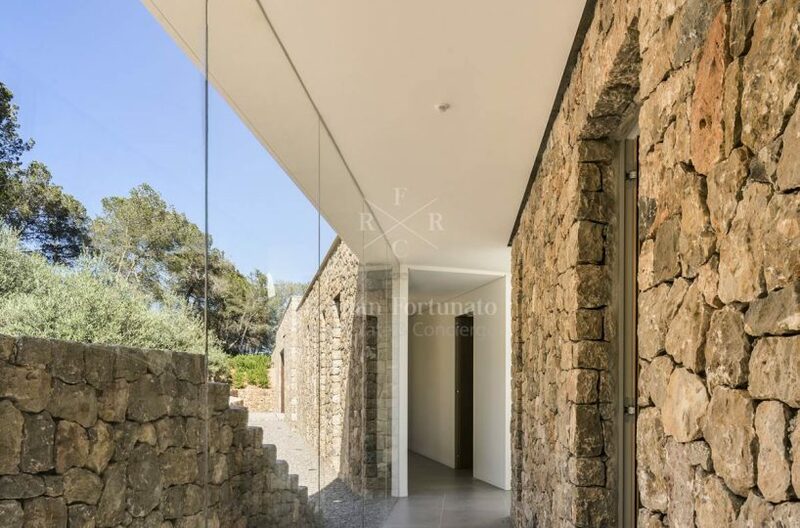 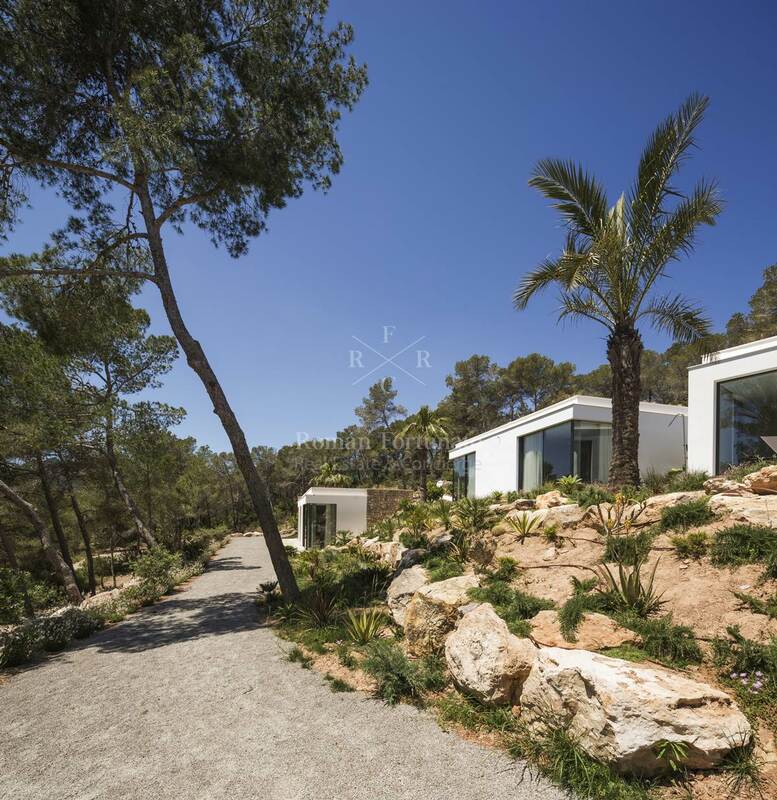 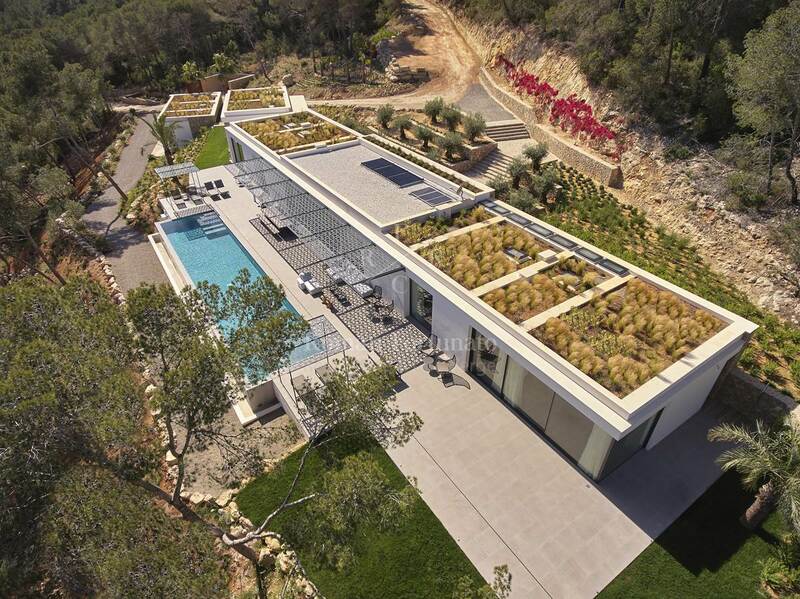 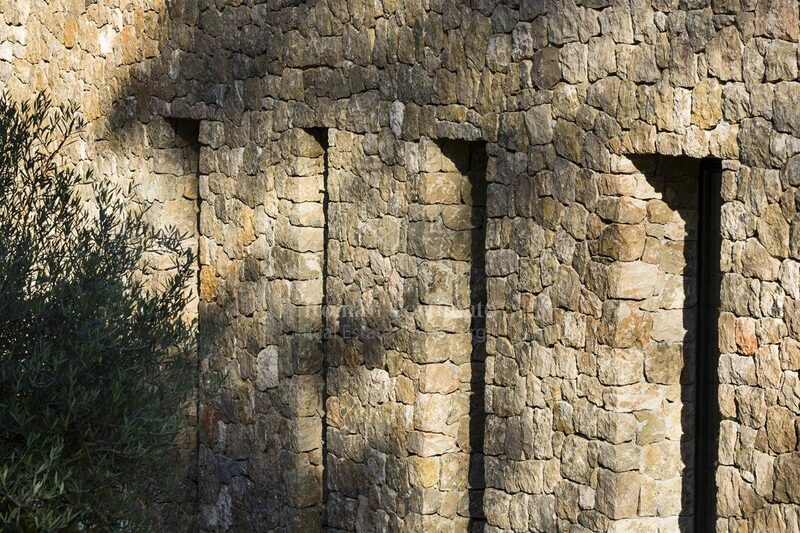 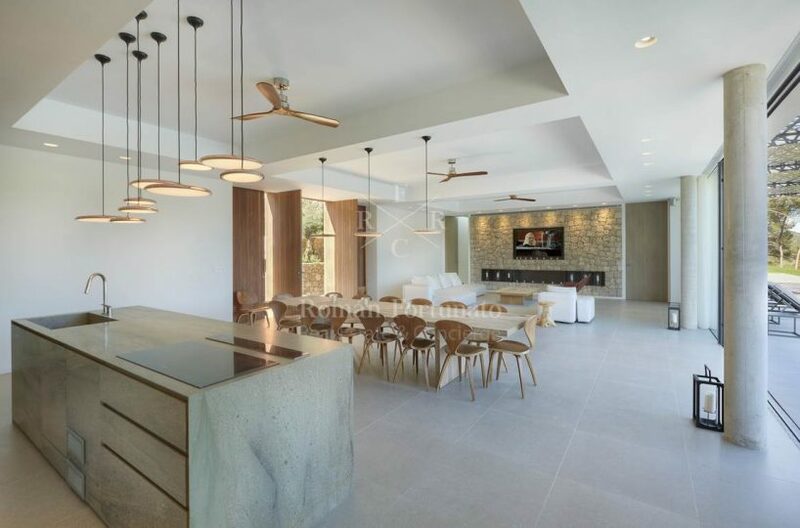 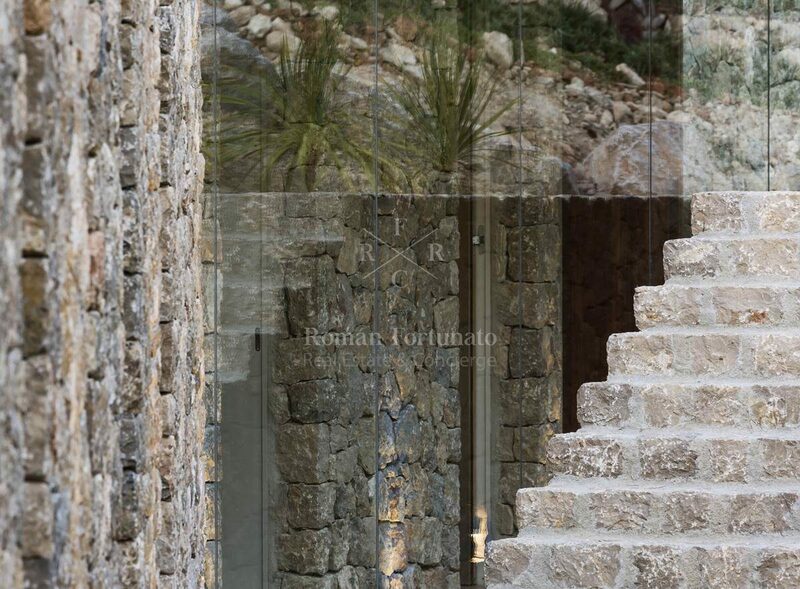 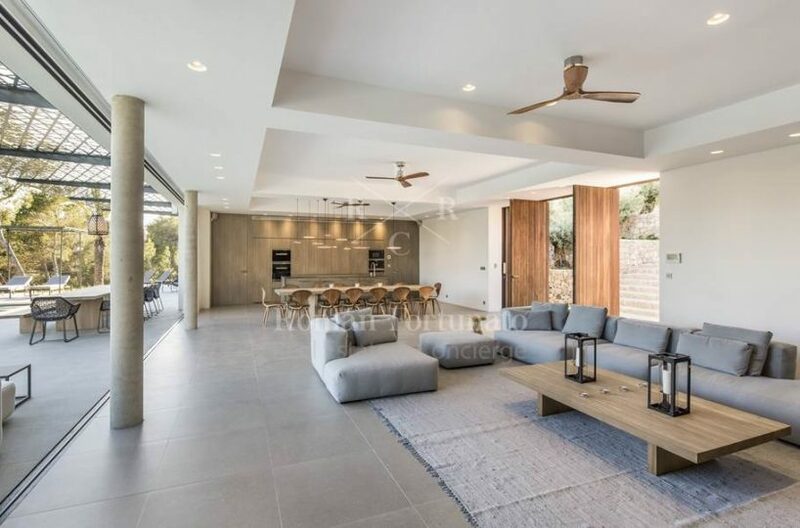 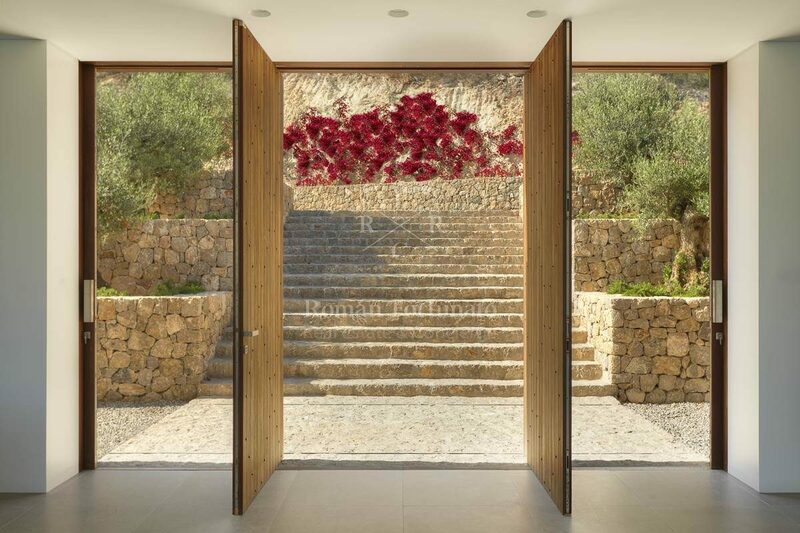 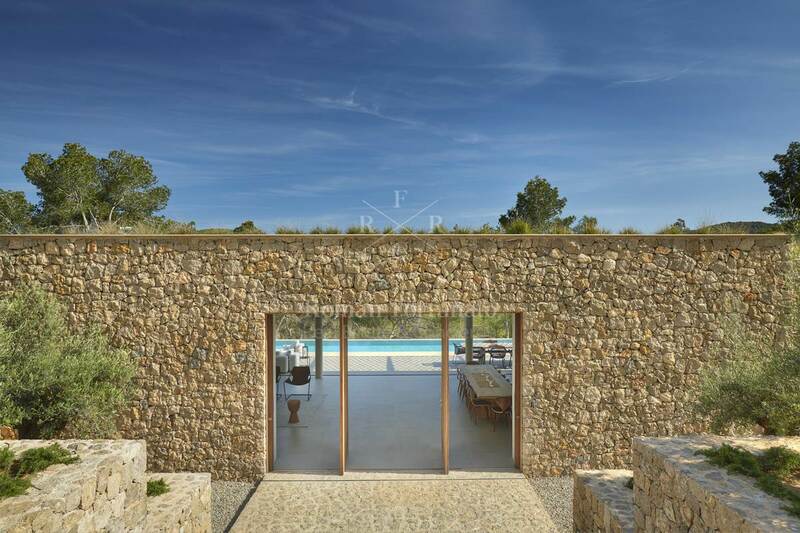 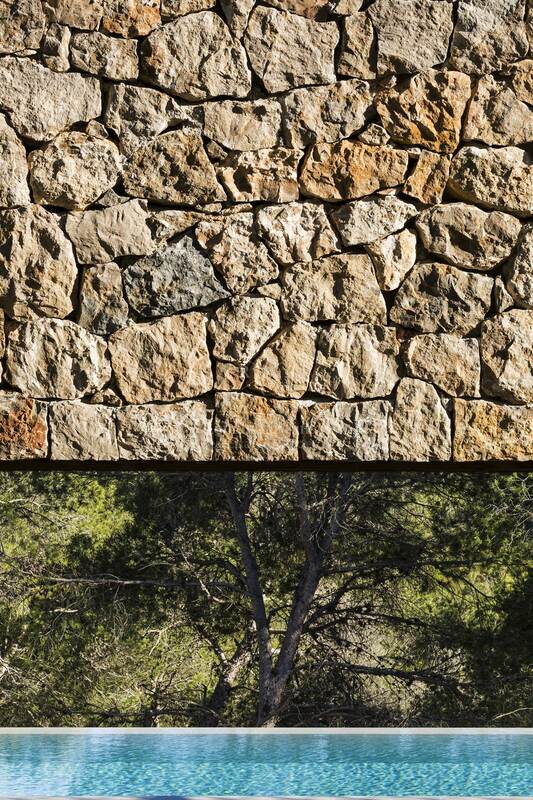 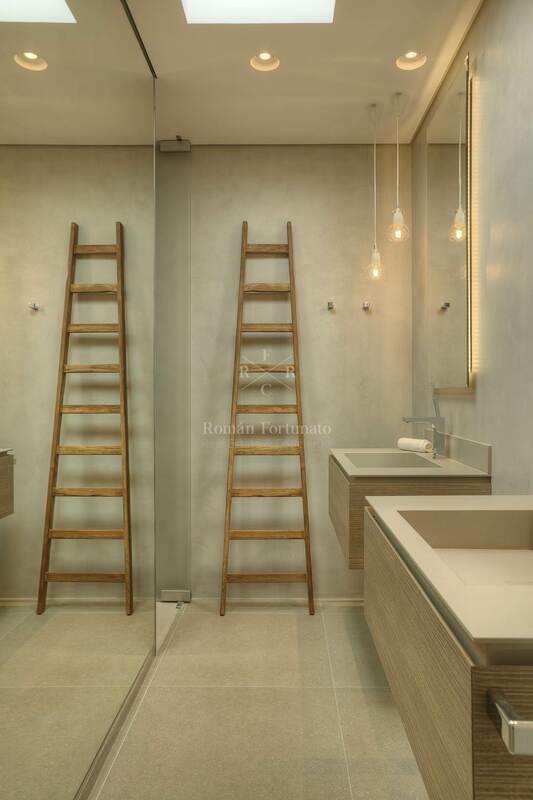 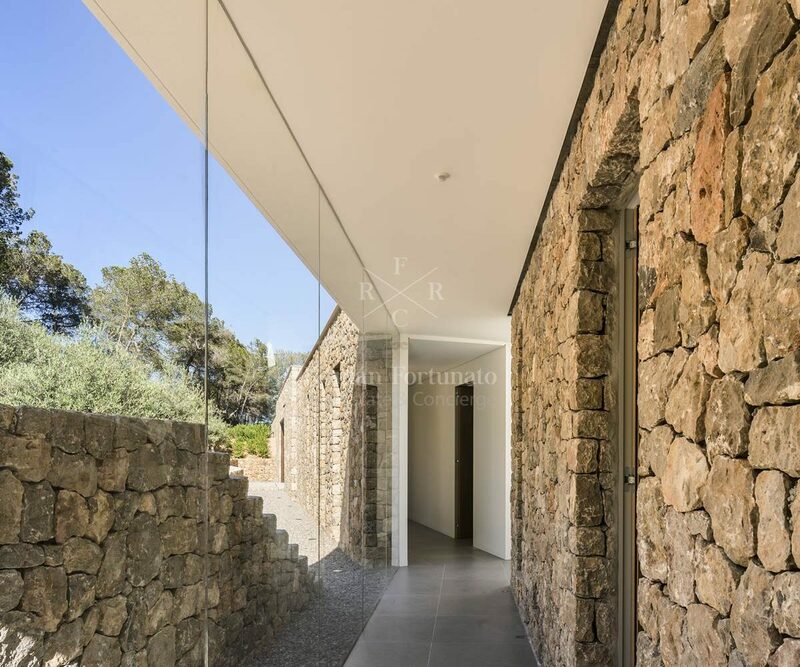 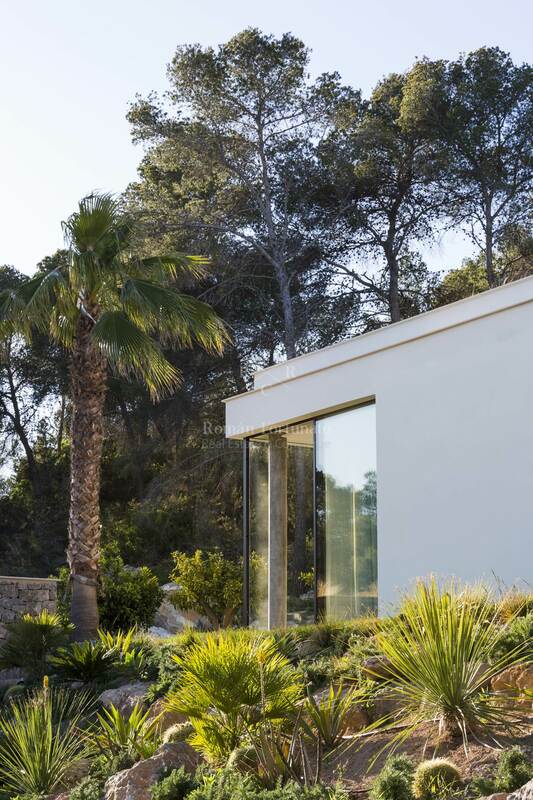 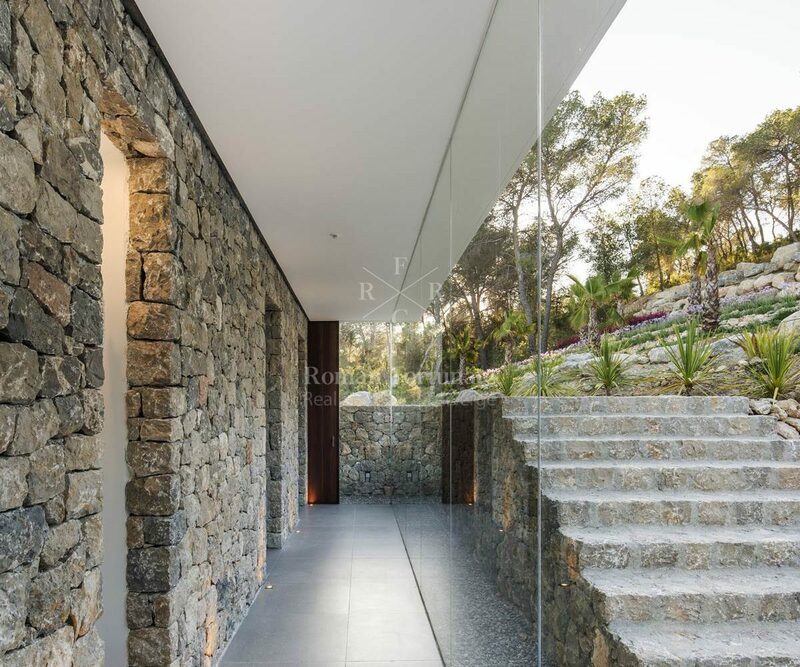 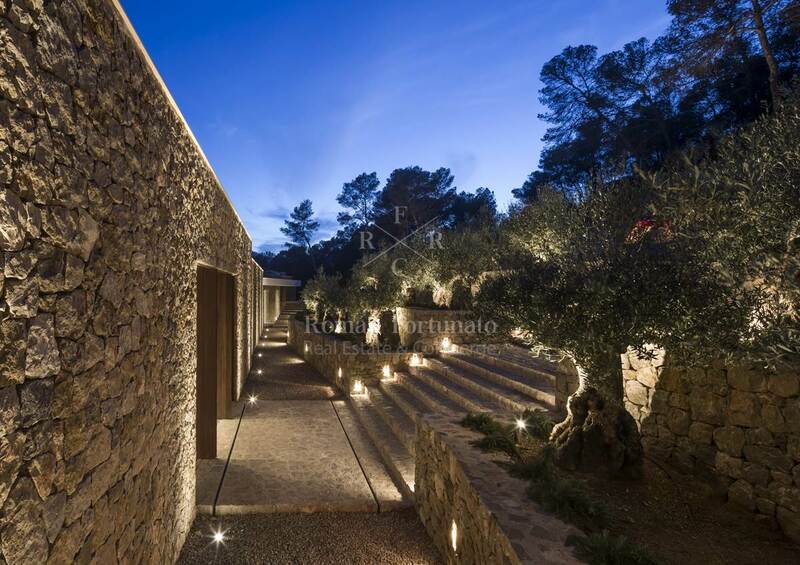 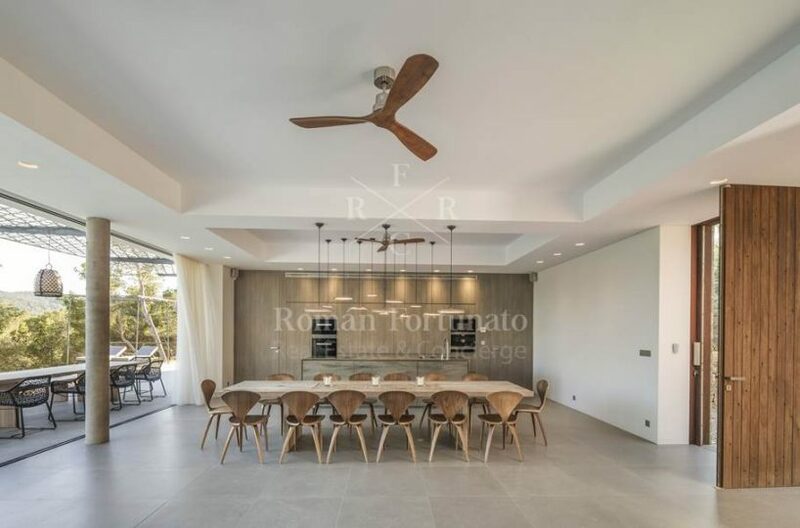 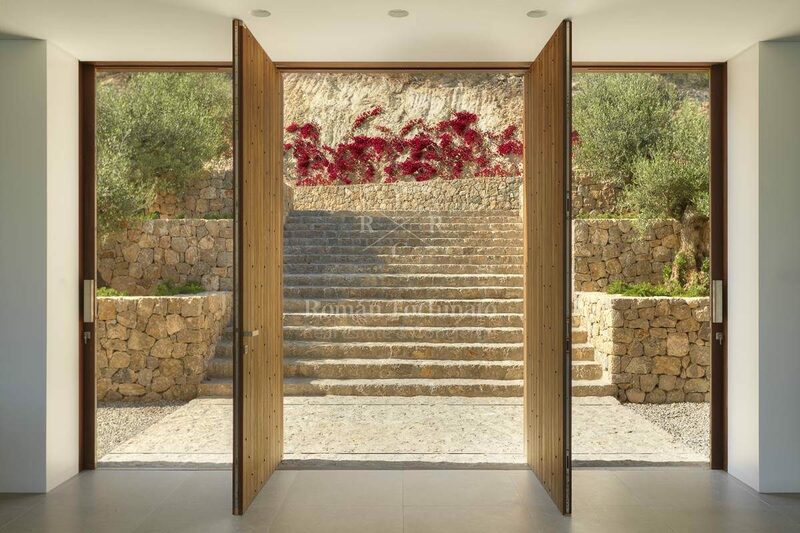 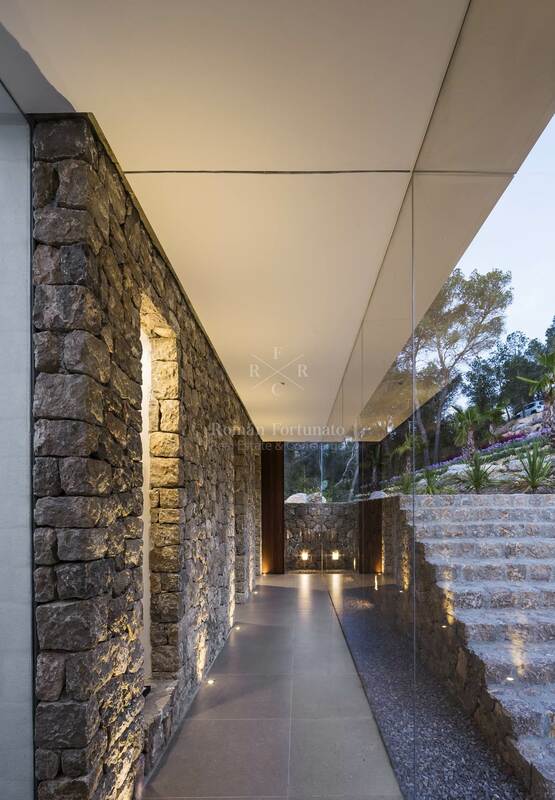 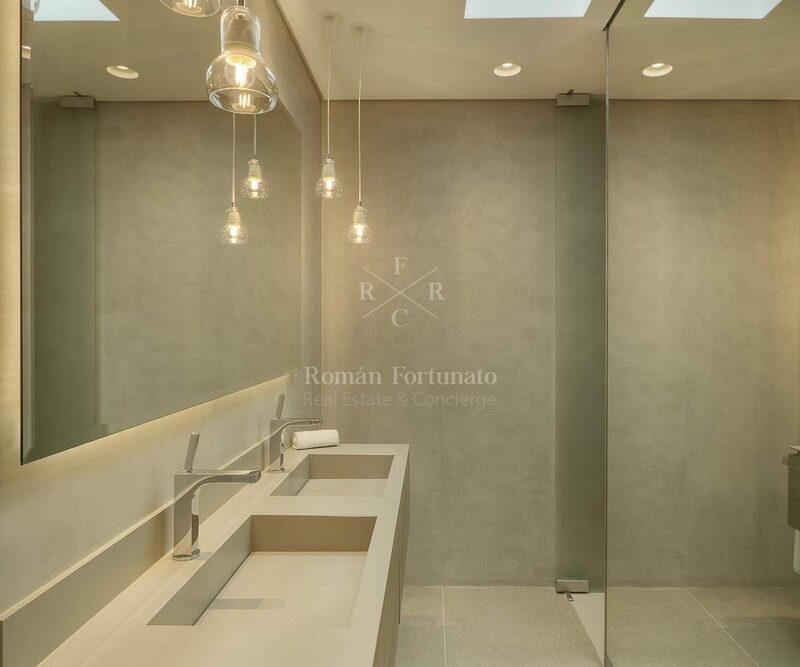 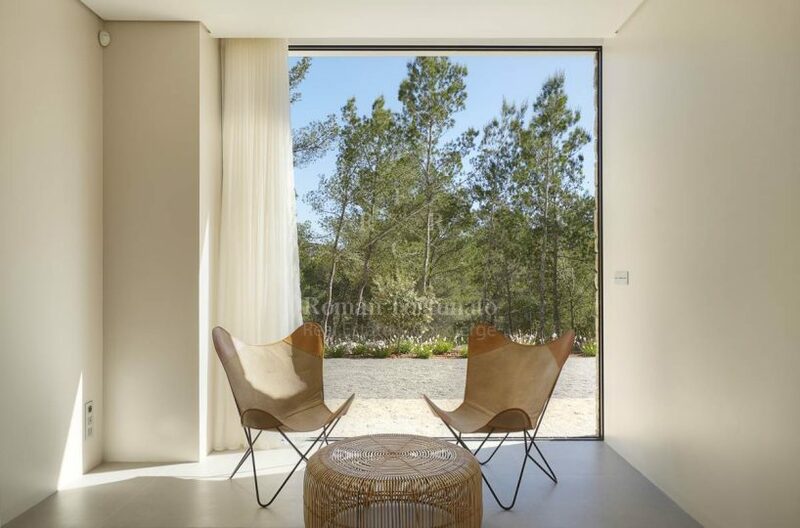 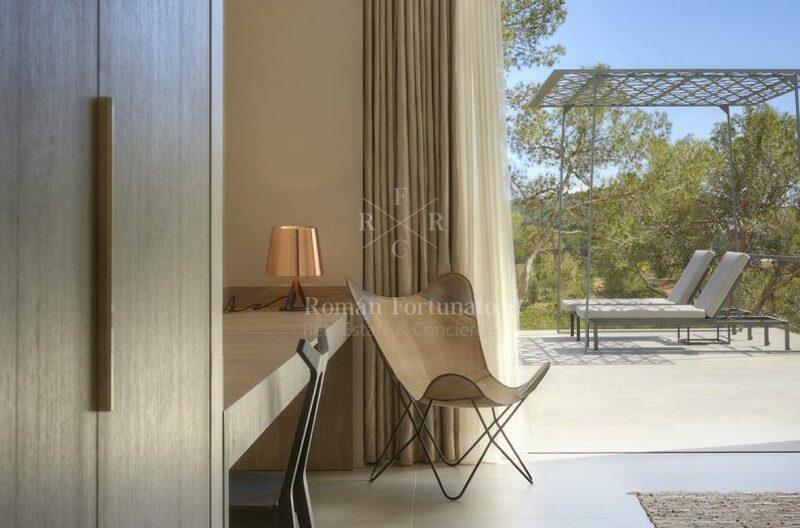 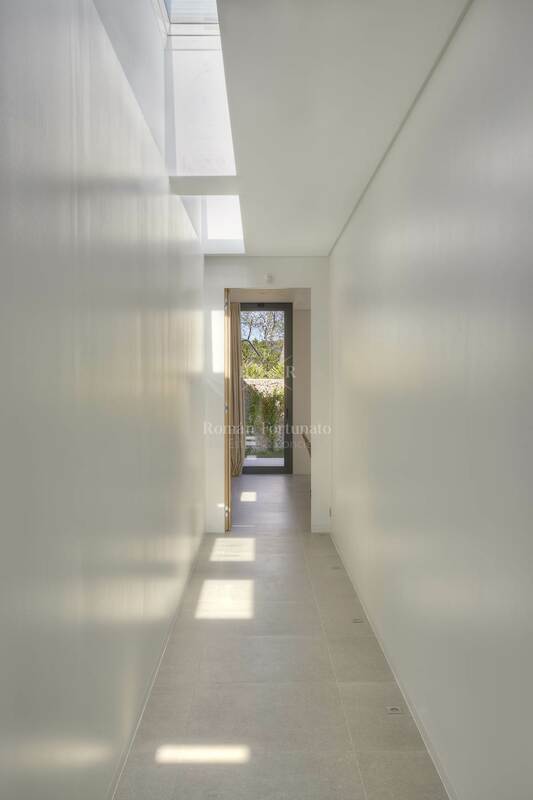 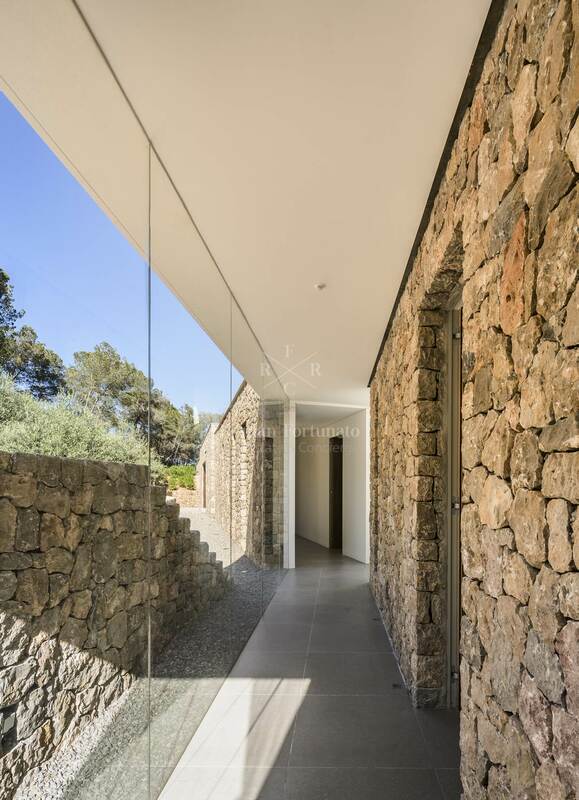 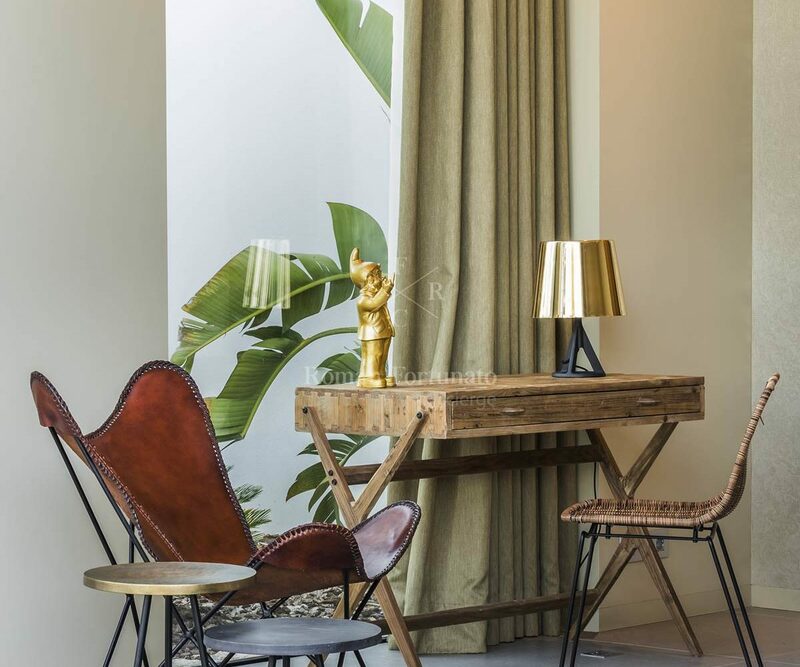 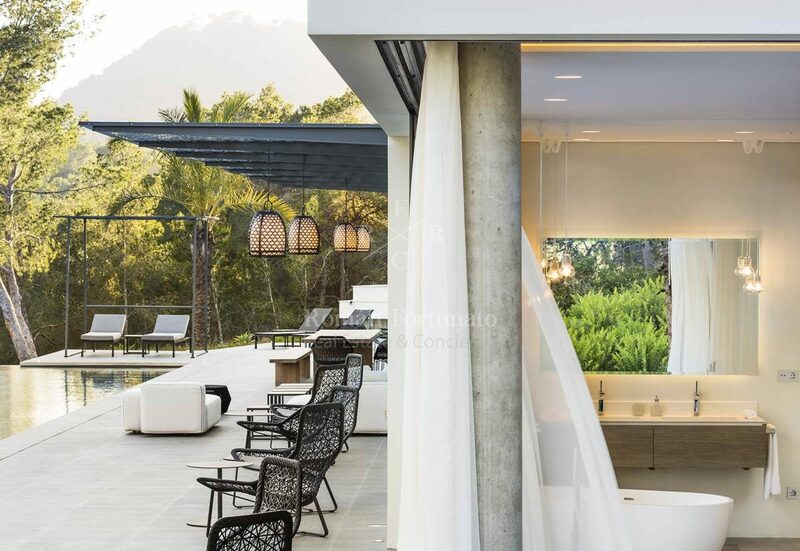 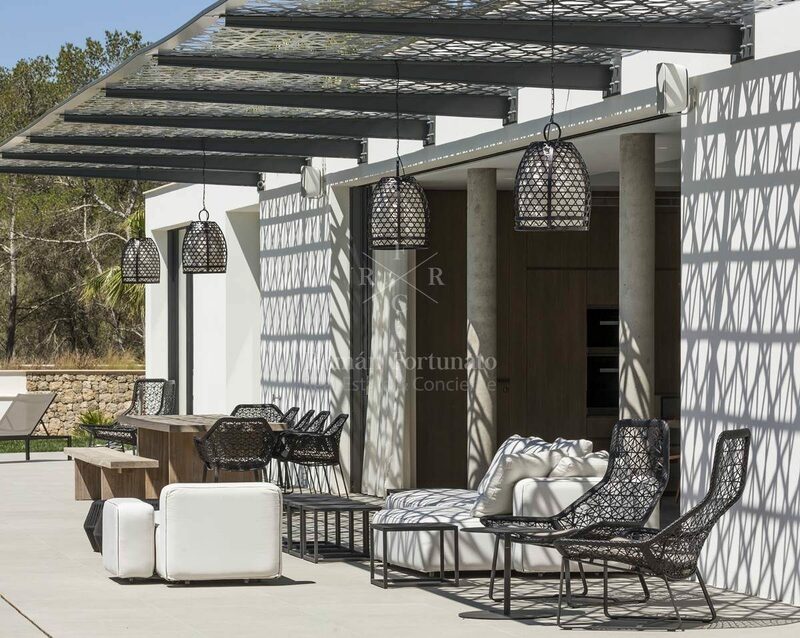 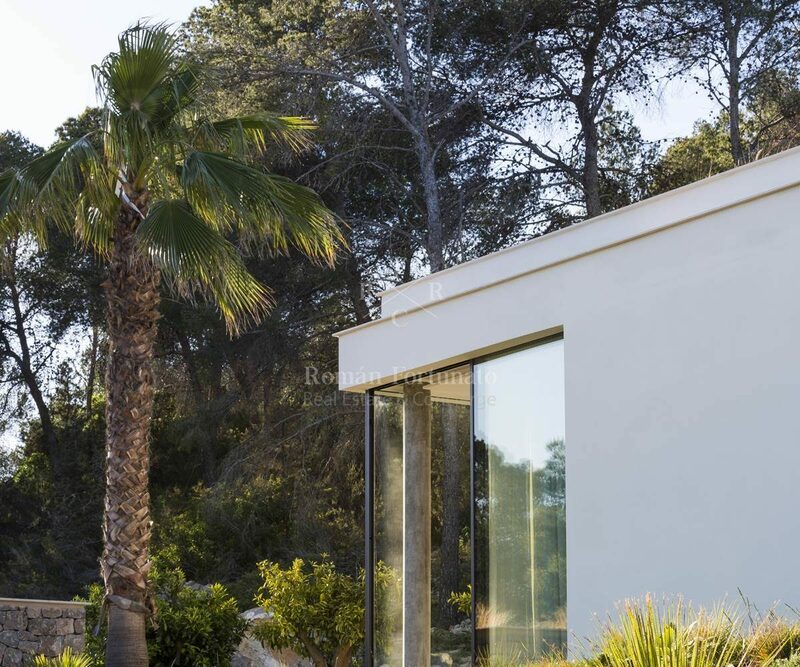 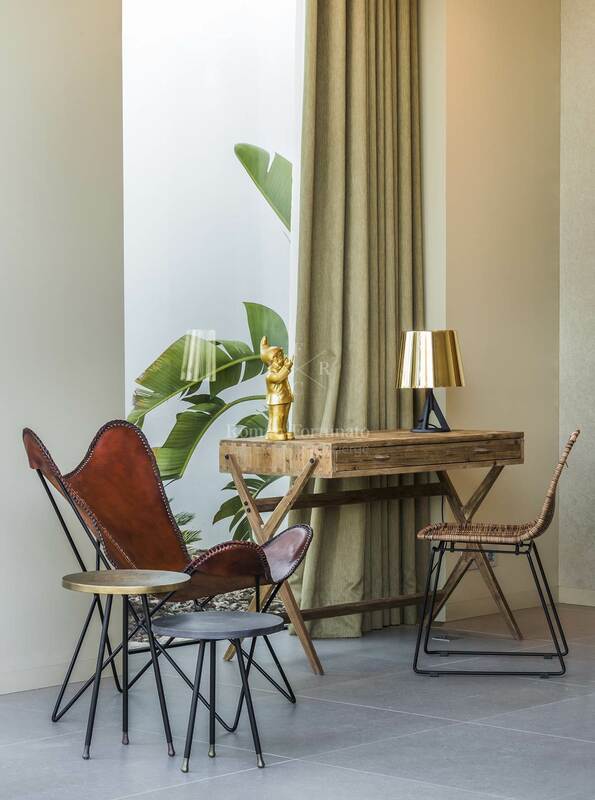 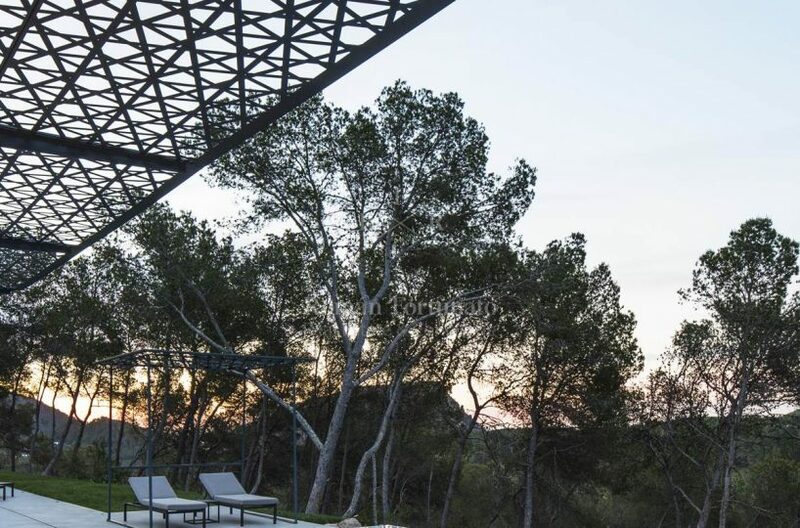 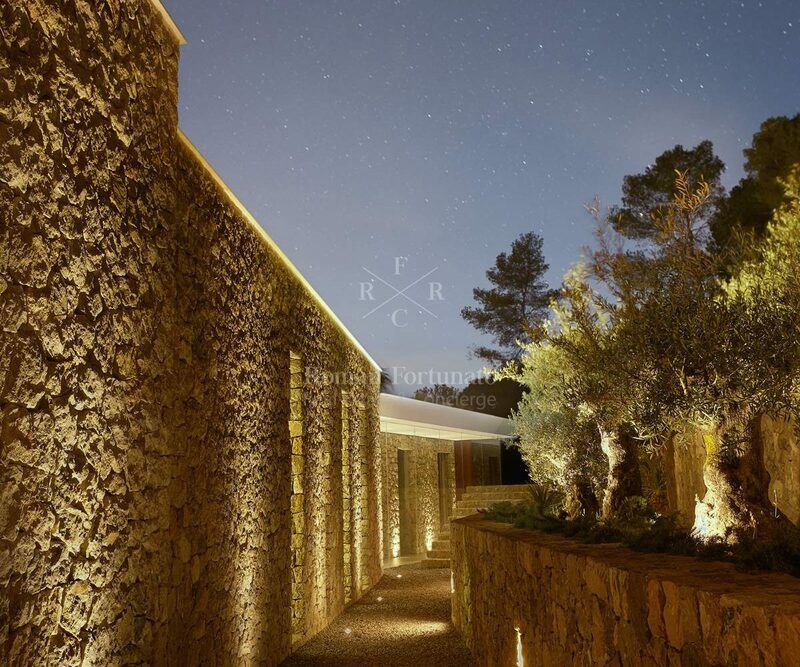 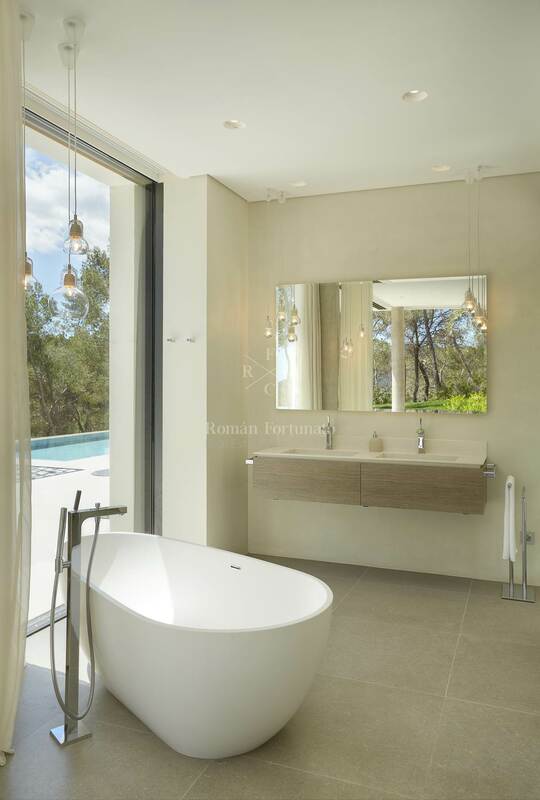 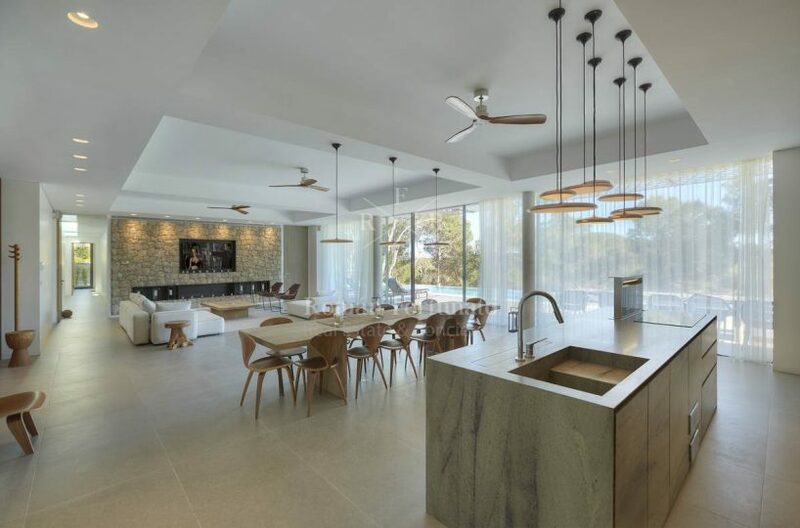 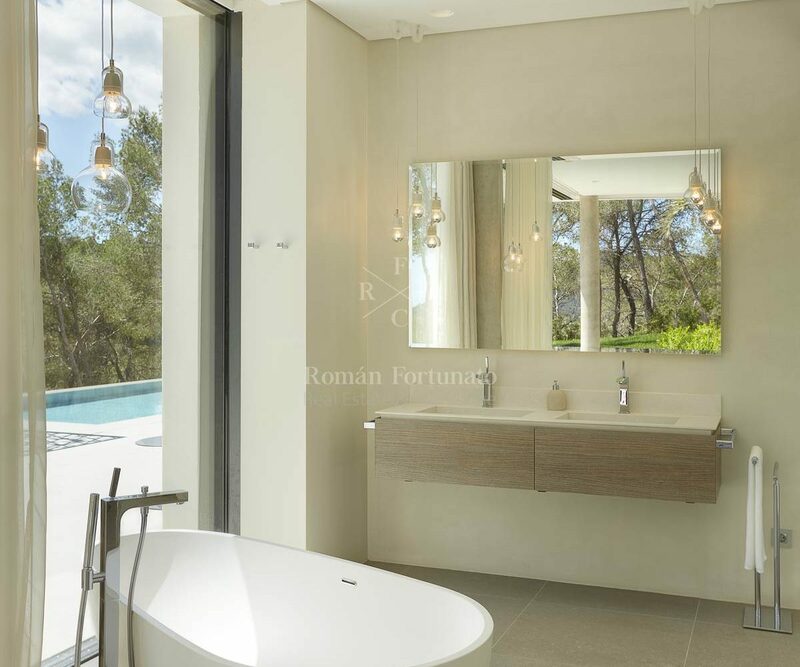 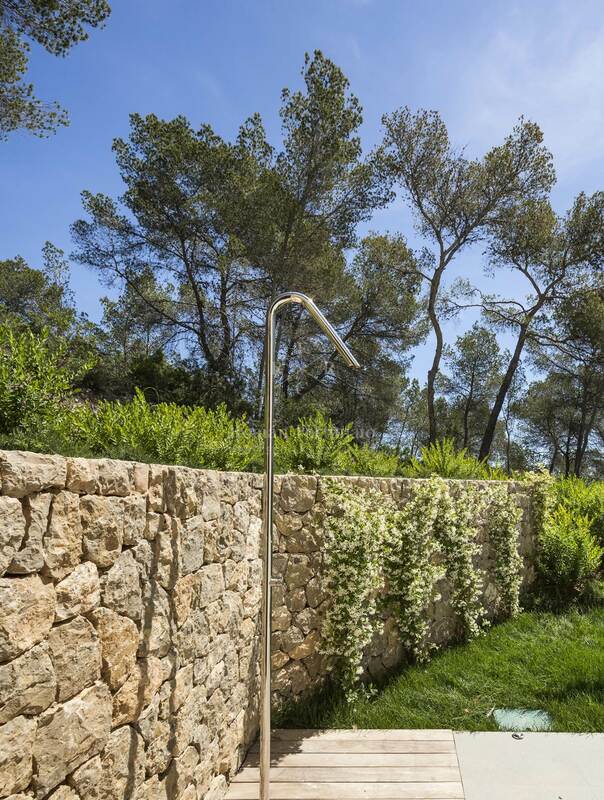 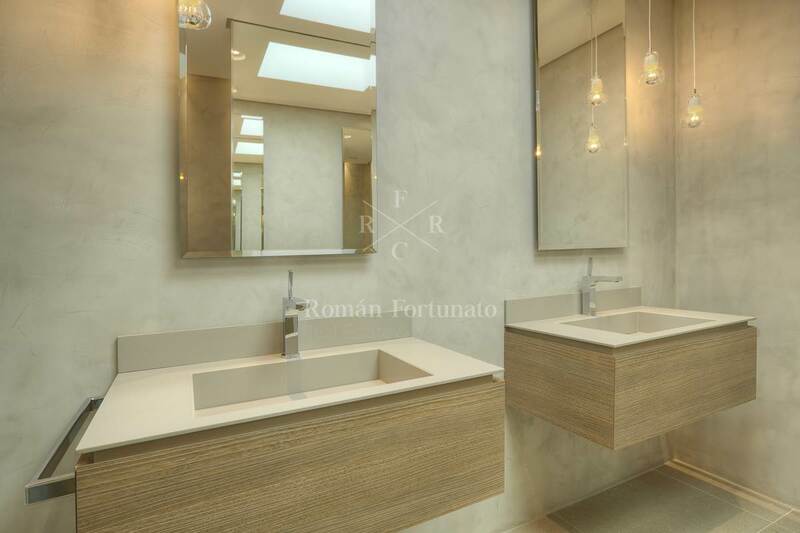 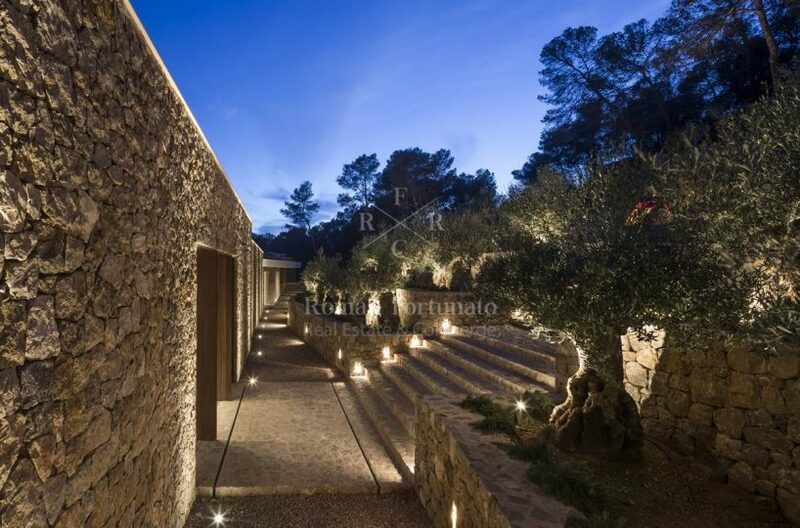 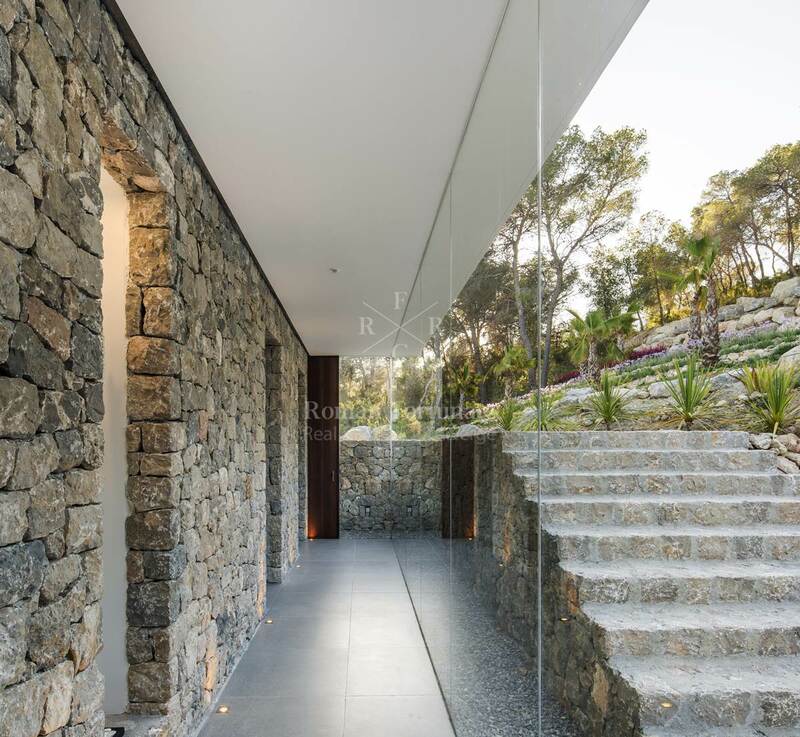 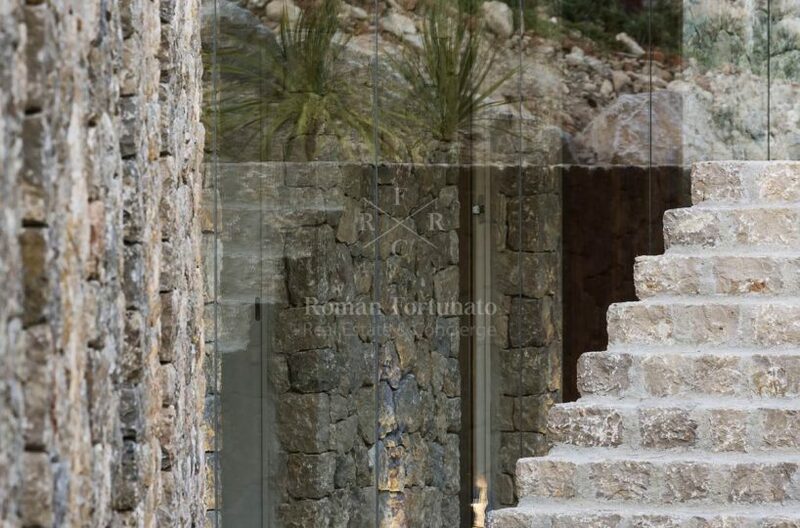 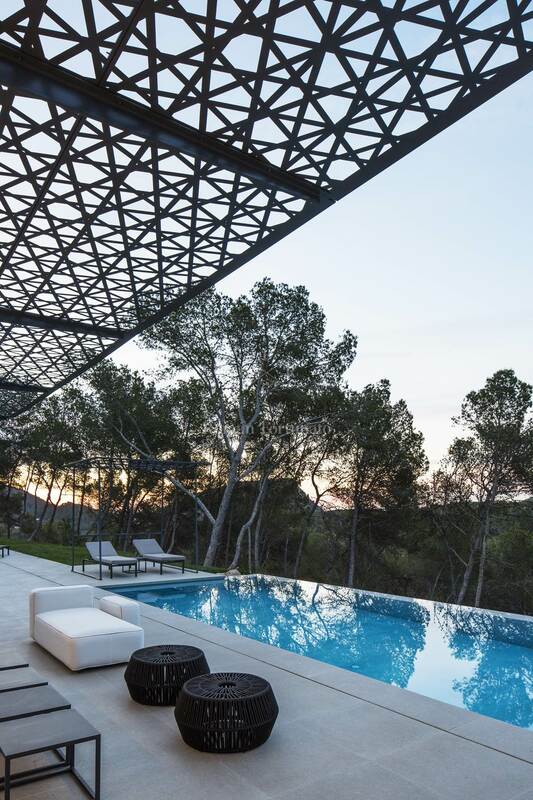 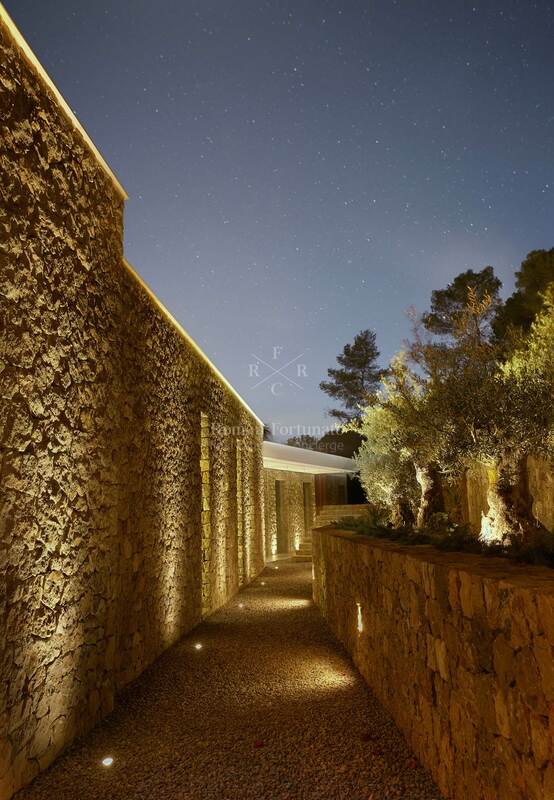 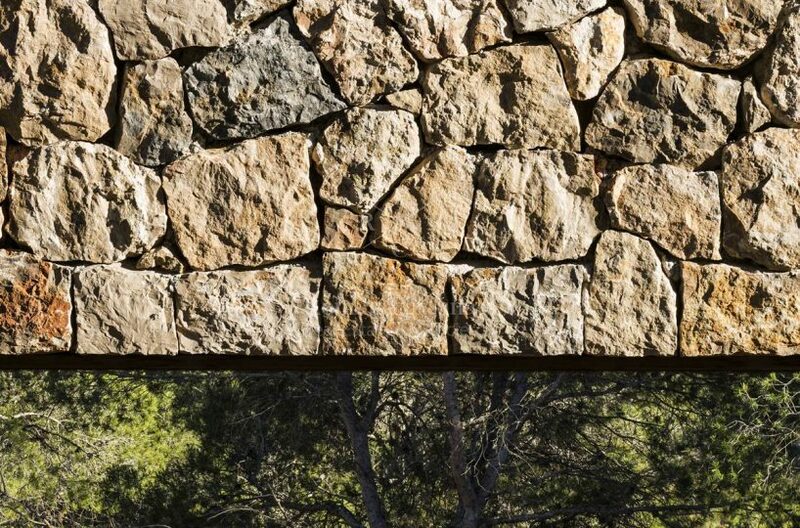 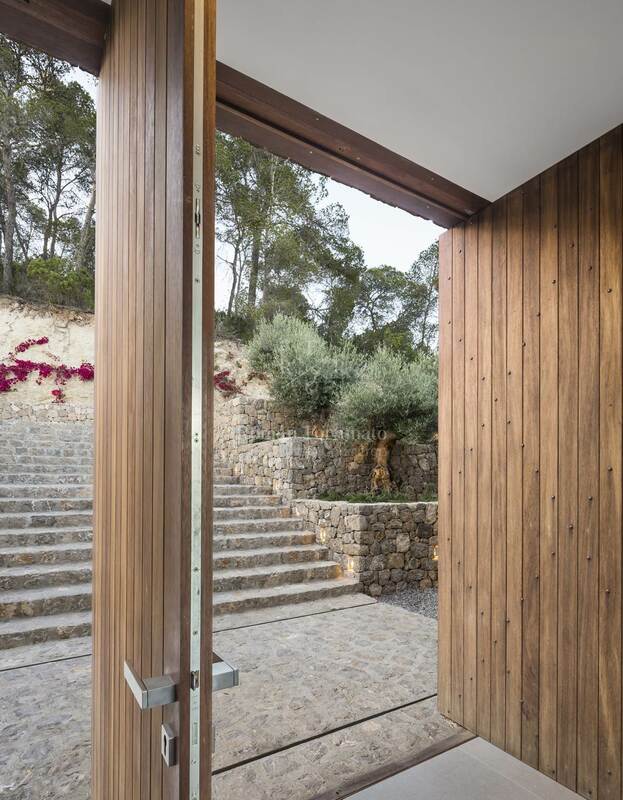 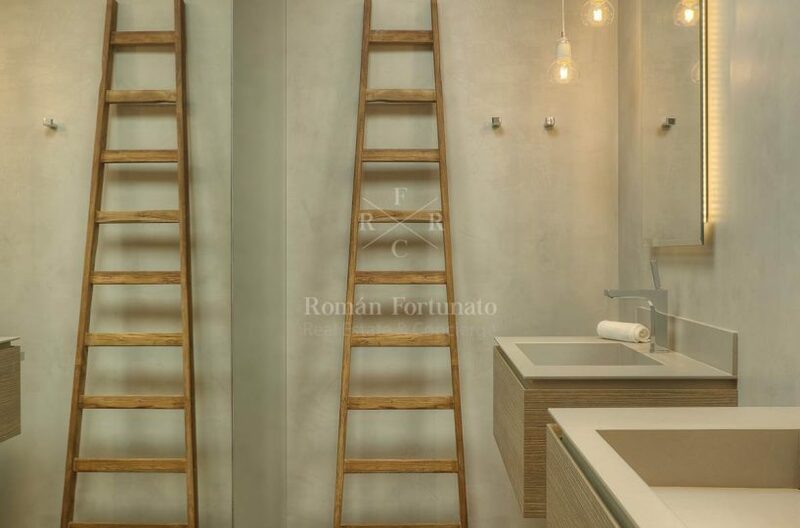 Villa Rock Star is regarded as on of the most exciting new rental objects of the market, providing clients with a subtle blend of earth like materials highly curated carpentry work combined with ctemporary furniture.Only the highest quality materials were used for the construction. 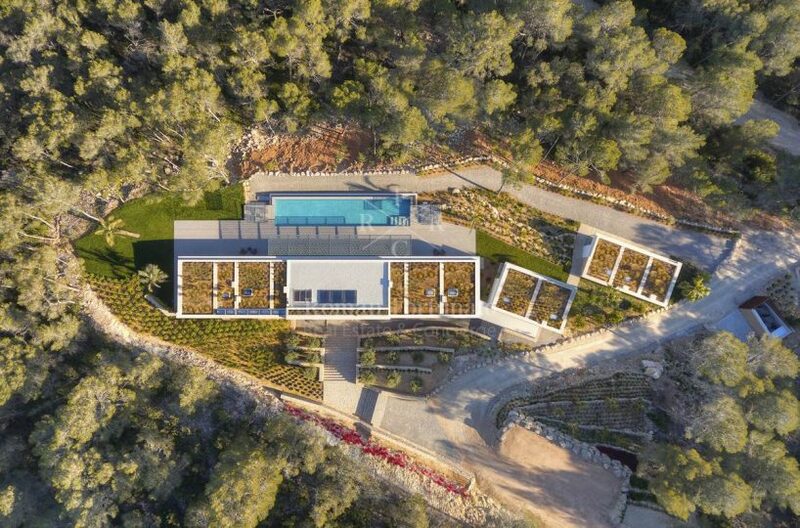 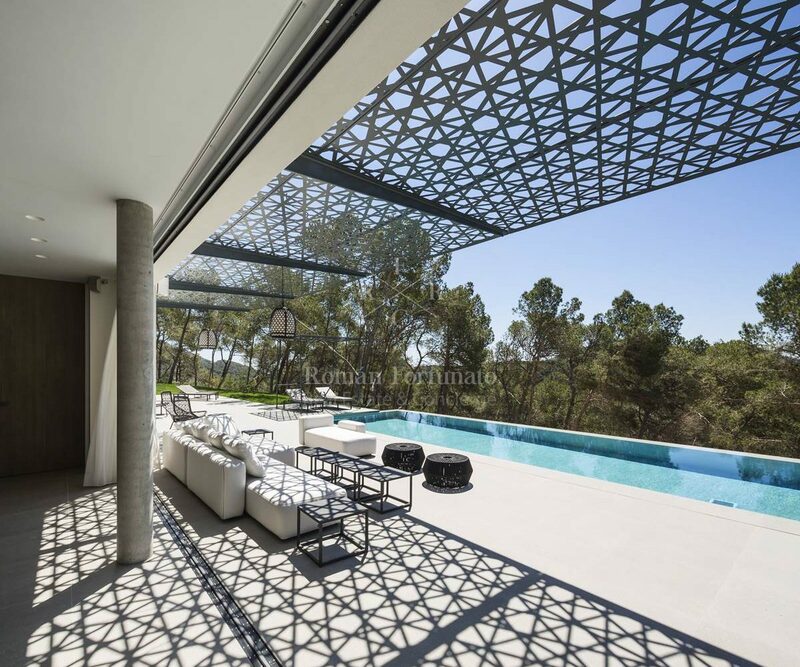 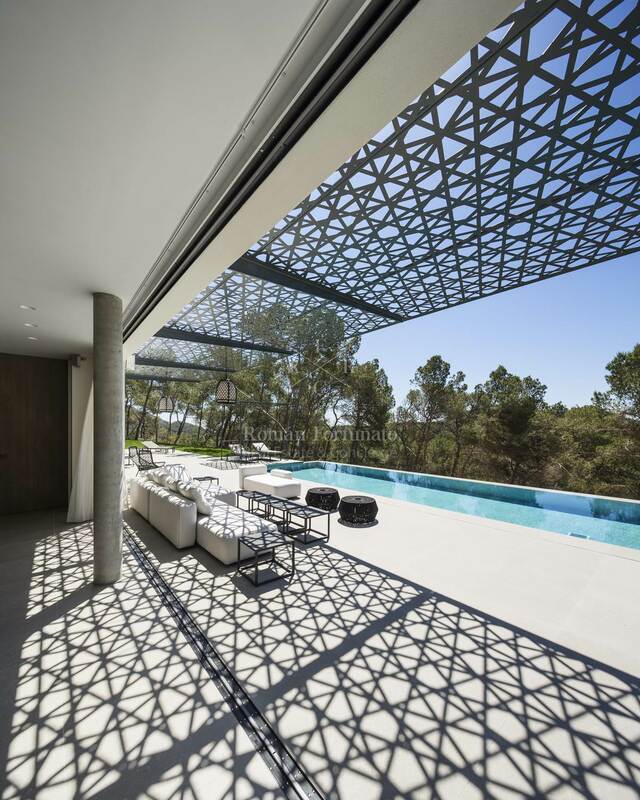 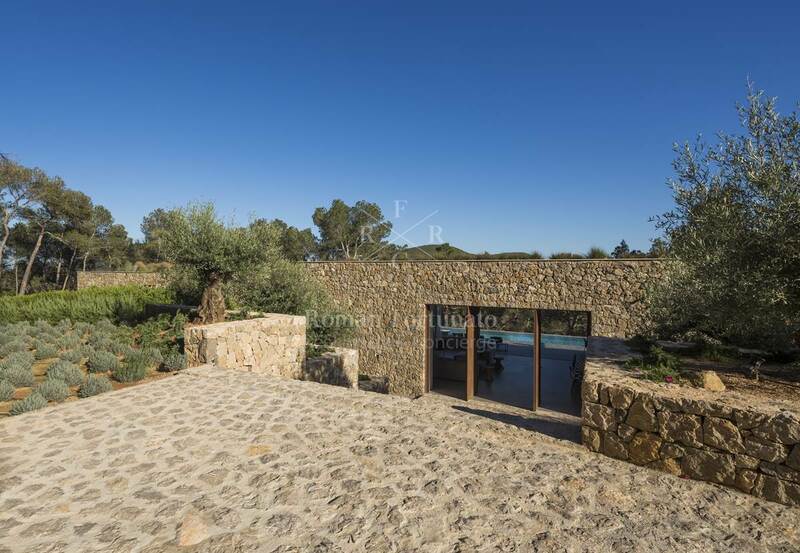 The villa is comprised of 8 generous en-suite bedrooms, on a 3,6 hectar property with an indoor Surface área of approx 770m2 it can host up to 16 guests simultaneosuly. 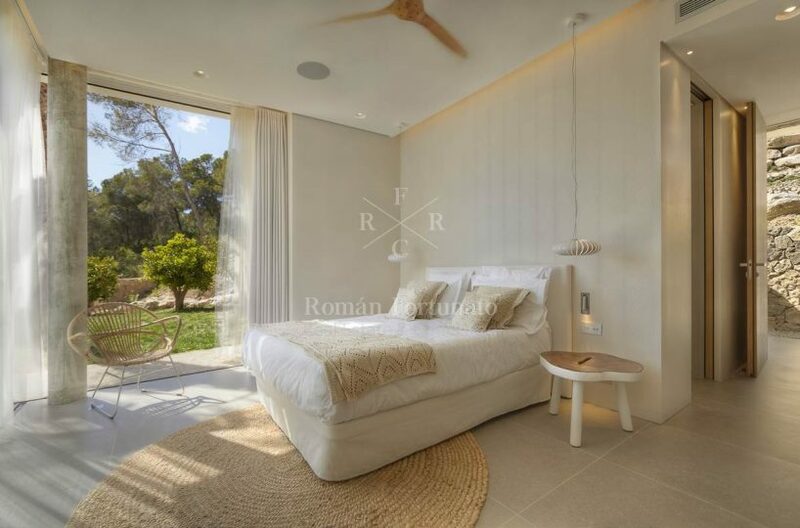 The main villa offers 6 en suite bedrooms, a living room with a fireplace nd a specialized custom-made kitchen (Miele, Siemens, Ice machine, 2 Ovens, 3 fridges, and additional kitchen with a walk in refrigerator room and a guest toilet. 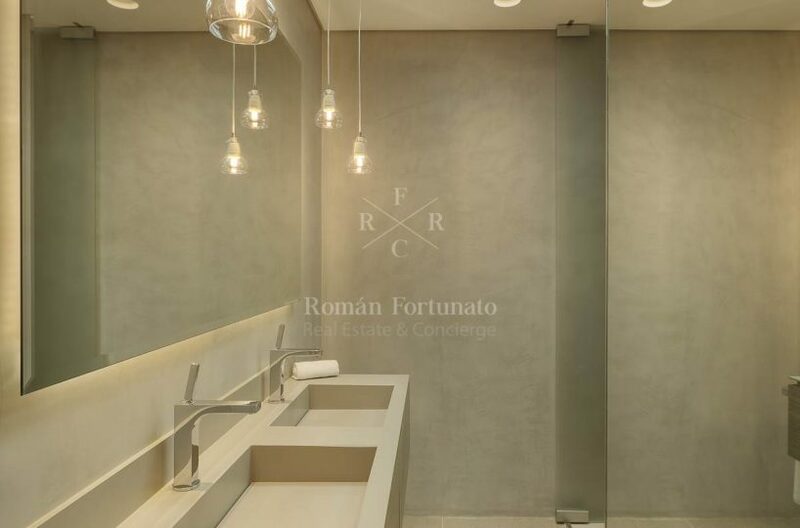 A gym, 2 separate toilets and a maintenance/ laundry room. 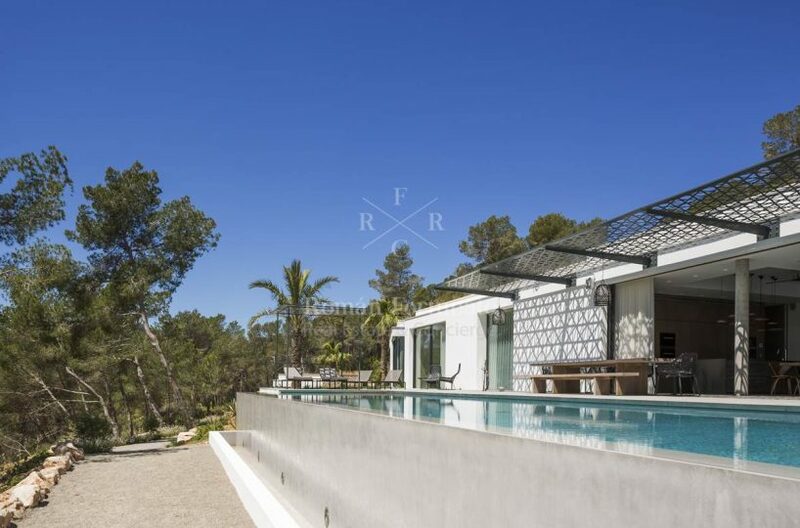 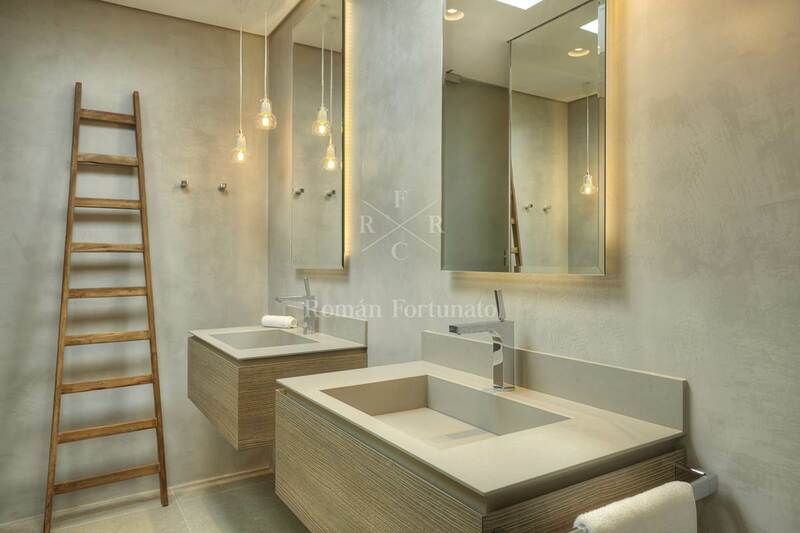 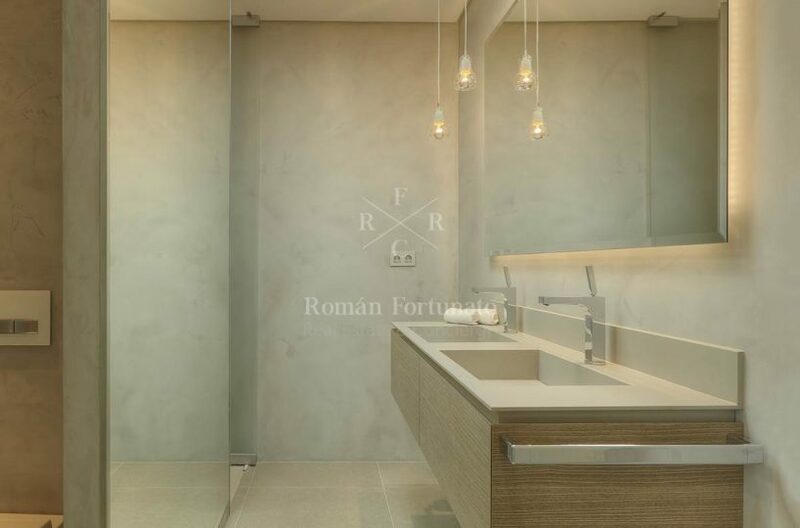 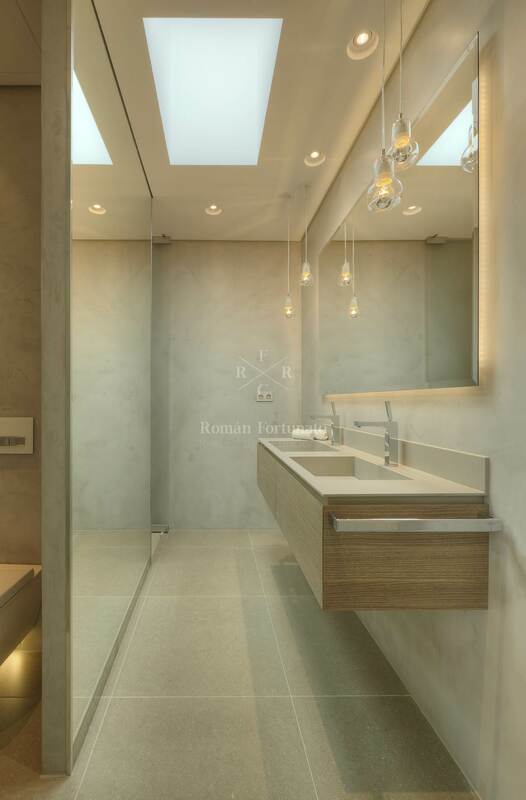 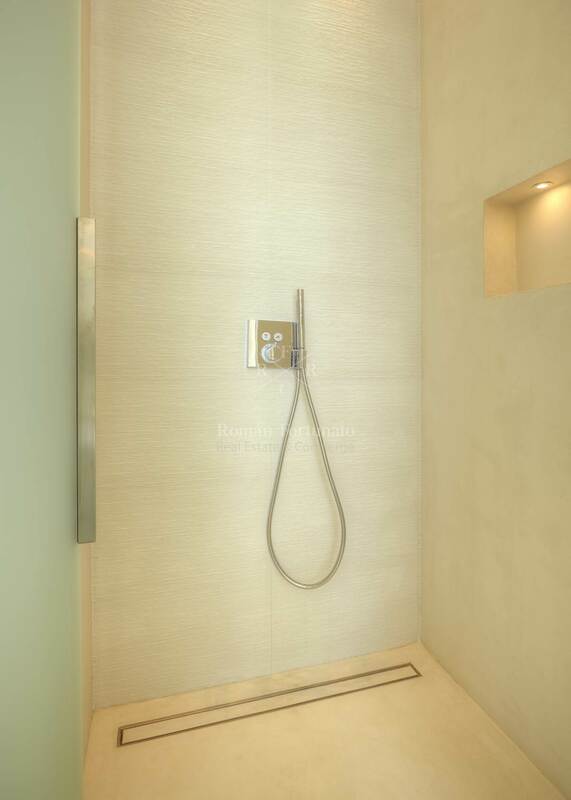 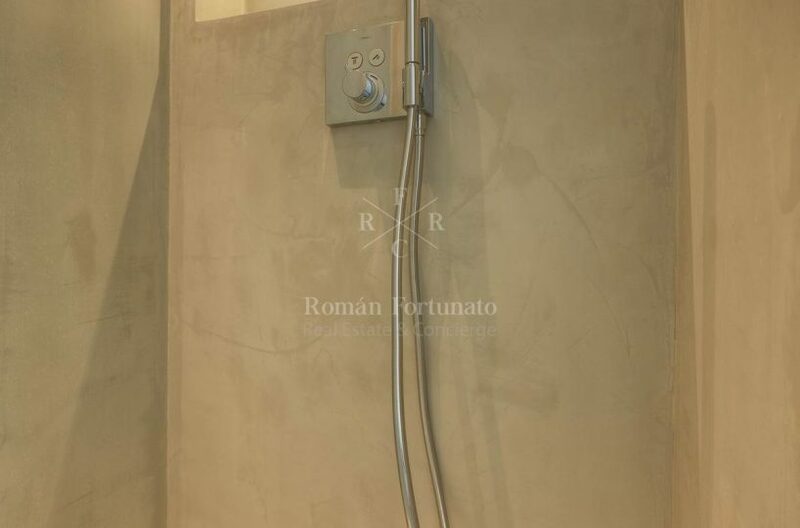 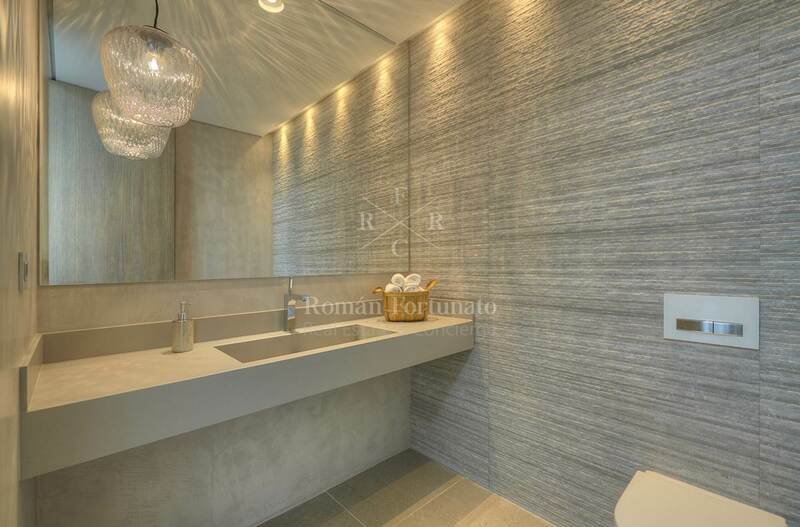 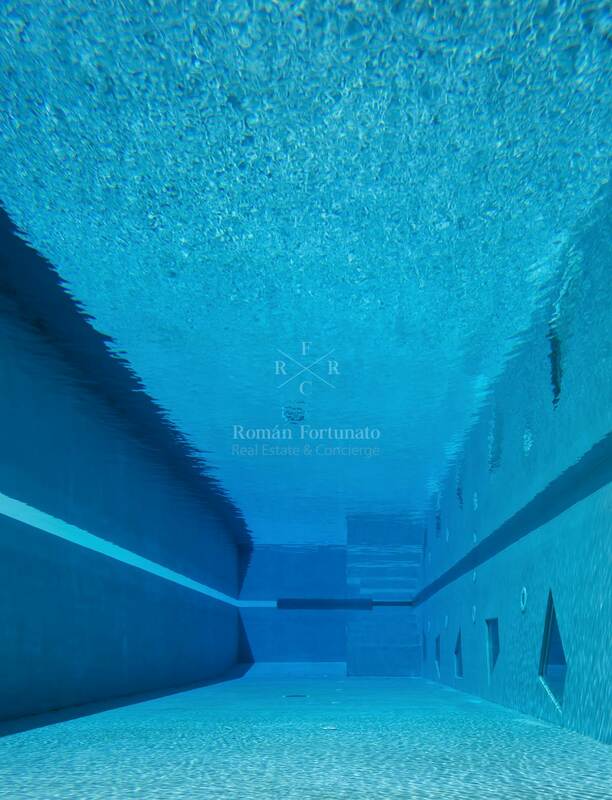 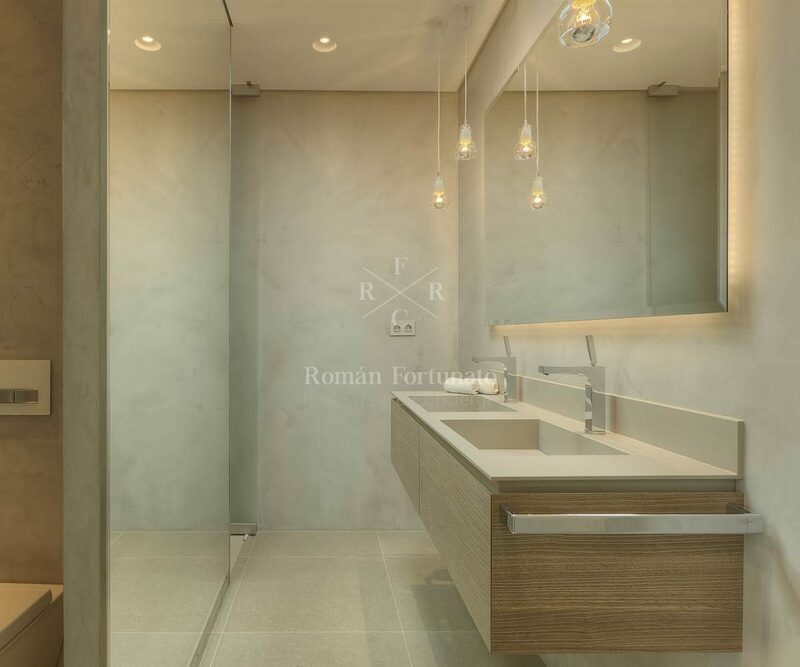 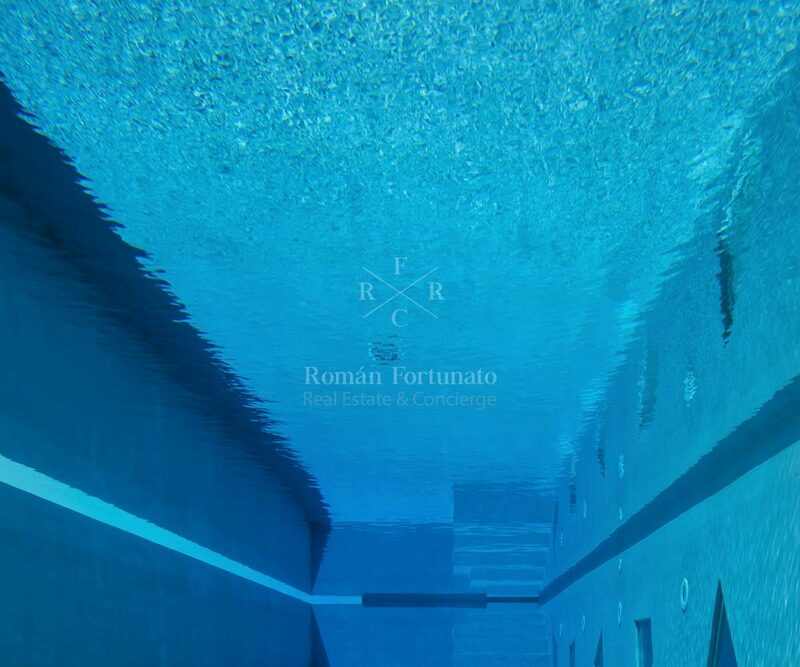 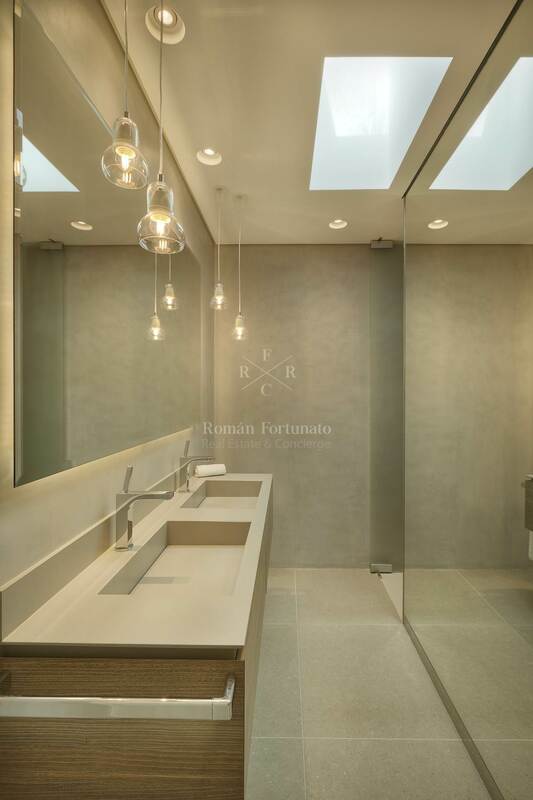 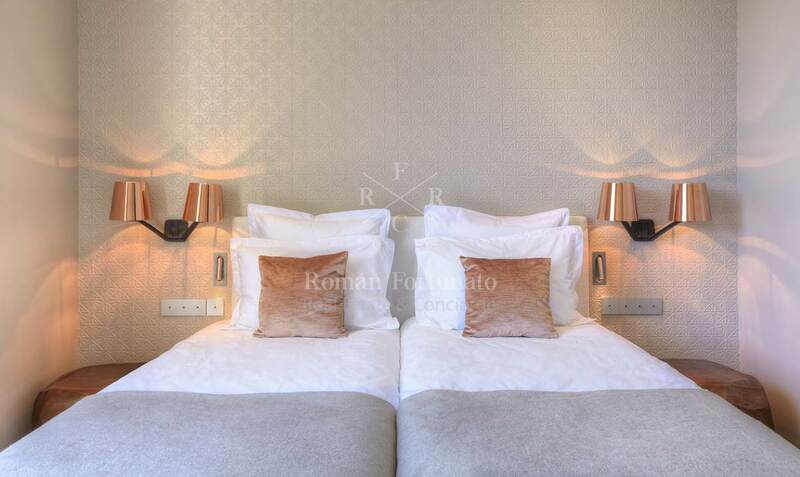 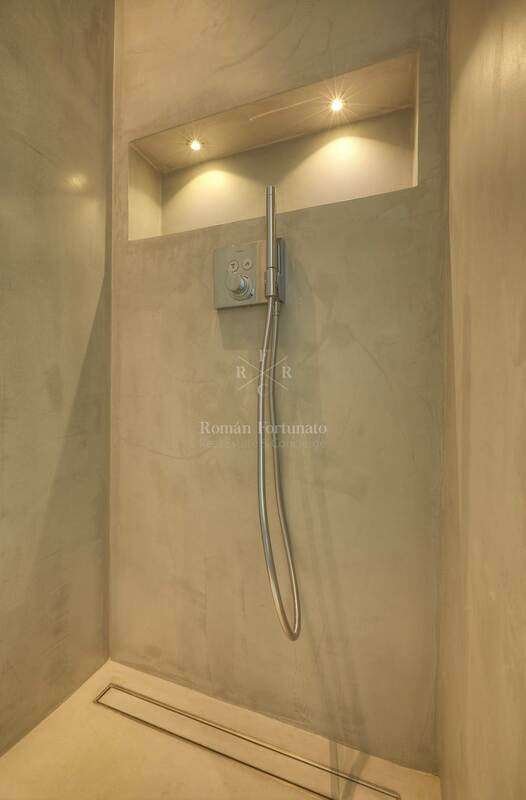 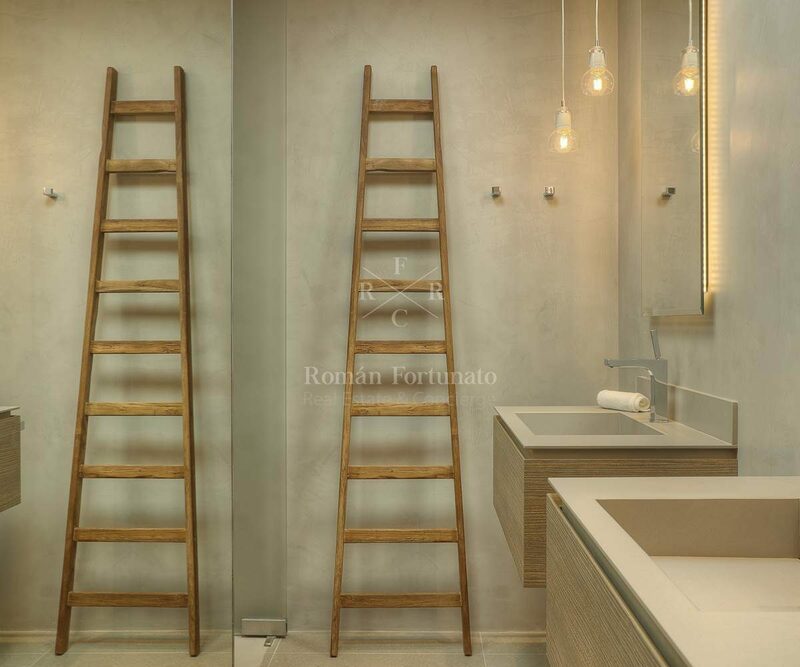 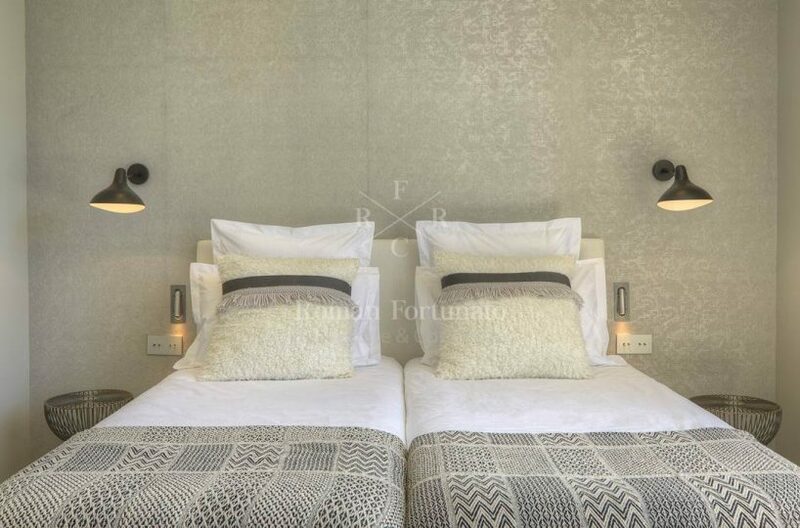 The Rock Star Nº2 is an annex offering guests 2 en . 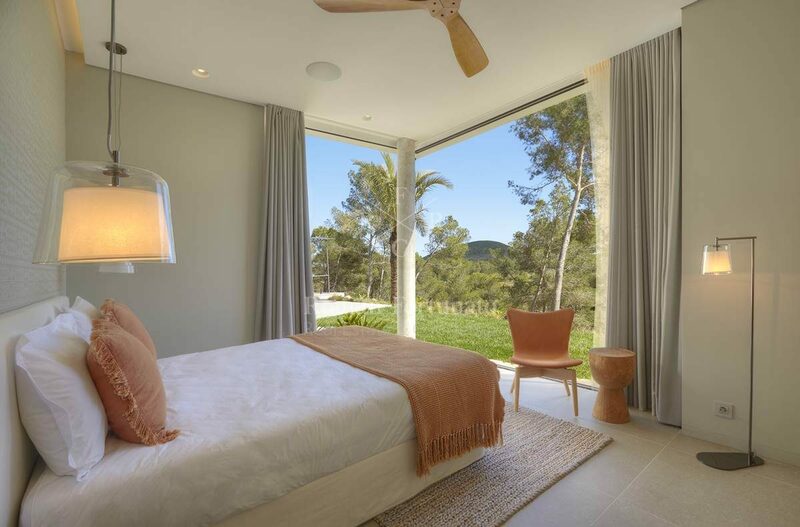 suite bedrooms, Outdoor The ROCK STAR VILLA offers ample landscapingm cultivated lawnsm palm treesm olive and orange tres. 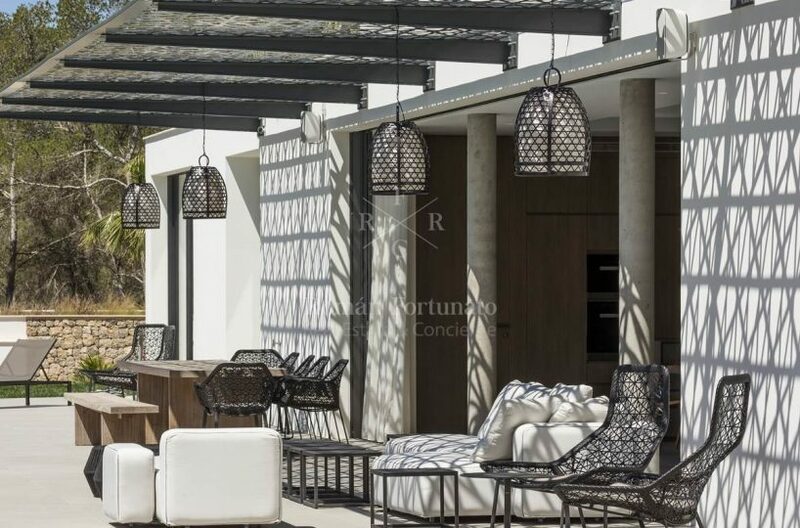 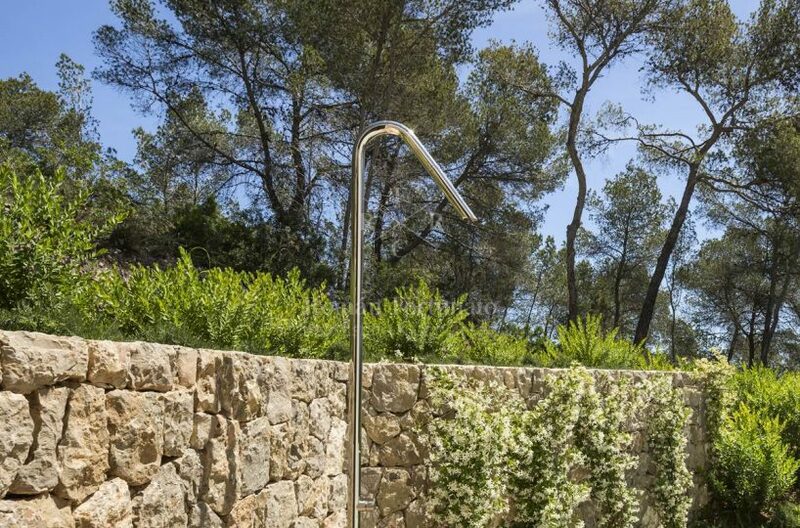 In addition the terraced pool área offers multimple sun beds, an external dining área and private chill-out zones. 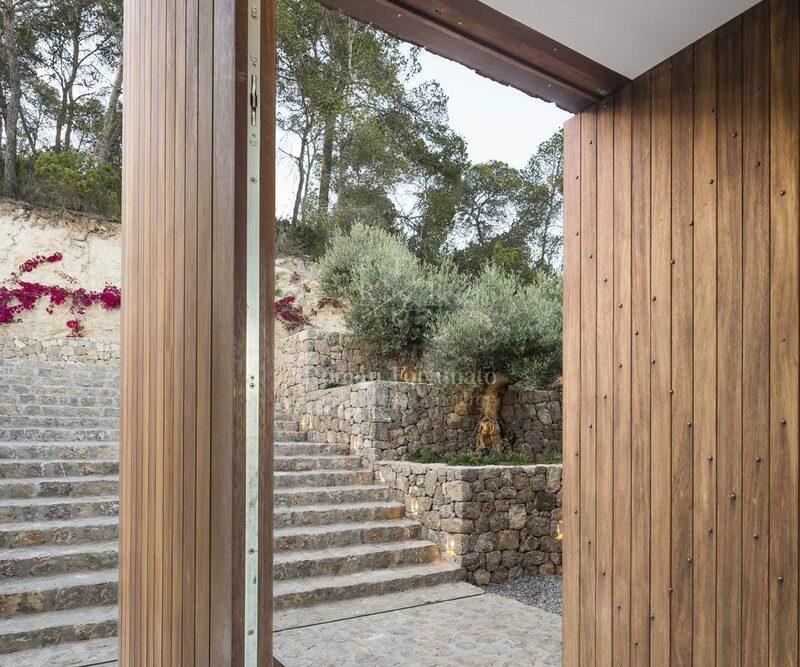 Even if a larger group os staying in the villa privacy can be maintained.